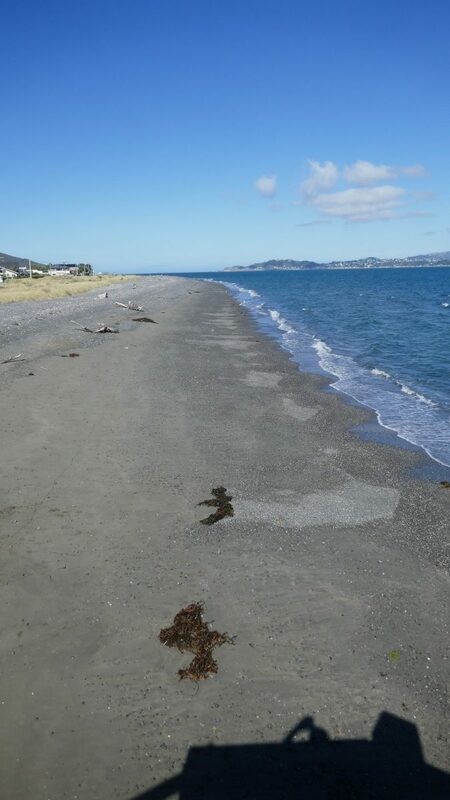 It is a long drive from Auckland to Petone so several members opted for an overnight break at various places. 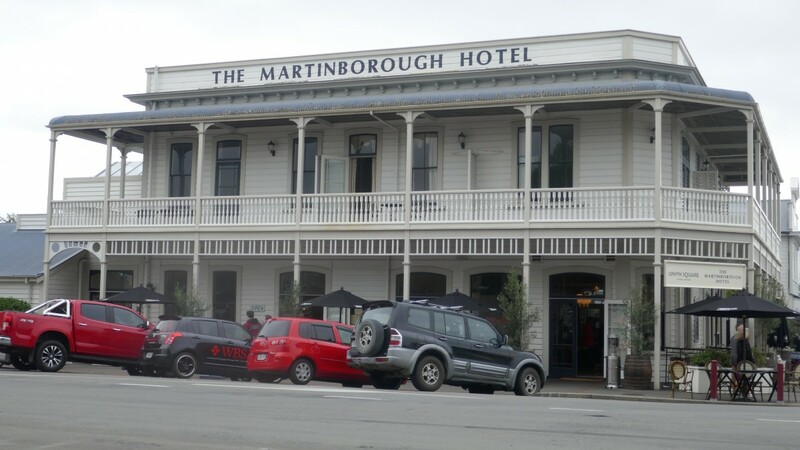 Our little group of three, Marcia, Chris and I, decided we would stay in Taihape – why I have no idea but it seemed as good as any place to stop. 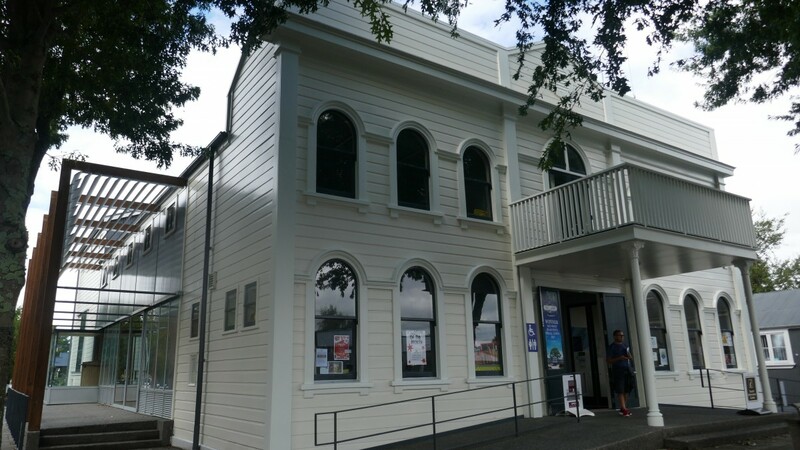 We booked in at the Aspen Court motel who were very customer focused and prior to our visit sent us a ‘how to find us’ and ‘what to see’ in Taihape. The motel was comfortable, clean and suitable to our needs. It was also an easy walk to the town – 10 minutes. We had a lovely meal at the “Le Cafe Telephonique” near the centre of town. 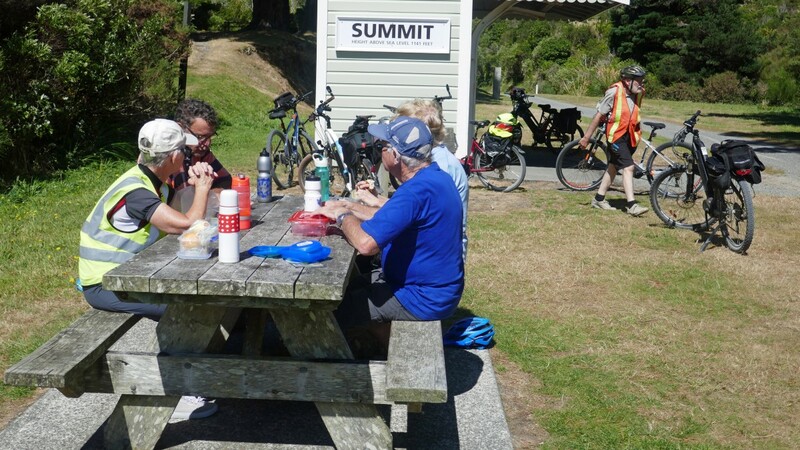 On the way to Petone the following day we stopped for lunch at “The Long Beach cafe” in Waikanae and then on to Petone to catch up with Dave from “Everyone’s Adventure” who was taking care of our bag transfers and our shuttle requirements. Two of our team were hiring E-bikes from his company. 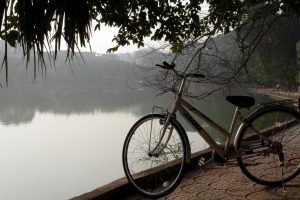 In our group of eleven, five people were riding E-bikes and the rest ordinary mountain/hybrid bikes. 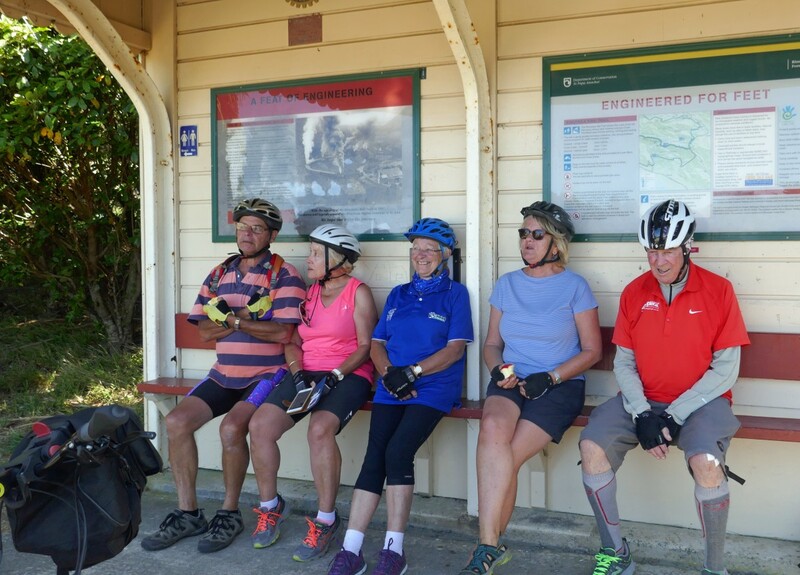 Dave was also going to advise us as to which way we would ride the Petone to Orongorongo beach via Pencarrow – it was very much wind dependant, and he would shuttle us and our bikes either to Orongorongo beach to start from there or pick us up after our ride from there. 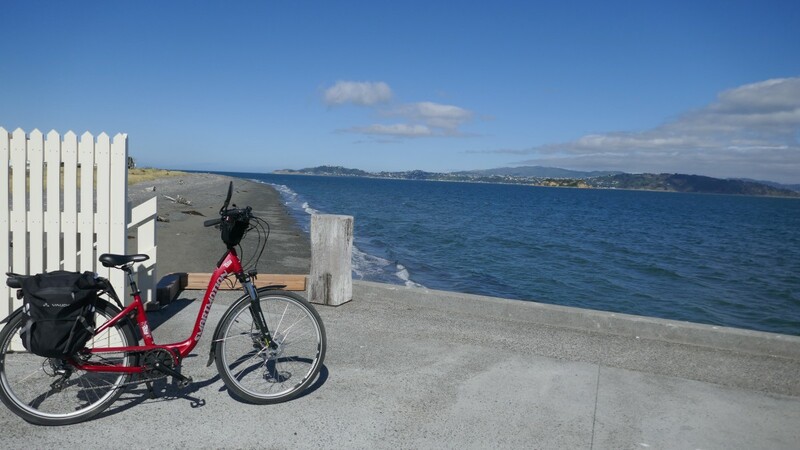 Day ONE – 33.5 + 5kms: Petone Top 10 Holiday Park to Orongorongo Beach carpark plus an extra 5km return ride to Turakirae Scientific Reserve and the seal colony. 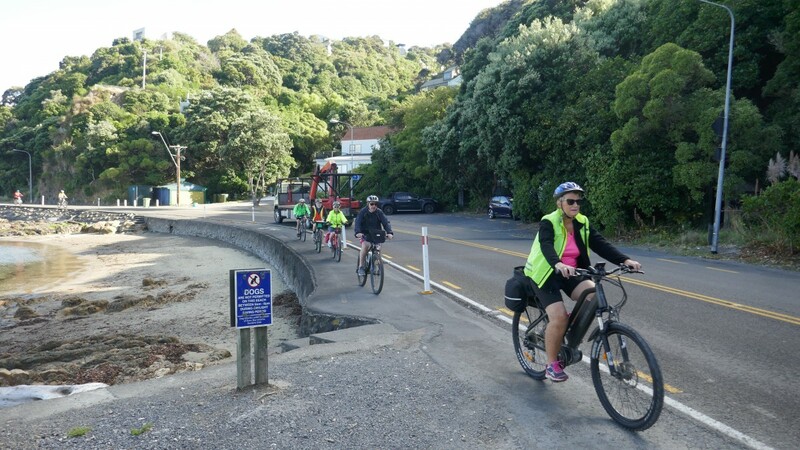 We woke to a beautiful sunny day in Petone – everyone was out early fiddling with their bikes ensuring tyres were pumped, saddles were the right height, batteries charged and plenty of food and drink tucked away in pannier bags. Dave from Everyone’s Adventure, arrived at 9am with E-bikes and maps. 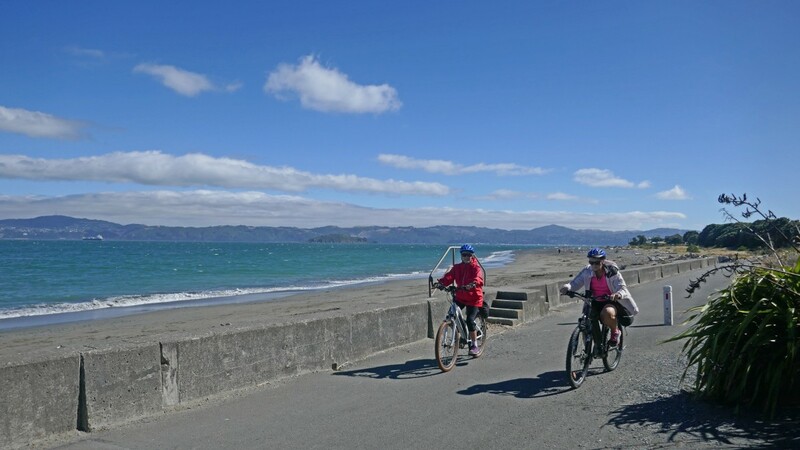 He suggested we should ride from Petone to Orongorongo beach as the wind would be behind us and he would pick us up from Orongorongo Beach at 16:30. 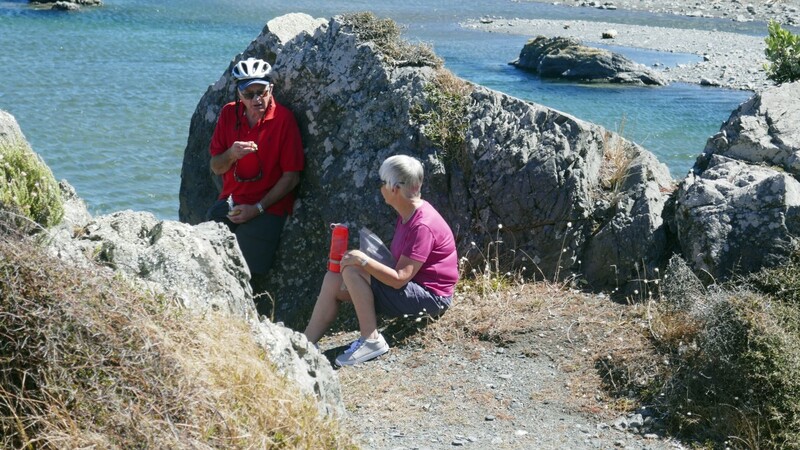 He took Chris & Helen, who had hired the e-bike, though their paces and took us through the cycle route telling us to keep the sea on our right and stay as close to it as possible. He also suggested we have coffee before we get to “The Bike Shed” beyond Eastbourne as that is the last place on this route for food and drink. 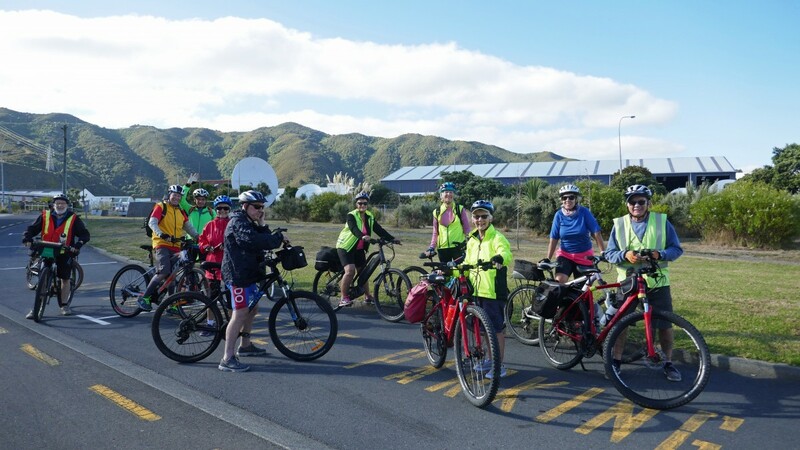 Armed with our maps eleven riders set off from Petone Top 10 negotiating a very busy roundabout and turning into Waione St to the Hutt River bridge where we joined the Hutt River cycle trail turning left towards Marine Drive. Safely across the roundabout and onto the bike path we relaxed. 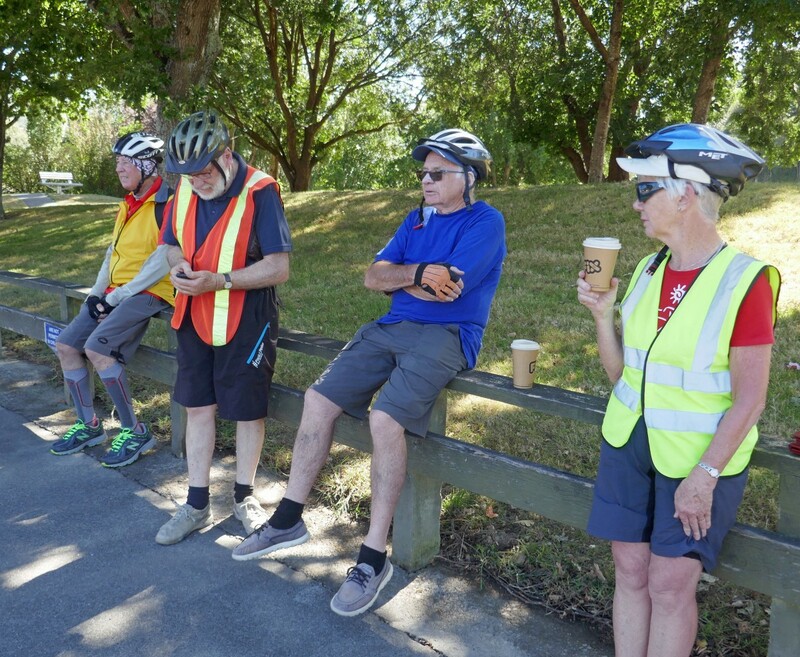 However, there were several areas where we had to ride along the busy roads and on footpaths before we got to Eastbourne where we stopped for coffee. 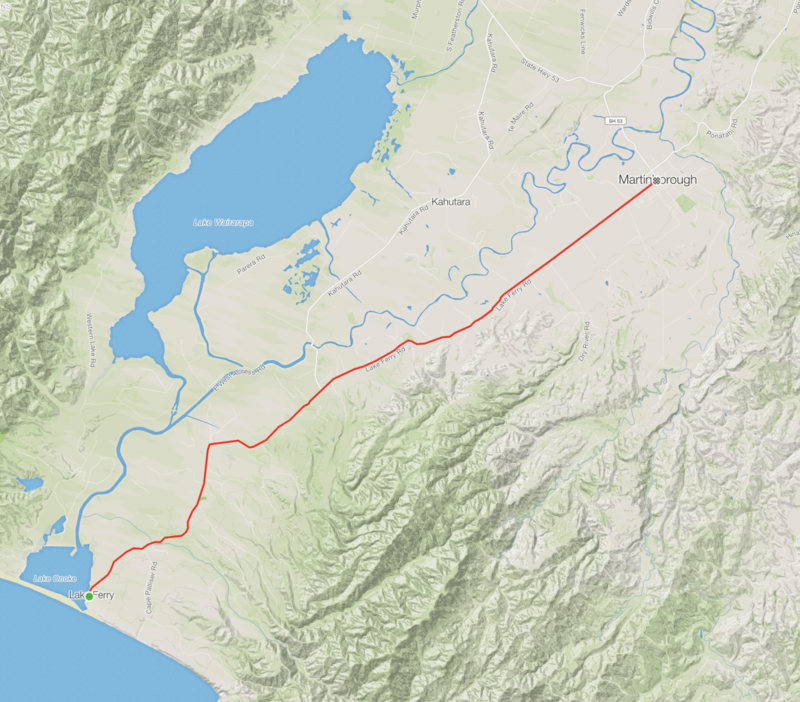 We passed Seaview, Point Howard, Sorrento Bay, Lowry Bay, York bay, Mahina Bay, Sunshine bay and Days bay with its boatshed and on to Eastbourne – 9.6km where we heeded the advice give and stopped for coffee. 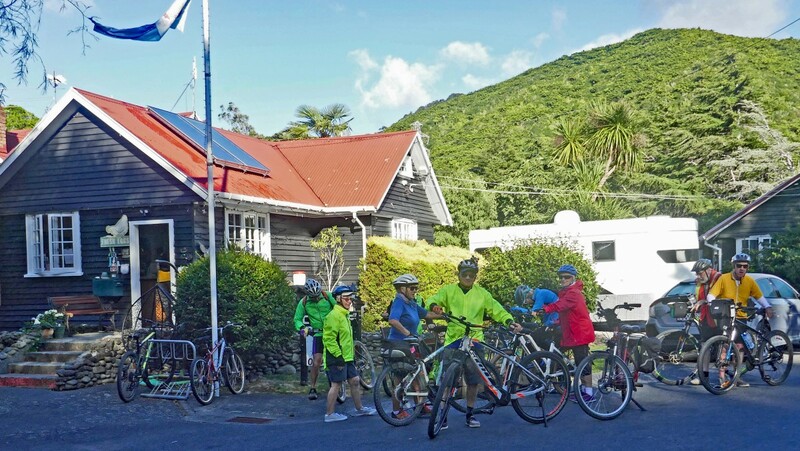 Energised by coffee we headed towards Pencarrow stopping at the ‘Wahine Memorial’. This is a memorial represented by one of the restored masts from the Wahine – it’s foremast – and is situated on the beachfront south of Eastbourne. A plaque remembers the 51 people who died on the day, most of them died along the Eastbourne/Pencarrow coastline where we were riding – a somber thought. 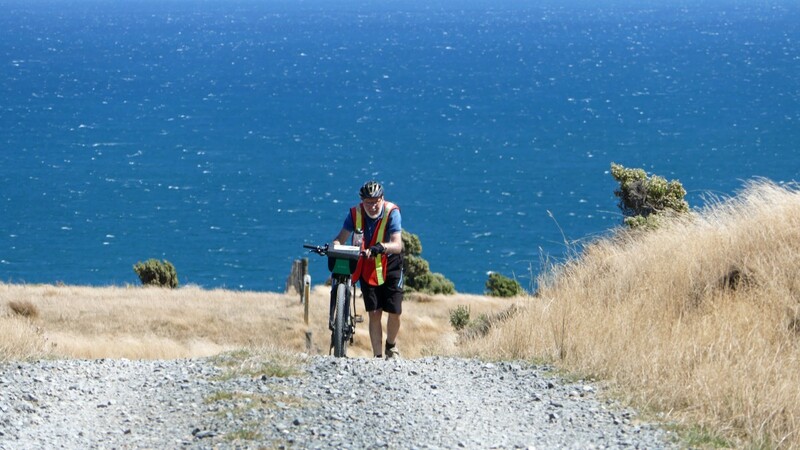 Next we passed Dave working in ‘The Bike Shed’ on Muritai Road – one of the last bastions of civilisation before starting on the isolated part of the track.` This is where the beautiful scenery started, the trail was isolated, scenic and safe – and we loved it, what a way to go. We rode through what was the old Burdan’s gate (where one once had to lift the bike over) but now has a ‘bike squeeze barrier’ built in 2018 which makes life easier especially for us E-bikers with our heavy bikes. 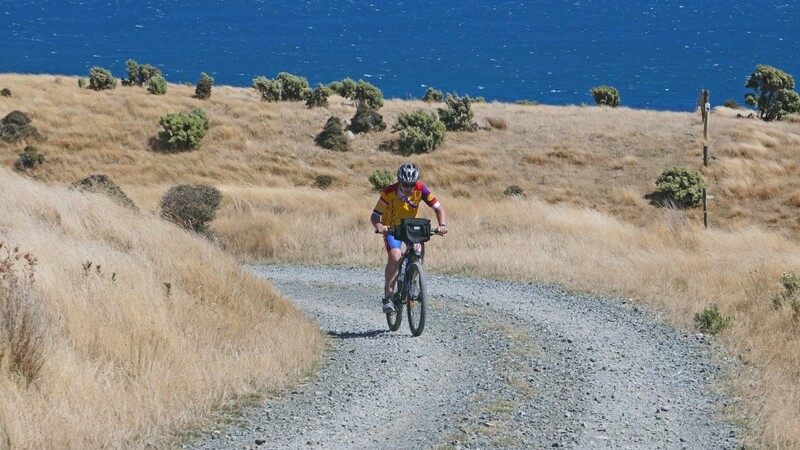 We were now riding on the gravel road which was very smooth and easy to ride on and also very flat! The coastline, on our right, was wild and very exposed which is why you need to have the wind behind you to enjoy the ride. We met some cyclists coming the other way and they were all rugged up and looked very weary fighting the wind all the way. 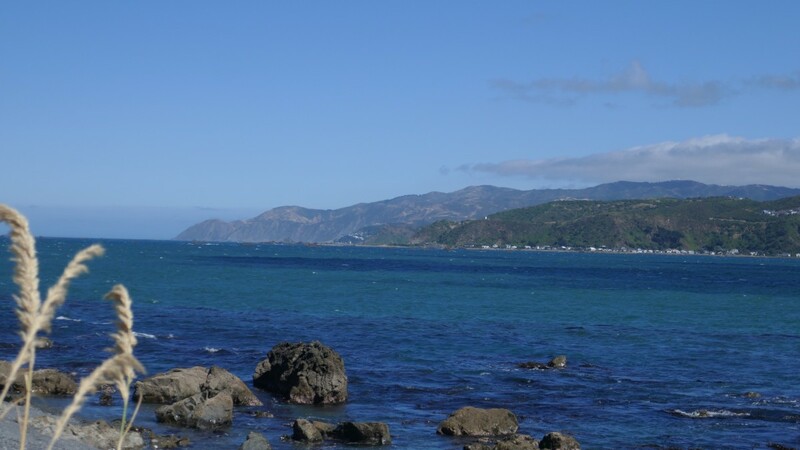 The coastline is infamous for fierce southerly storms that whips the surf onto the coastline and the huge swells from the Cook Strait which can push boats/ferries onto the rocks. 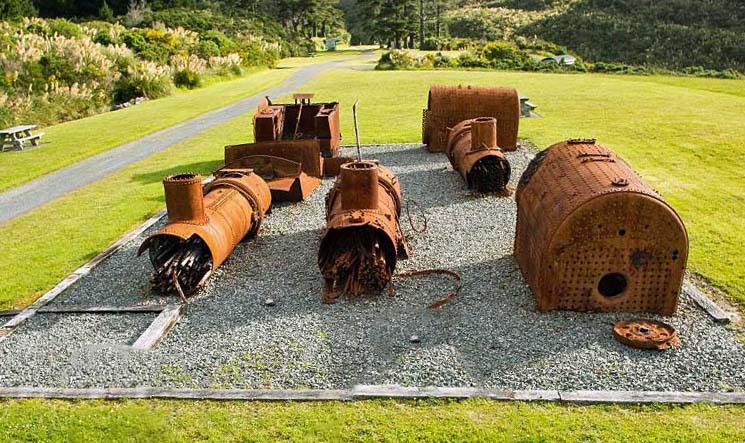 About 2km along the Pencarrow coast road, east of Lake Kohangatera, the remains of the small steamer “Paiaka” lies beside the road. The ship was wrecked on 9th July 1906. 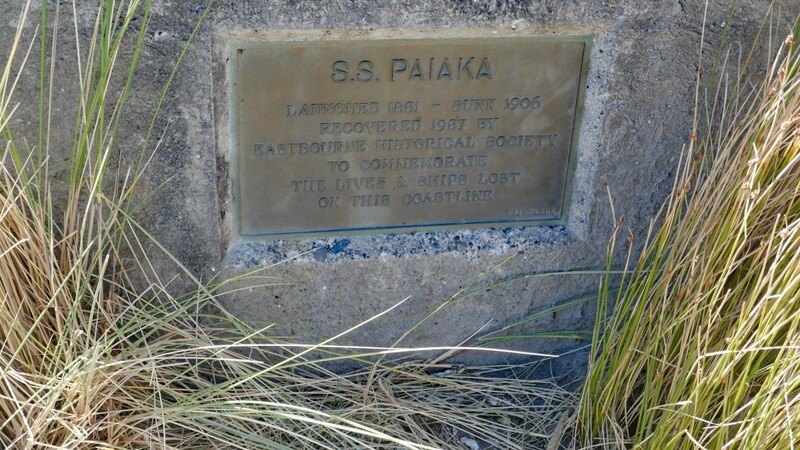 The SS Paiaka was built 1881 and sank in Fitzroy Bay between Pencarrow and Baring Heads, just outside of Wellington Harbour. 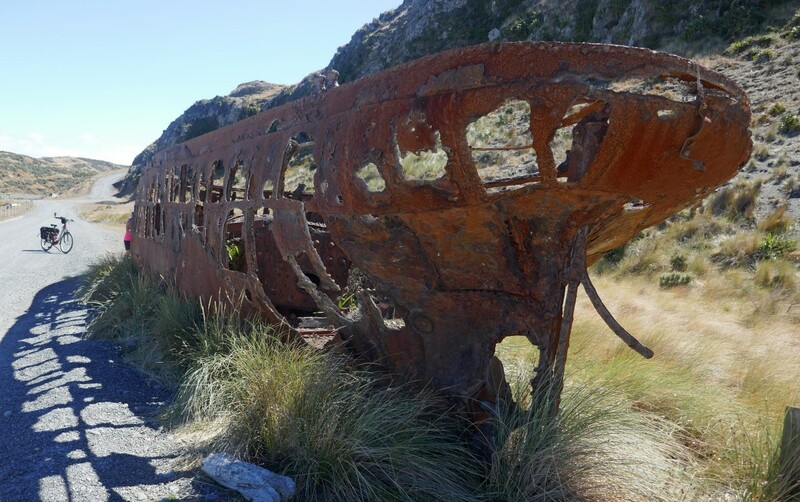 It was salvaged in 1987 and brought ashore to its present position to become a memorial to commemorate the lives and ships lost along this coastline. 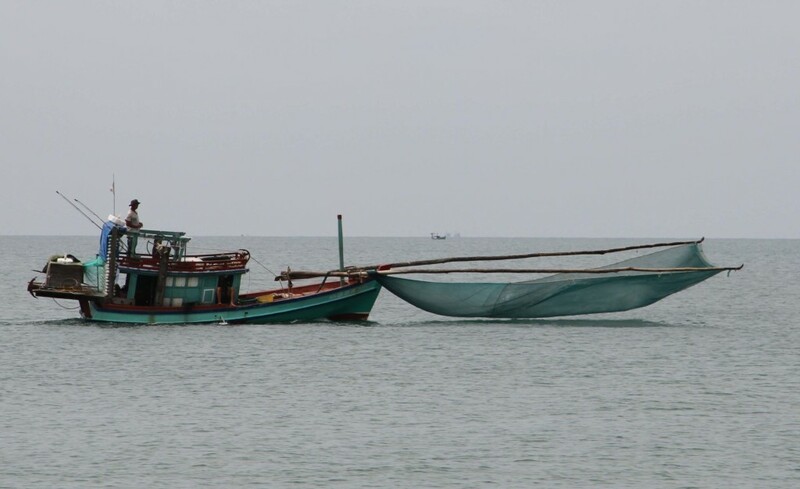 Luckily there were only 2 people on the boat when it sank during a north/north-westerly hurricane but they survived. On this wild and rugged coast between Eastbourne and Baring Head there have been at least 40 shipwrecks recorded – most have disappeared. 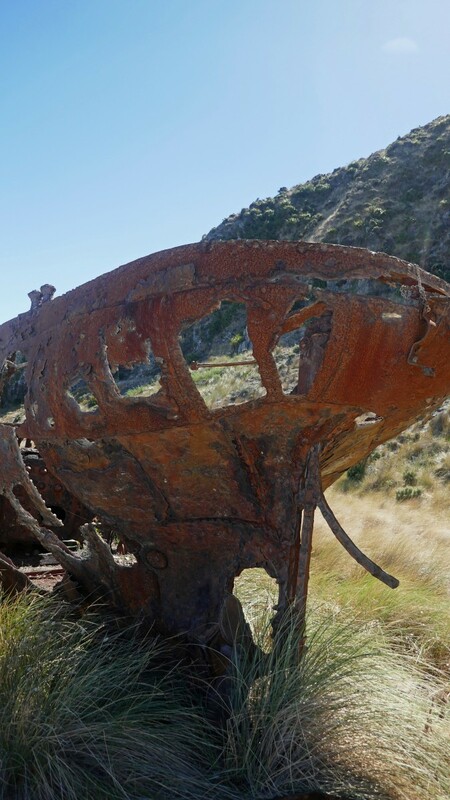 Having just passed the Wahine memorial and then the SS Paiaka it was a strong reminder of what a perilous harbour entrance Wellington has and how cruel the Barrett Reef can be, it was on this reef that the Wahine met its demise in April 1968. 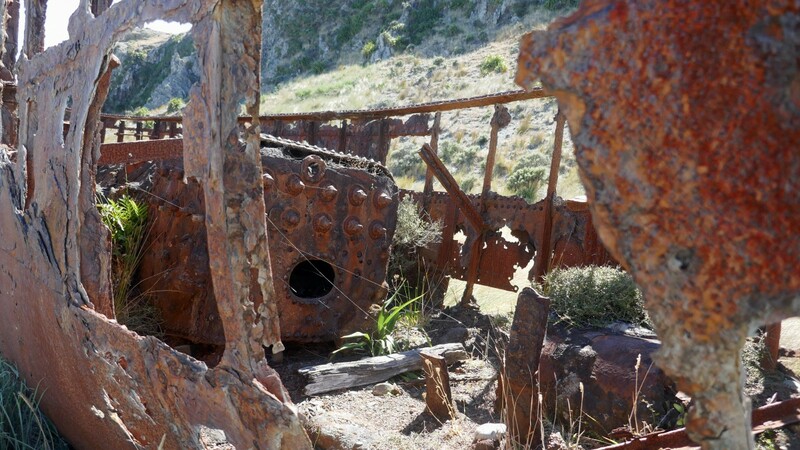 The sinking of this Lyttelton–Wellington ferry was New Zealand’s worst modern maritime disaster. 51 people died that day, another one a few weeks later and years later (1990’s) another victim succumbed to injuries sustained in the disaster. 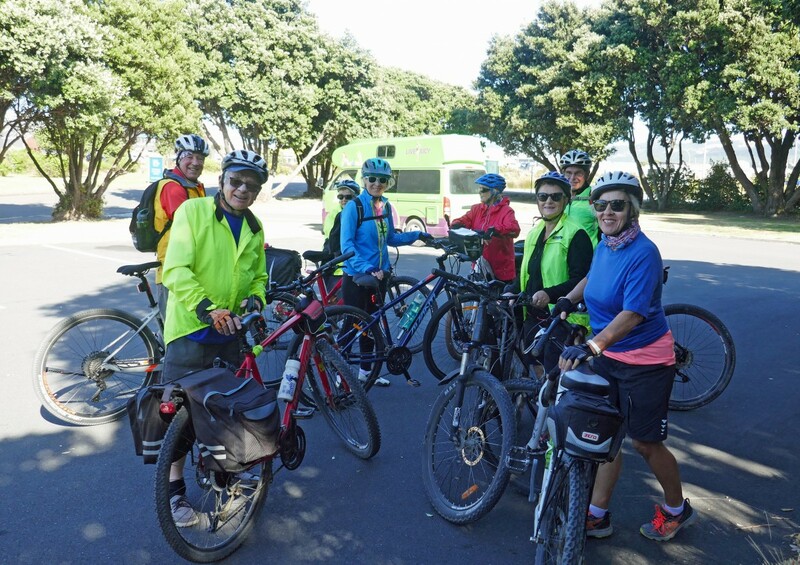 We rode along happily enjoying the spectacular views across the harbour to Wellington city central which had a huge cruise ship berthed in the harbour, and we also enjoyed glimpses of the outline of the South Island across the Cook Strait. 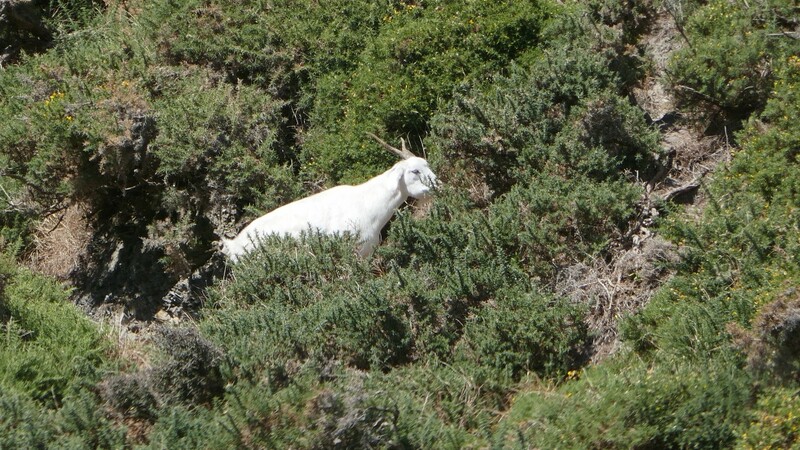 Of course such beauty along the route demands lots of photo stops including one where several mountain goats were happily eating the vegetation from the steep hills alongside the track. 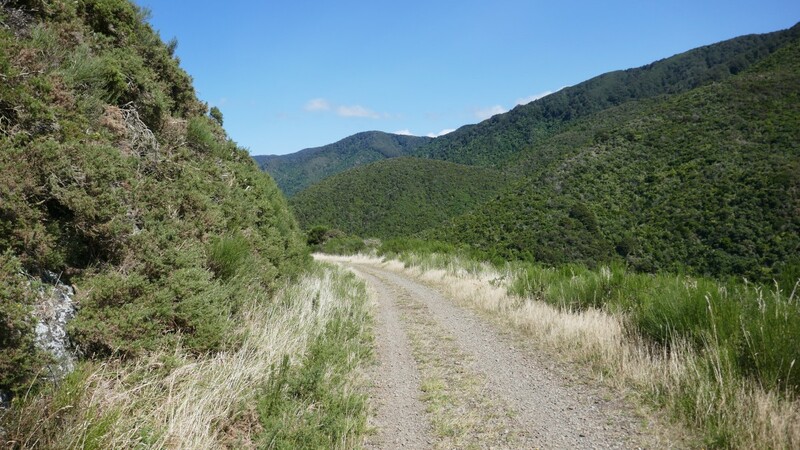 About 9km from Burdan’s gate we stopped at a steep track that leads up to the old Pencarrow lighthouse, and continues on to Lake Kohangapiripiri. 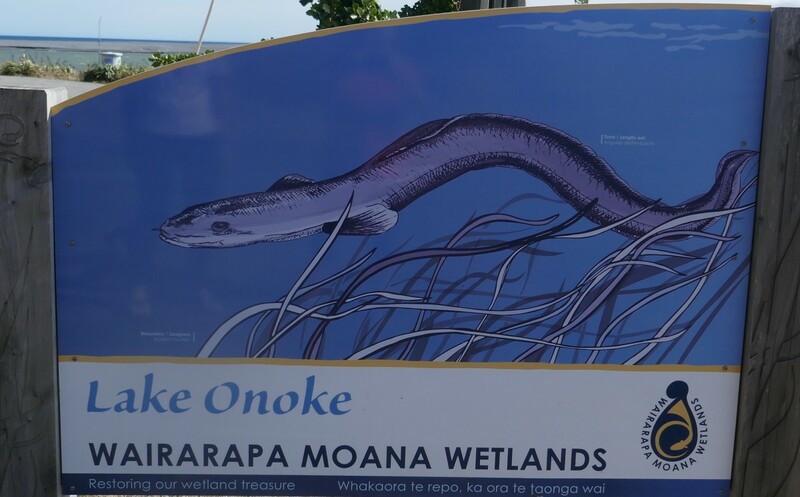 There are two fresh water lakes – Lake Kohangatera & Kohangapiripiri collectively called the Pencarrow lakes and were created by an earthquake which separated them from the sea. 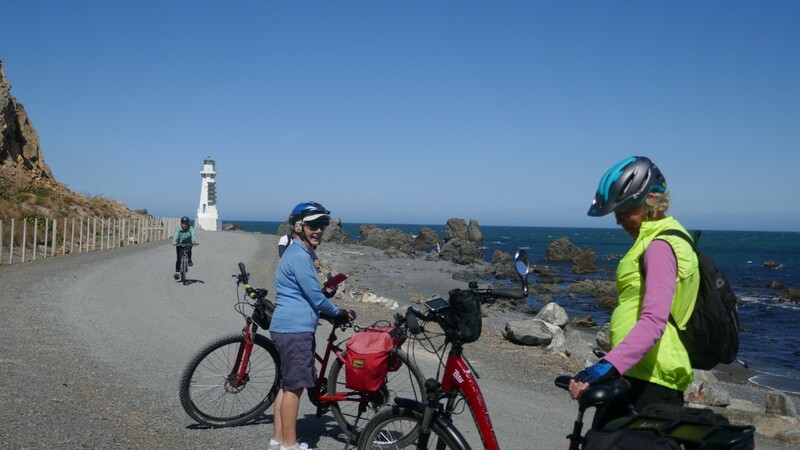 Because we did not know what was ahead on today’s ride we were reluctant to take the time to climb up to the lighthouse, however, two from the group climbed, on foot, up the steep slope to the top affording them a spectacular view. 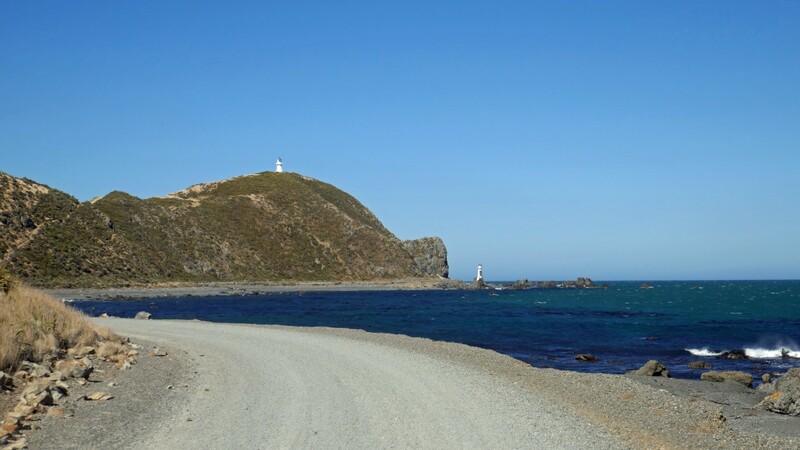 The rest of us cycled on to the lower lighthouse or second Pencarrow lighthouse at sea level. 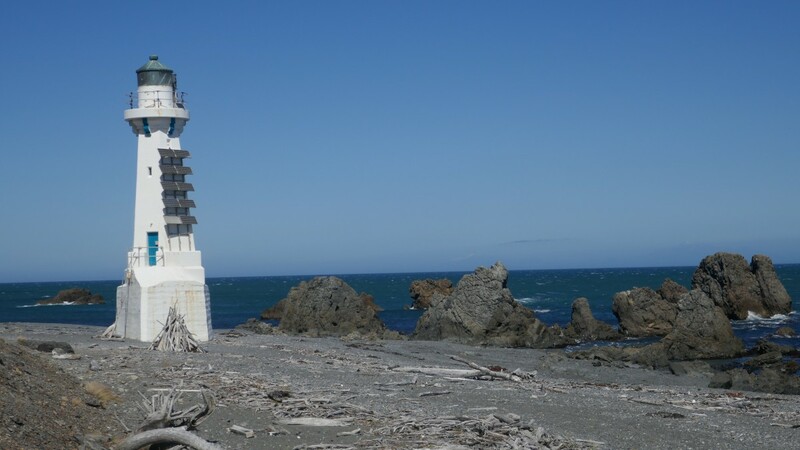 This lighthouse was built in 1906 because the old lighthouse on the hill was often shrouded in clouds! Riding towards The ‘white boat’ our next marker! Bush is always green very high up! 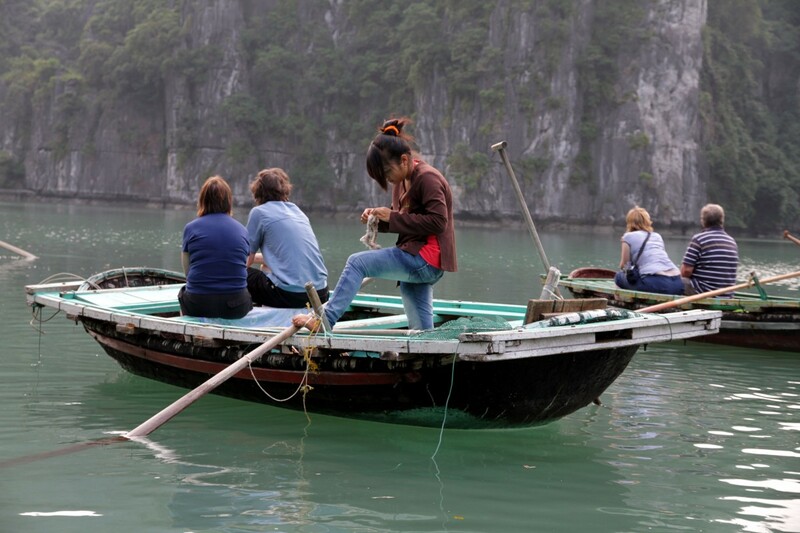 Our next hurdle was to identify an old white boat by the shore where the road divides. Straight ahead on a very rough road to the Bearing Head lighthouse. 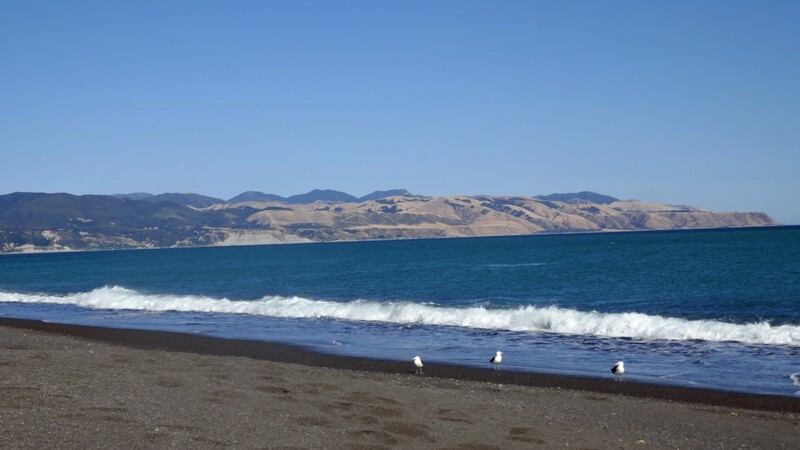 Dave told us we must turn left at this white boat so that we would end up at Orongorongo beach car park which was our meeting point for our transport home. We waited for all the group to arrive just in case someone did not see the white boat – which I must admit was hard to miss!! 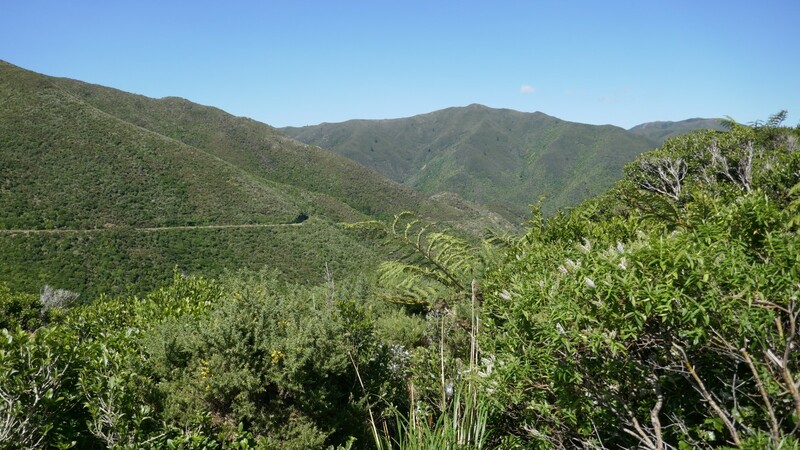 After a long slow steep climb up we stopped at the top to look back over the Cook Strait and of course – a photoshoot! If you look closely you will see riders tackling the hill! After struggling up the hill the views back over Cook Strait were amazing, time for a break and a photo shoot. 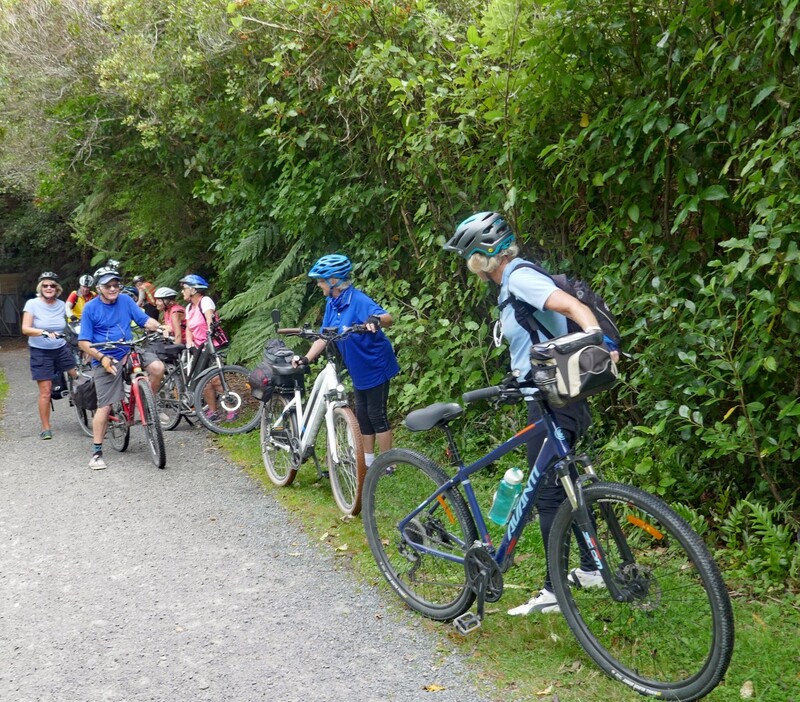 Next we crossed some private land and made our way downhill all the way to the Wainuiomata river. John H decides he would prefer to walk! 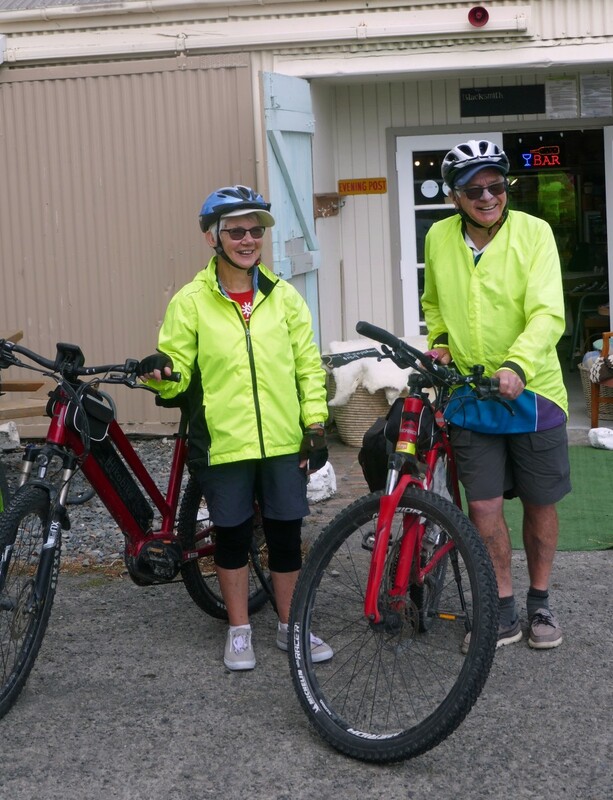 Marcia & Chris makes easy work of it on their E-bikes! After riding across the bridge, however, our trail was blocked by a huge solid iron gate that was firmly bolted. 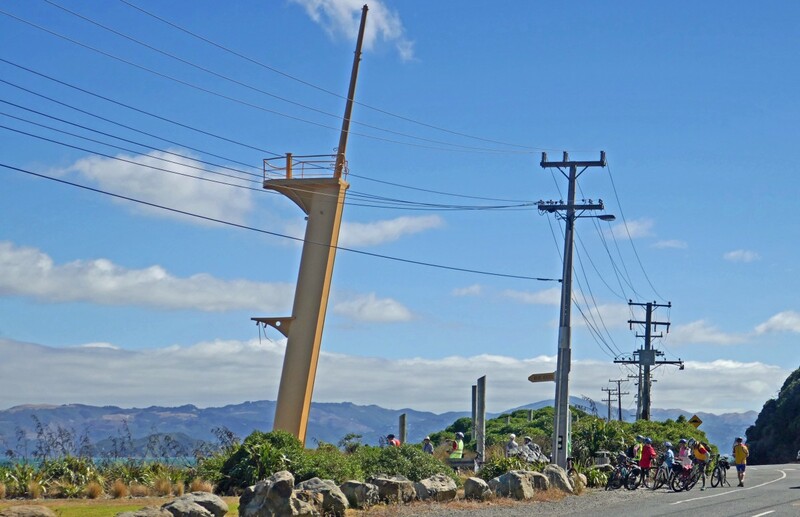 Those of us with heavy e-bikes looked at the gate with horror – how could we possible lift them over this huge tall gate? 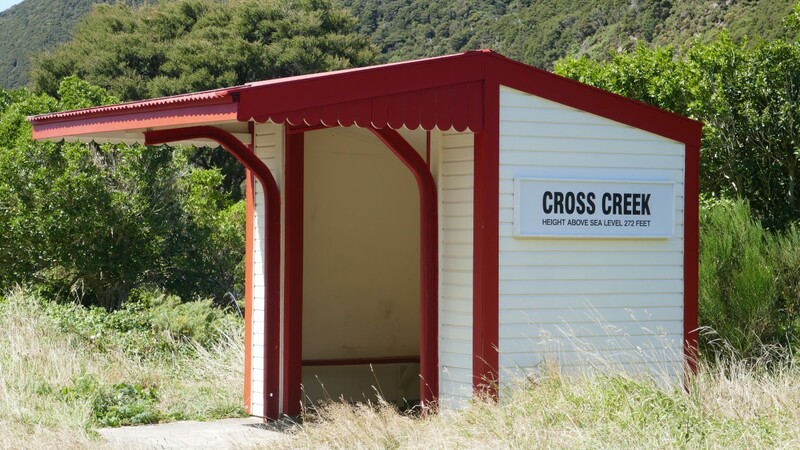 Luck was on our side as we spotted a Hutt Valley ranger working in East Harbour Regional Park a few hundred meters away and went and implored her to help us – did she have a key and could she unlock the gate please??? . She was most obliging and came with key in hand and within minutes the insurmountable large gate swung opened. She informed us that we were very lucky she had been there as the gate is always locked. She did say they were going to install a bike squeeze barrier in the near future but we were very disappointed that Dave had not warned us about the gate. 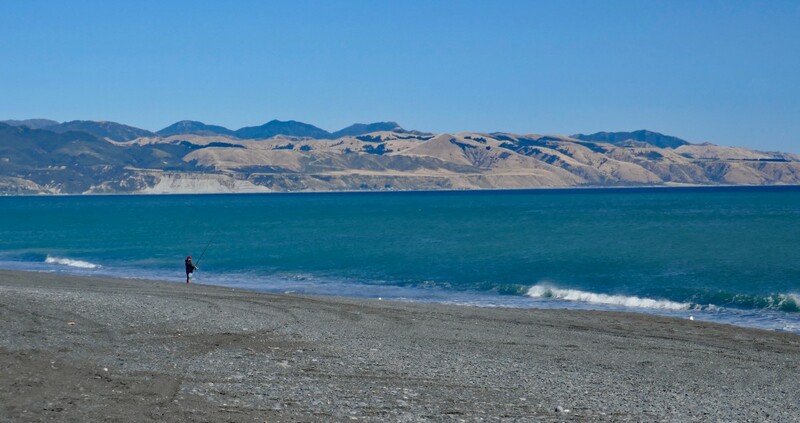 Safely through the gate and feeling totally indebted to the ranger we flew down the tar sealed road to the Orongorongo beach car park where we met the fierce wind howling in from the shore for the first time that day. 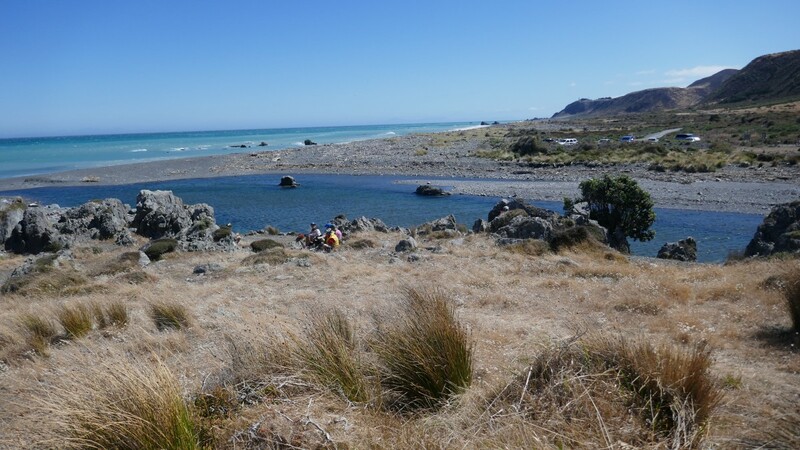 We found some shelter behind rocks on the other side of the Orongorongo River where we sat watching some local fishermen catch their dinner while we had our lunch. Helen & David in serious conversation! John H & Heather discussing politics! 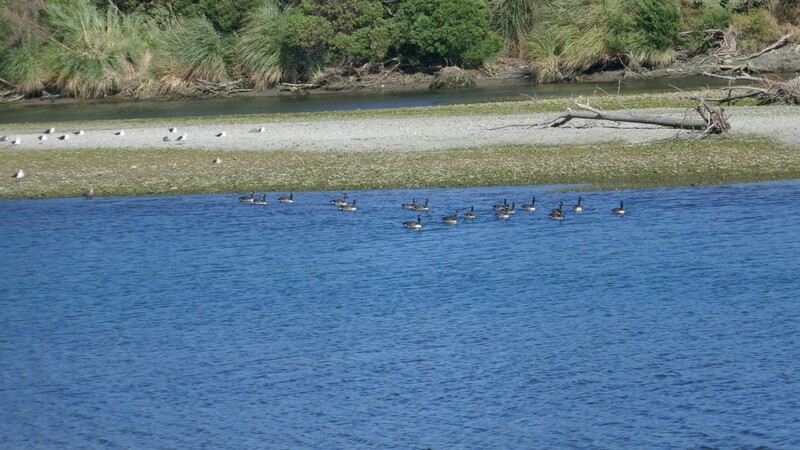 Dave had told us about the seal colony about 2.5km further on in the Turakirae Scientific Reserve. 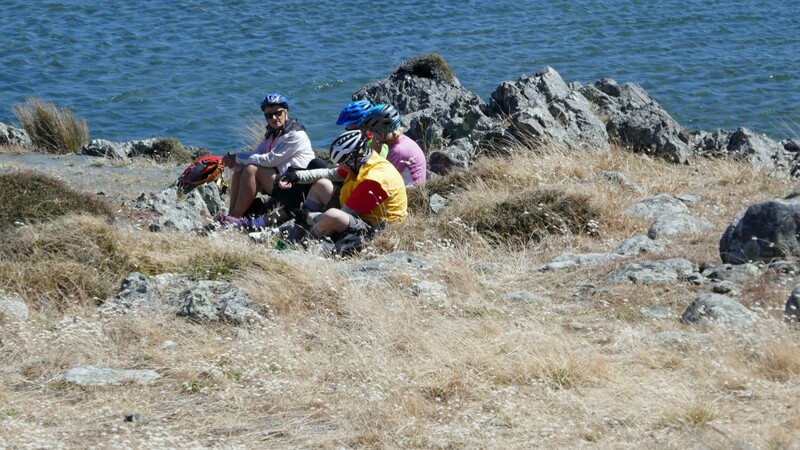 The majority of the group decided to ride to the seal colony and the rest opted to stay and snooze in the sun! 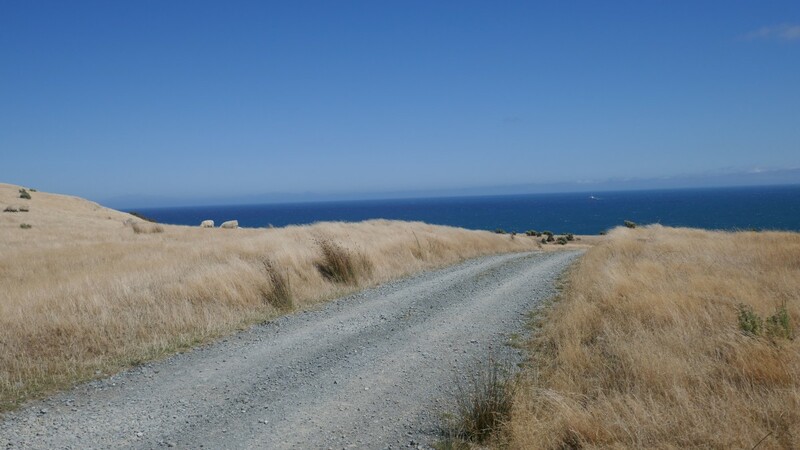 The track to the seal colony was much rougher than we had experienced all day and we finally arrived at the reserve but soon realised we could not ride our bikes any further so headed off to the seal colony on shanks’ pony. It was a relatively short walk but seemed to take forever as we battled against the wind all the way. It made me grateful that we had not had to battle the wind the whole day on our bikes! When we arrived at the large rocky outcrop it was not very clear where the seals were so we all headed off in different directions. 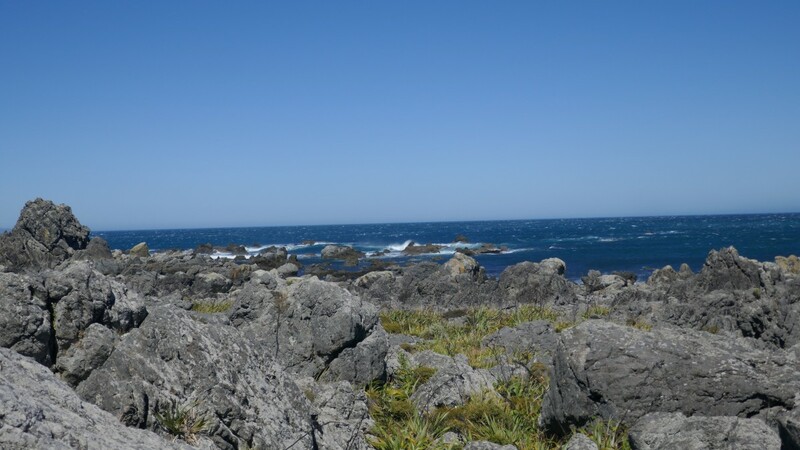 Finally with the aid of binoculars we spotted several fur seals on some off-shore rocks – they were not easy to see with the naked eye. 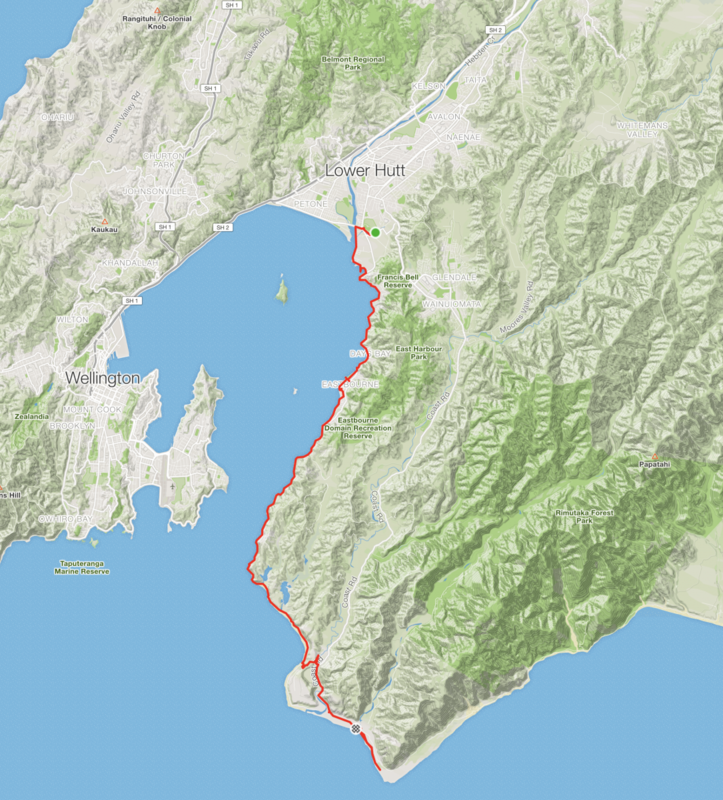 Dave and his van arrived at 16:30 to take us back to Top 10 in Petone. 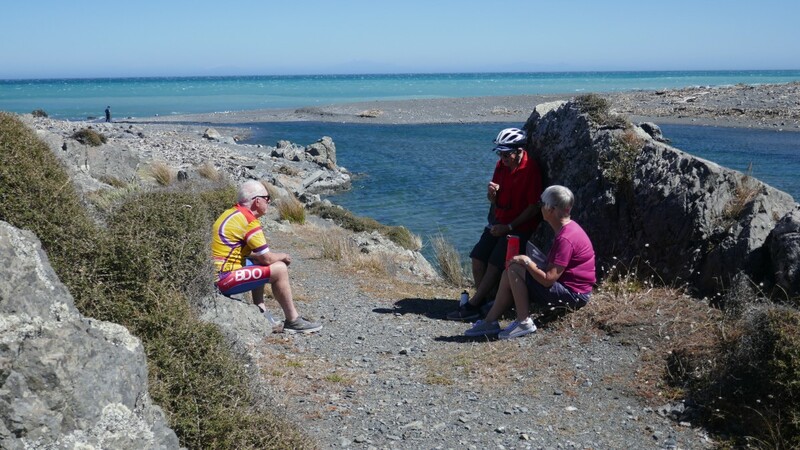 Wine, nibbles and beer was consumed and some pizzas ordered which were less than wonderful but we did not really care as we had a most fantastic bike ride and what scenery…..
Today, we said good bye to our cars for three days. They were safely tucked away in the Top 10 ‘lock up’ costing $5 per day if you book ahead, $10 if you don’t book ahead. 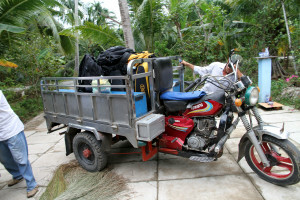 We also had to do a little repacking to comply with the required weight of 15kg per bag as the bags were being transported from place to place over next three days by Dave from ‘Everyone’s Adventure’. After several false starts – where’s my bag?, where are my car keys? my pump? my torch? my lunch? my drink? – we were off. We left all bags in the foyer for Dave to collect – but there did seem to be a few more than eleven bags??? 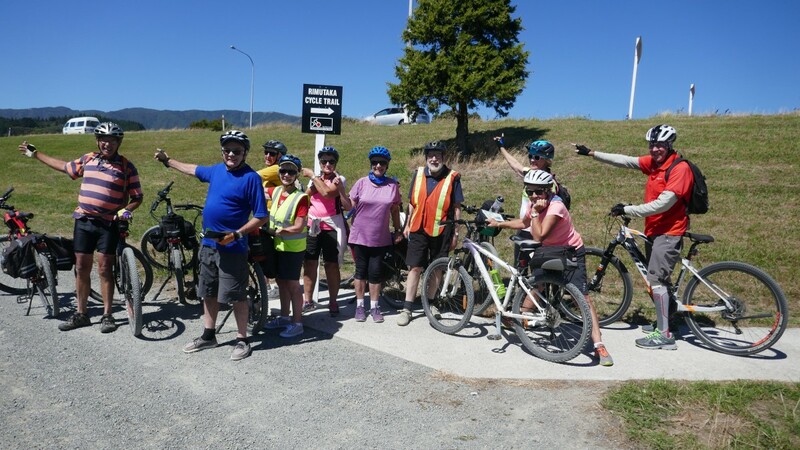 Another clear blue sky as we headed to the dreaded roundabout again but this time, instead of turning left at the bridge, as we did yesterday, we took the right turn onto the track under the road and headed along the Hutt River keeping it on our left! 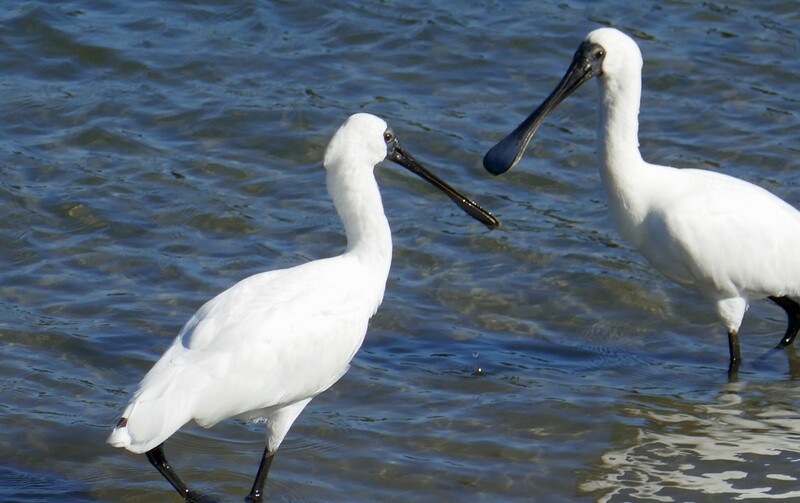 Two minutes after we started riding I spotted several Royal Spoonbills very close to shore – definitely a photo stop. 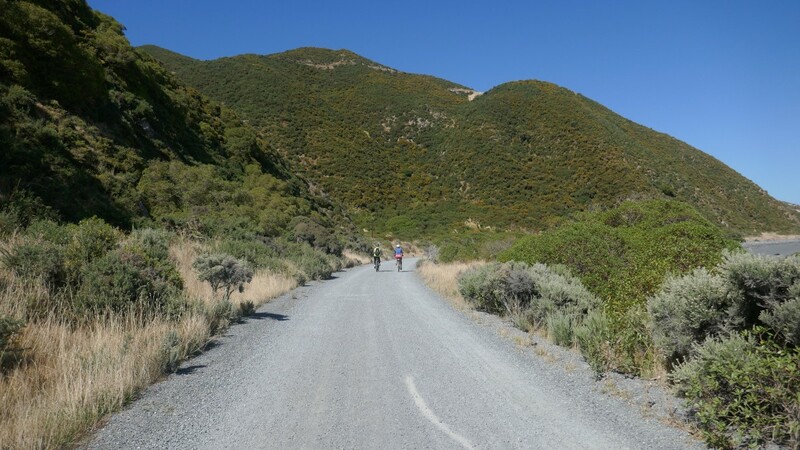 The path called the Hutt River Bike Trail was smooth and flat for a while and then suddenly there was heavy gravel and a steep uphill which took the early riders by surprise and we had our first ‘incident’ of the day when a rider was separated from his bike but thankfully it was not serious. 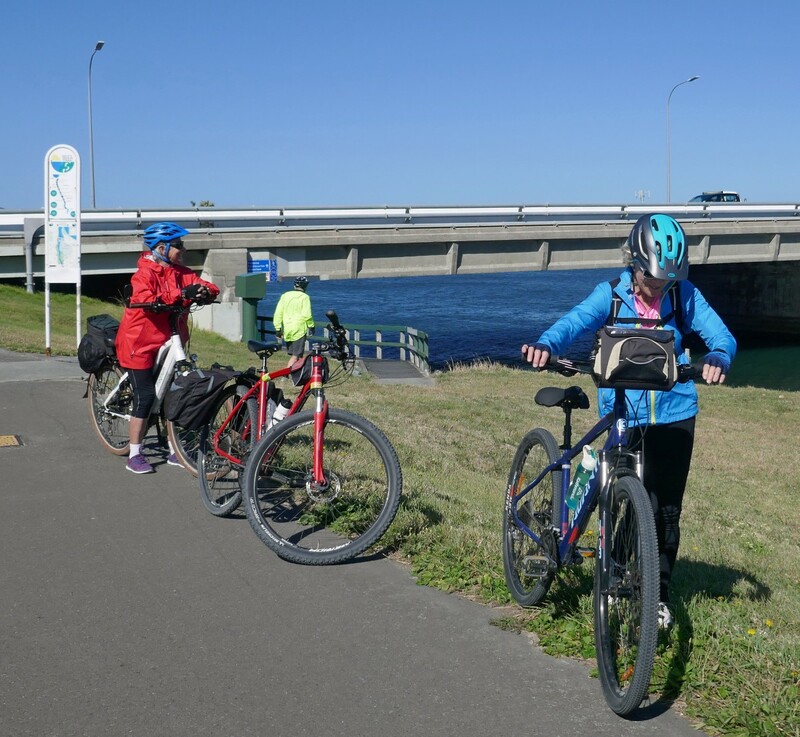 Keeping the Hutt river on our left we passed several busy industrial areas on our right riding through Strand Park, under Railway Ave road and past the Lower Hutt War Memorial Library arriving at Avalon Park where were were joined by another cyclist. 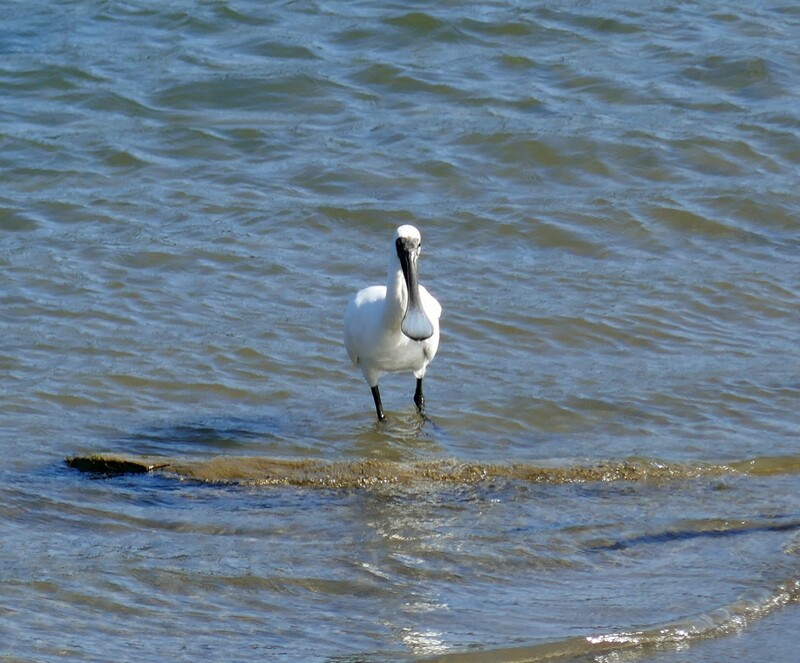 ….a friend of Heather and Bob’s who lives in Wellington and came to join us for the day. 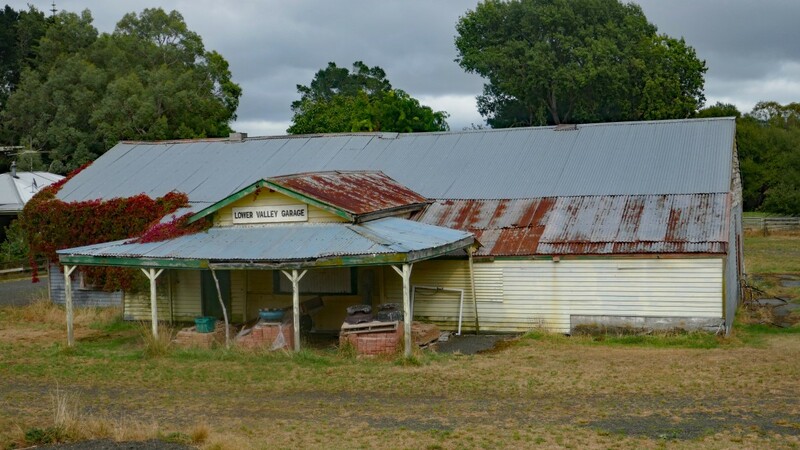 By this time we were keen for coffee so stopped to ask a few locals where we could get a cuppa – ‘best place closest to the track was probably the Caltex station at Stokes Valley’! So on we went aiming for that destination – and they were right it was a good coffee! 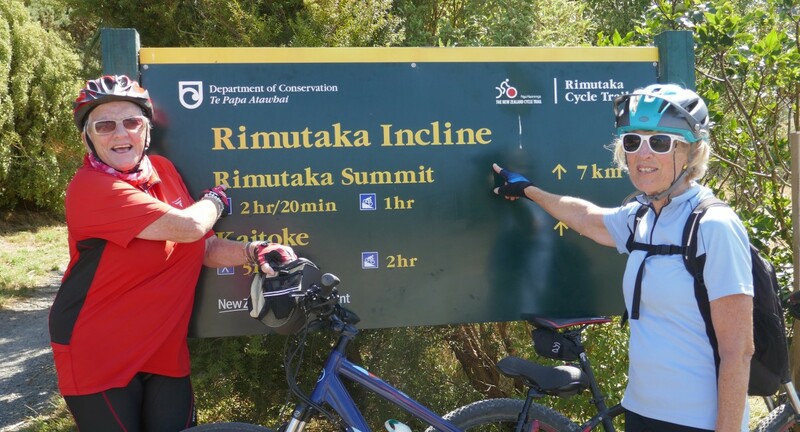 The signposting was excellent along most of the track but we found it a little confusing when we reached Totara park Road where there were two signs for the Rimutaka Trail – one up and over the bridge and one straight on. 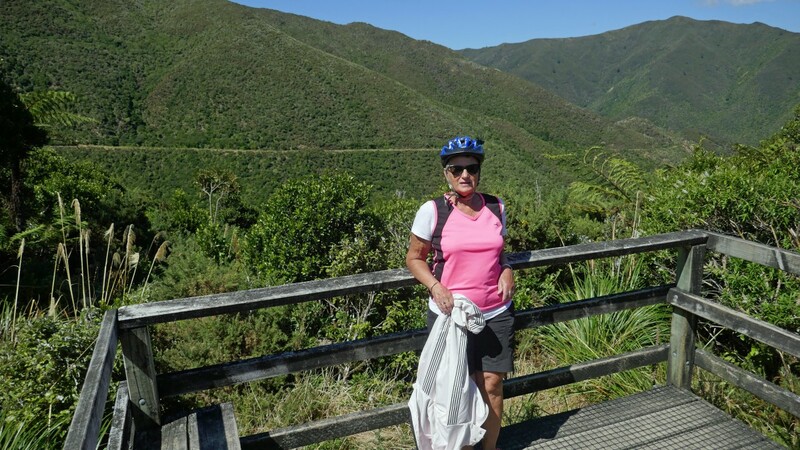 I rode over the bridge to confirm that we needed to keep the Hutt river on our left until we reached Harcourt park and our home for the night – Wellington Kiwi Holiday Park (also known as Harcourt’s Holiday park). 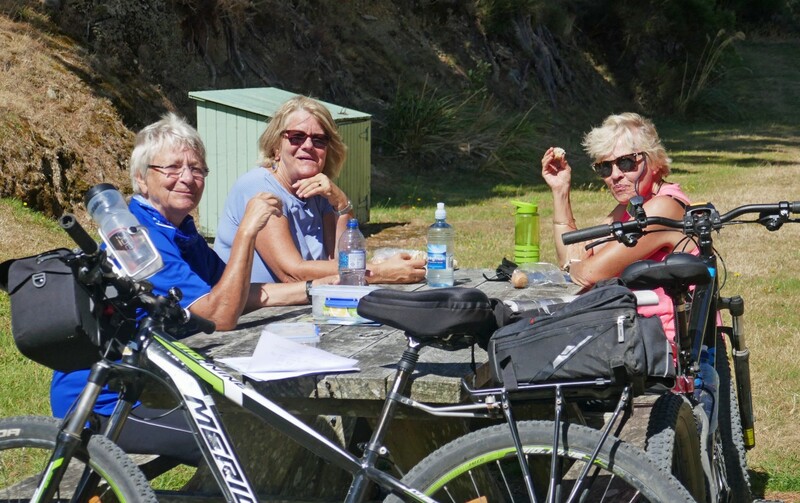 We sat on the banks of the Hutt river and ate our lunch while waiting for the group to catch up. There had been another wee incident with another rider who scratched his leg going through a cement stile but again all was well. Having ascertained that we did need to keep the river on our left we rode the last few km to our destination. 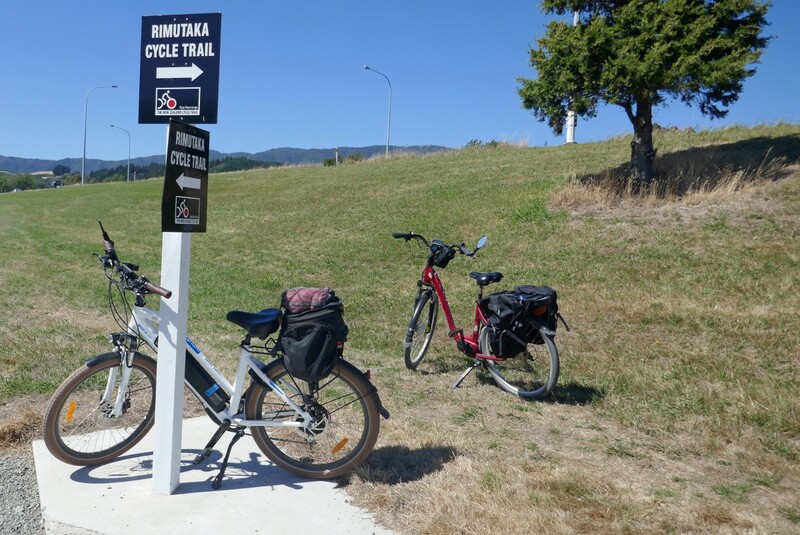 It seems that the Hutt River Trail and the Rimutaka become one from Totara Park Road up to Birchville which probably caused the confusion with the signposting. Once we arrived at Harcourt Park we asked direction to our accommodation from a local walker and were told to take the road – all very straight forward but we later discovered a better and shorter route through Harcourt’s Park! 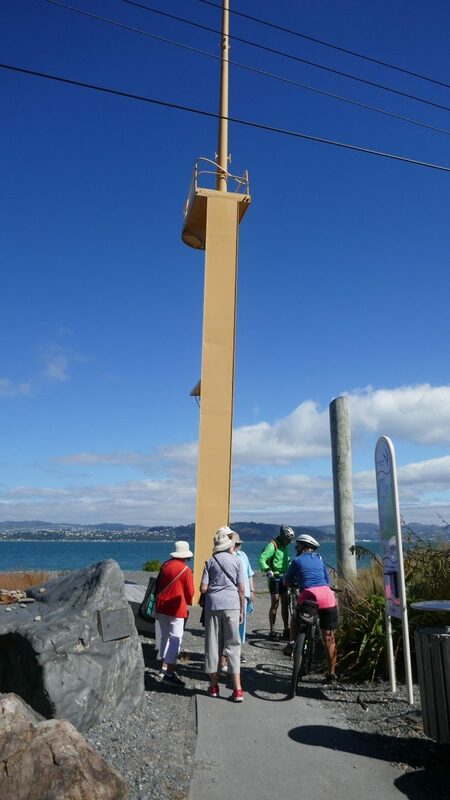 Which way to the Kiwi Holiday Park? 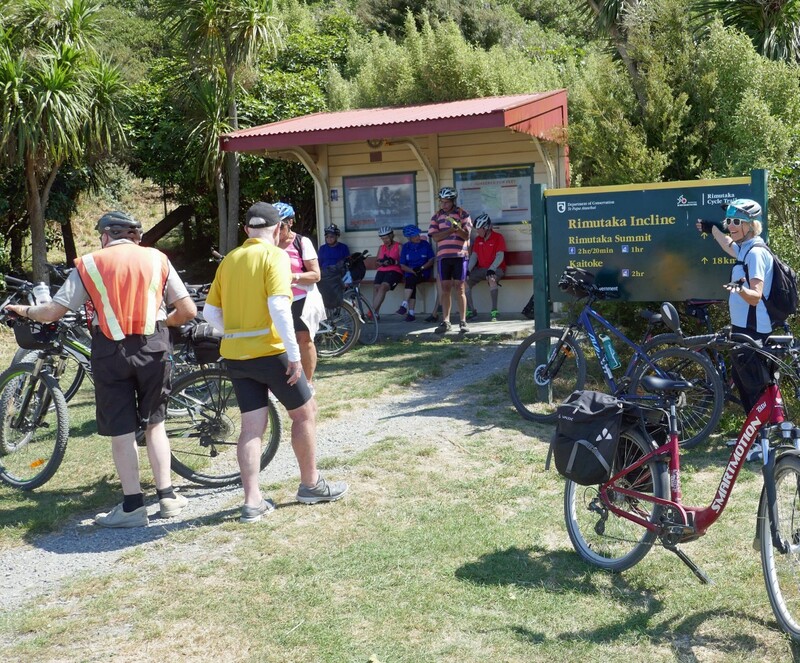 It was a relatively easy day’s ride and we arrived at Kiwi Holiday Park at about 2pm. What a little oasis it turned out to be. 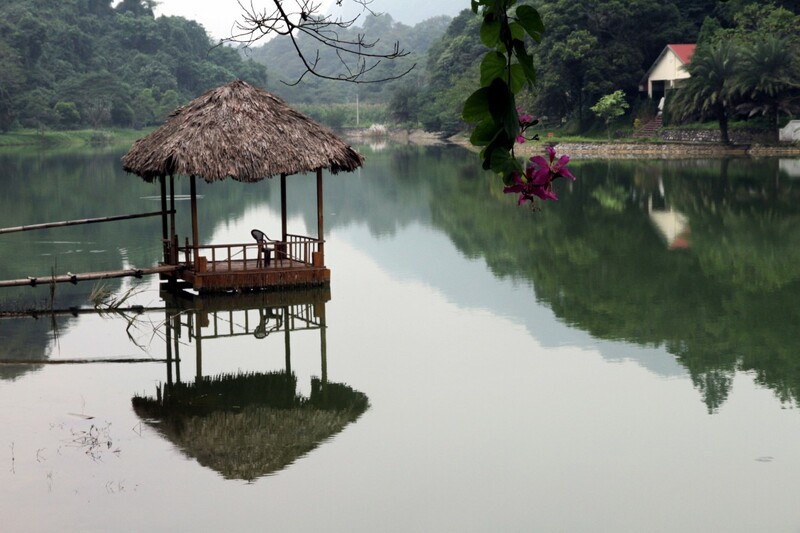 Set in lush wooded area with bouts of magical birdcalls followed by silence. 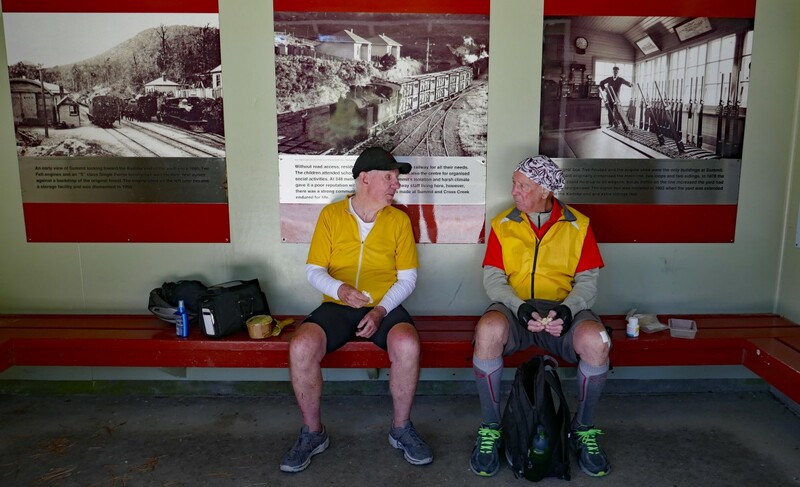 Our bags had all been safely delivered – our only issue was food as there was little available in the immediate area and we had no cars so most settled for fish and chips from the local which was pretty basic. We all loved this little friendly holiday park with all facilities you could possibly need. Had there been a nice little restaurant close by it would have been perfect! Another beautiful morning and we were all ready for off at 08:30. This was our BIG day! 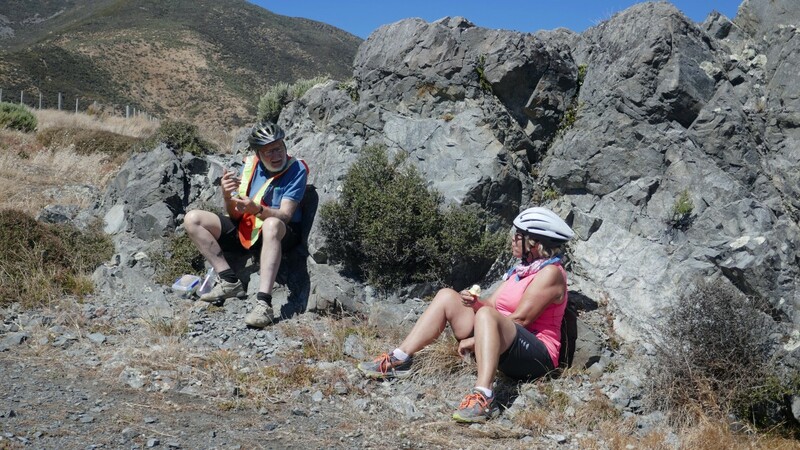 Everyone had plenty of food and drink for the day as there were no food sources on todays’ route! Just about ready for off! 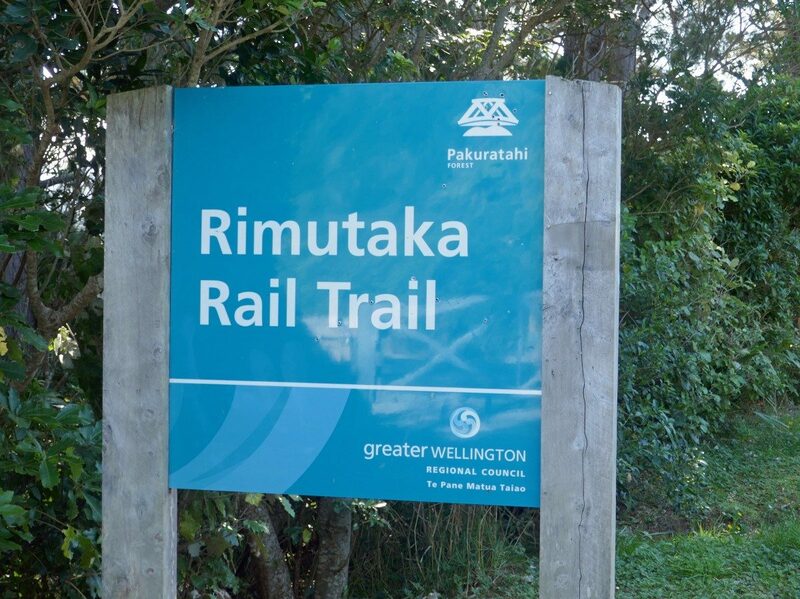 We headed back into Harcourt park and followed the Rimutaka trail signs. 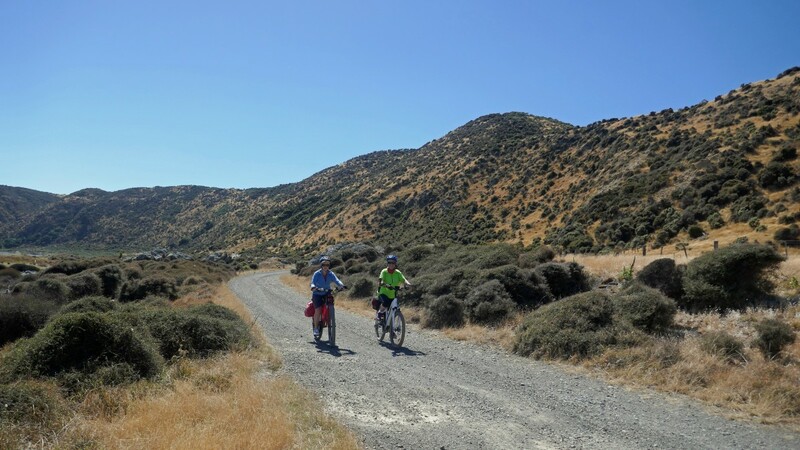 We left the trail after about 3-4kms and rode on a quiet country road through Te Marua and along the Maymorn Road to Maymorn station which was a non event! We were past it before we realised what it was! 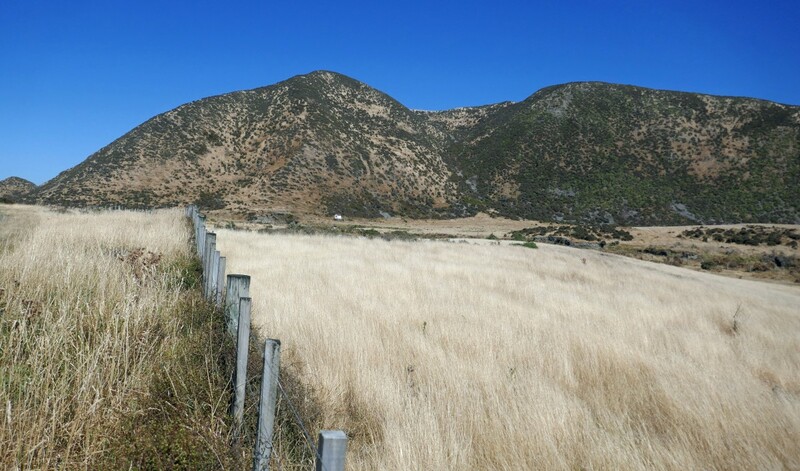 We then headed through a gate and up a steep sharp incline for about 200 meters then we had a very steady uphill incline to the summit 19km away. 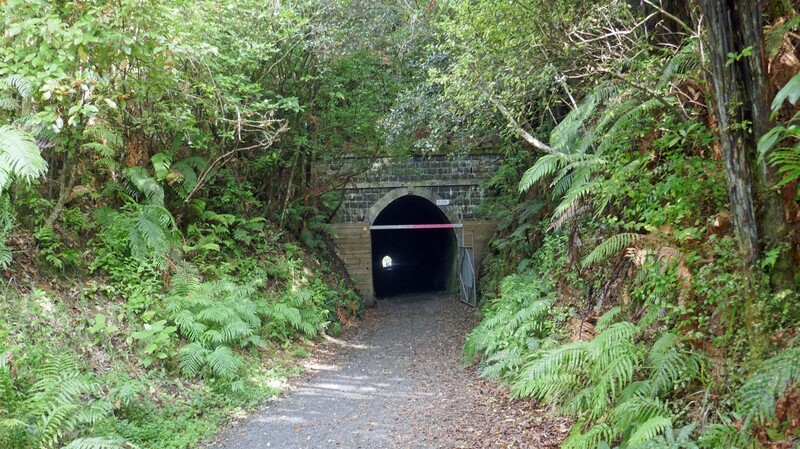 Our first tunnel was just about 500m beyond Maymorn – the Mangaroa tunnel 253m long built in 1877. We were all armed with torches but really did not need them for this one. Checking everyone got through the tunnel! 3-4 km later we turned right into Incline Road (a quiet sealed road) and followed the signs to the ‘pinch’ gates. We were quite close to Hwy 2 in parts of this road. We came to Kaitoke car park and were warned about a rifle range close by. There is also an information board and many more dotted all along this trail. We saw nor heard anything from the rifle range as we zoomed past it. 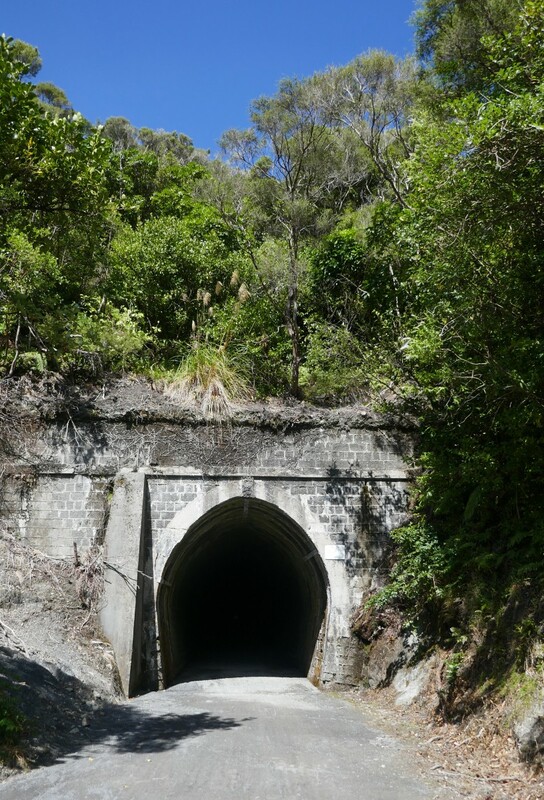 A few km along we came to Pakuratahi tunnel, 73m long and built in 1876. We could see the end of the tunnel before we entered the beginning! 19km from Maymorn we arrived at the summit, the sun was shining but there was a keen wind. This was our agreed lunch spot and we enjoyed a half hour, eating drinking and chatting and reading all the information boards about the amazing incline railway gradient. This is a beautiful picnic area with lovely views and areas to walk around. There is a wooden shelter from the wind and some old rusty remnants from the old Fell locomotives that worked hard on the Incline for 77 years! There are also toilets here. 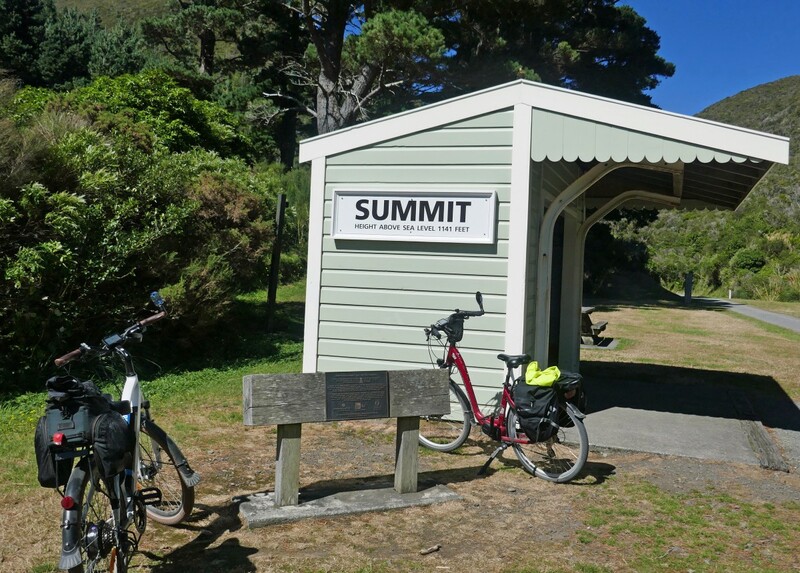 Summit shelter – 348m above sea level! Refreshed and rested we headed down the incline – taking care as we rode through the gravel patches. 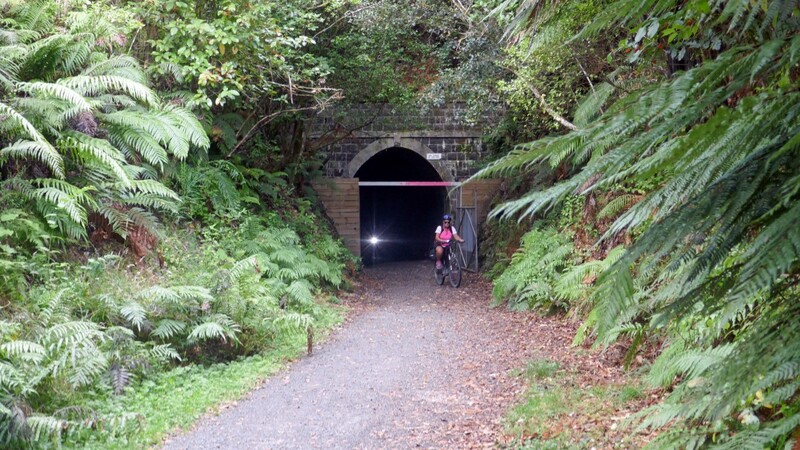 Our first hurdle was the Summit tunnel built in 1877 and 584m long – we definitely needed our touch for this one! 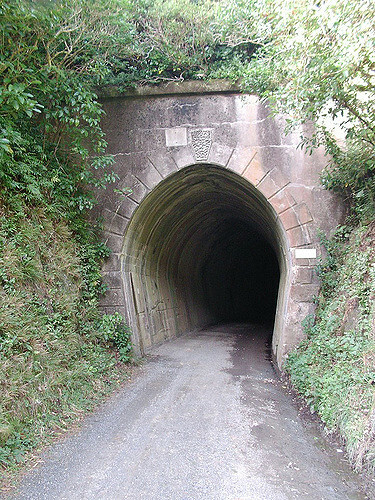 The gradient of 1:15 used for the Fell locomotives starts part way through the long 584m Summit tunnel, built in 1877. We stopped at a look out just off the track on our way down. What a beautiful view – it looked way over the green forests and we also spotted our next tunnel amongst the greenery less than a km away. It was the Siberia tunnel built in 1878 and is 108m long. 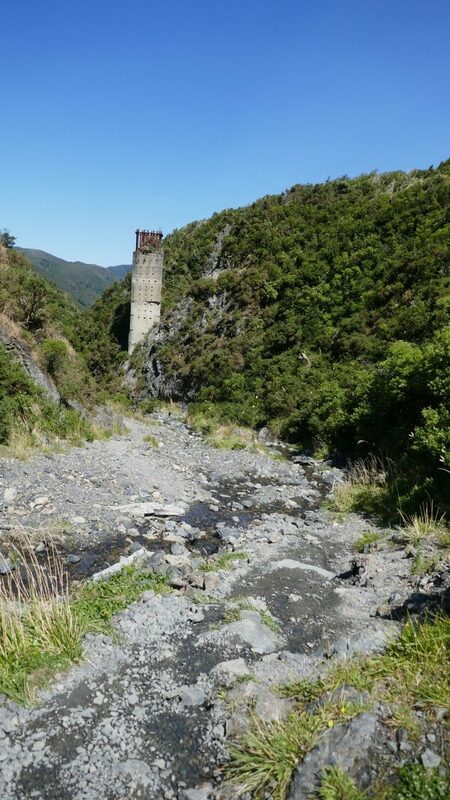 Our biggest challenge of the day came after the Siberia tunnel when we approached Siberia gully which had once been a large sweeping embankment but was washed away in 1967. This left a very steep rough gravel & rock descent down to the stream and then a very steep ascent on the other side. For the E-bikers what lay ahead appeared to be a monstrous climb especially trying to push a 25kg bike up a nearly vertical slope filled with rocks and gravel. Thankfully everyone helped each other and we all made it safely to top. At one stage I was taking one step up and two back down and if I tried to use my throttle my bike reared up like a wild stallion! Siberia Gully and what is left of the embankment. The steep decent down to the gully and incline out of the gully was strewn with rocks and coarse gravel. – BLOODY SIBERIAN GULLY!!!! Onwards and downwards to our next tunnel enjoying the views and the downhill as we rode. Tunnel 5 – Prices tunnel built in 1875/6 and is 98m long! A few km along we finally came to Cross Creek Station. which has a historic site where there once was and still has the remains of a locomotive depot and a turntable. Once this little area had a school, library and several homes. The old Cross Creek station. Just about 100 meters along is the old locomotive holding yards and turn-tables. This was not the end of the track, in fact the trail becomes quite narrow and undulating and we needed to focus on the trail as there were several slips along the track and not enough room for more than one bike but with relief we met nobody coming the other way and all arrived at Cross Creek carpark where we read on an information board that this was the end of our Incline adventure. Lucy & Lorraine pointing to the obvious! 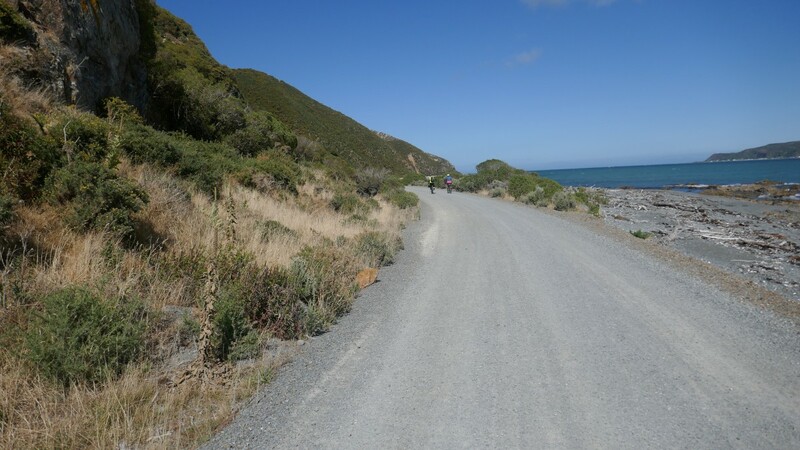 But we still had 16.4km to our accommodation at Waiorongomai Station so we turned right and rode along a main tar sealed road. 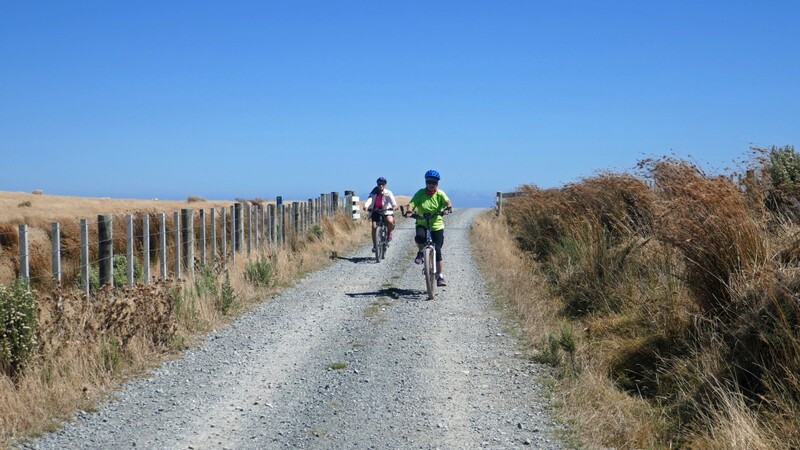 We thoroughly enjoyed riding on the tar seal after so much gravel and revved up our e-bikes!! 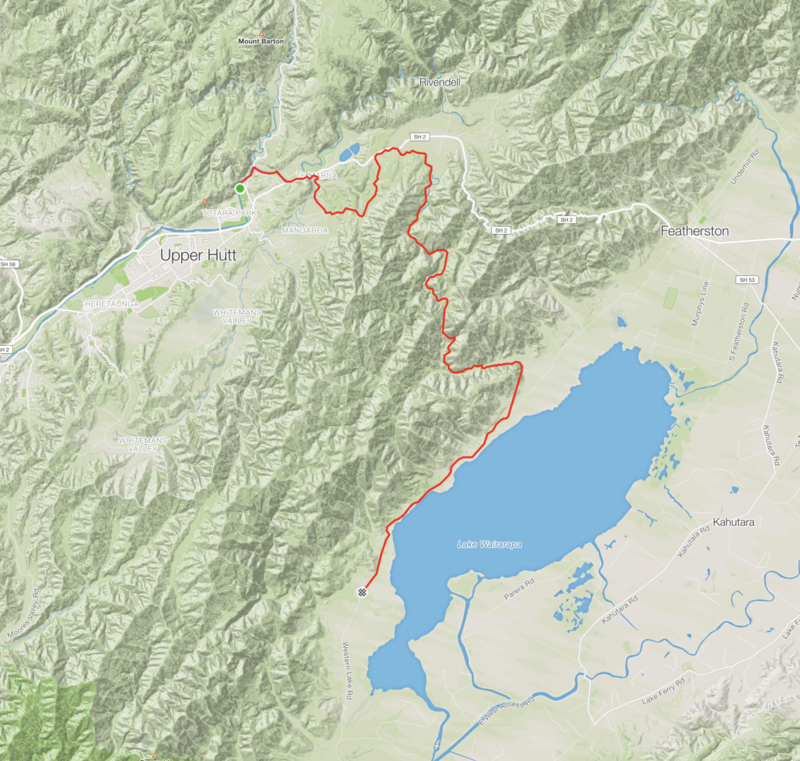 We rode alongside Lake Wairarapa for many kms. 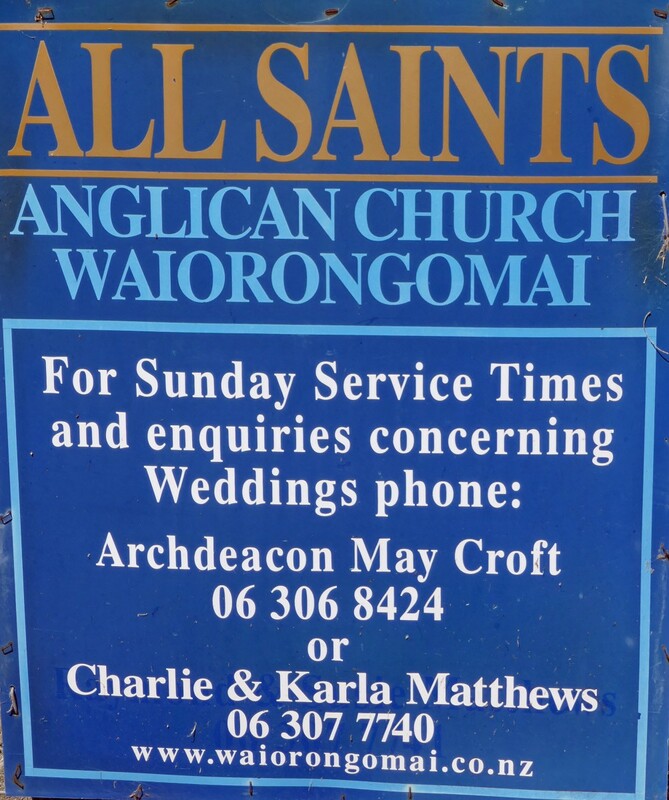 As we got close to Waiorongomai station we came to a beautiful little church on the left side of the road called All Saints Anglican Church which was built in 1927 by the descendants of Charles & Elizabeth Matthews who started farming Waiorongomai station in 1850. 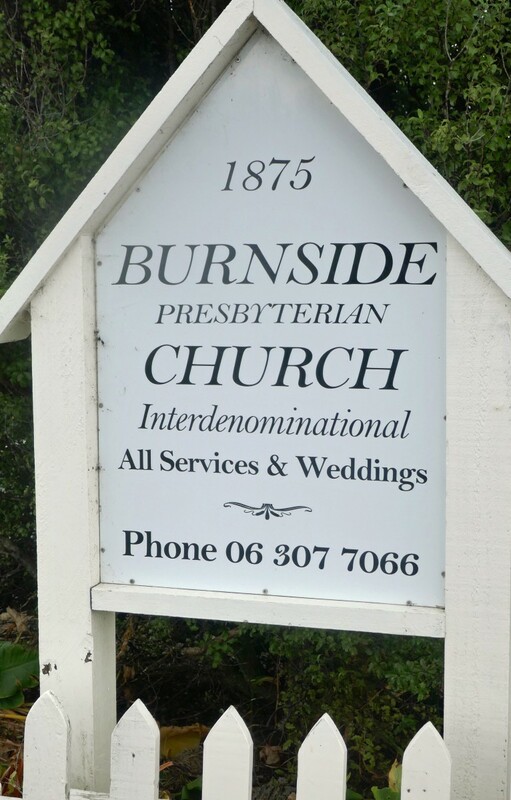 It was built as an ecumenical church to service everyone, but the running of it became too hard for the Matthews family so the Anglican church took over. The family however are still very involved and spend a lot of their time trying to keep the grounds and church up to scratch. 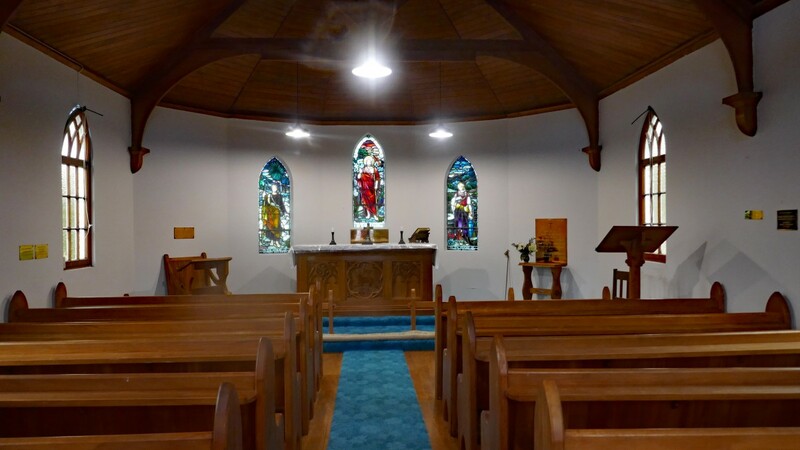 It is clearly in need of TLC but the cost is prohibitive for both church and family. 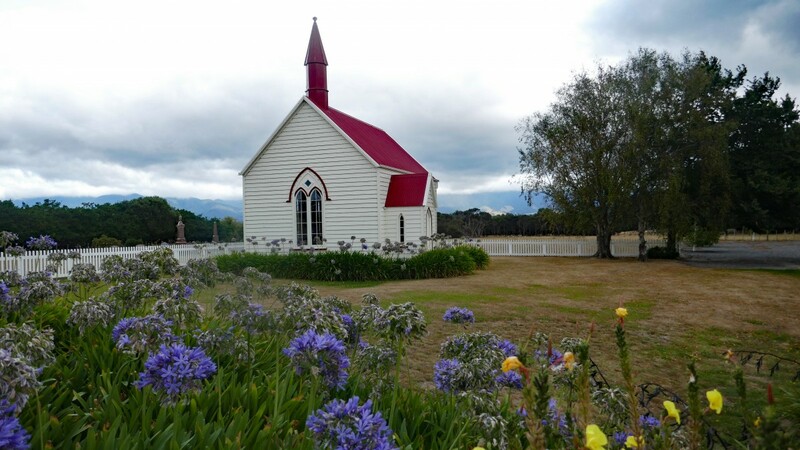 What a beautiful setting for this lovely church – All Saints Anglican Church, Waiorongomai. We finally arrived at our very clearly marked destination. We had booked two cottages within the station which have been specially refurbished for bikers like ourselves who only stay one night. 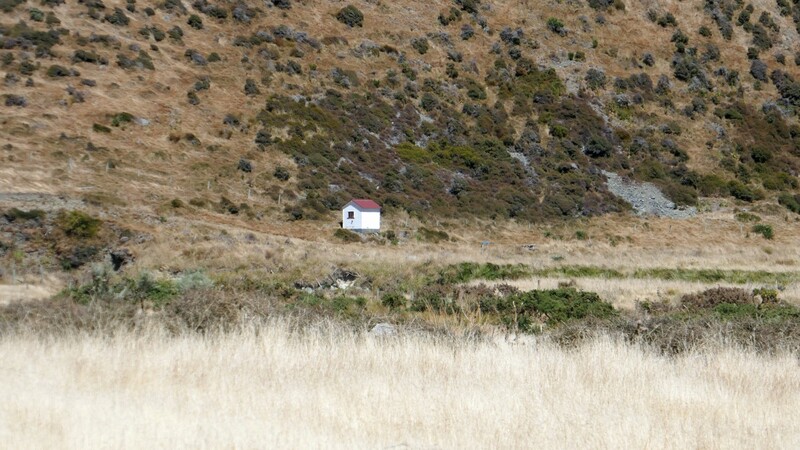 Our cottages were Burling & Ratanui cottage. Karla, our host came around to check that we had everything we needed and spent some time talking about their part of farm life as the sixth generation of the Matthews family. The cottages were beautiful and were surrounded by fields full of sheep. 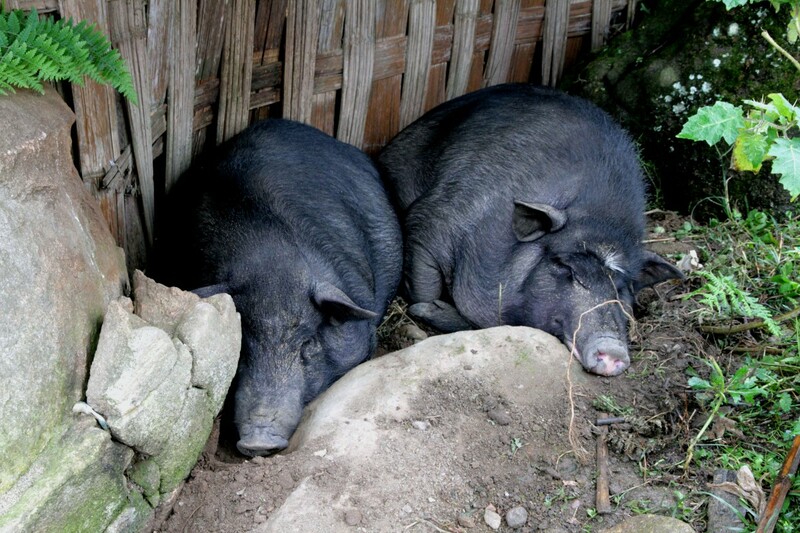 There were kunekune pigs just along the way. We all agreed it was paradise. 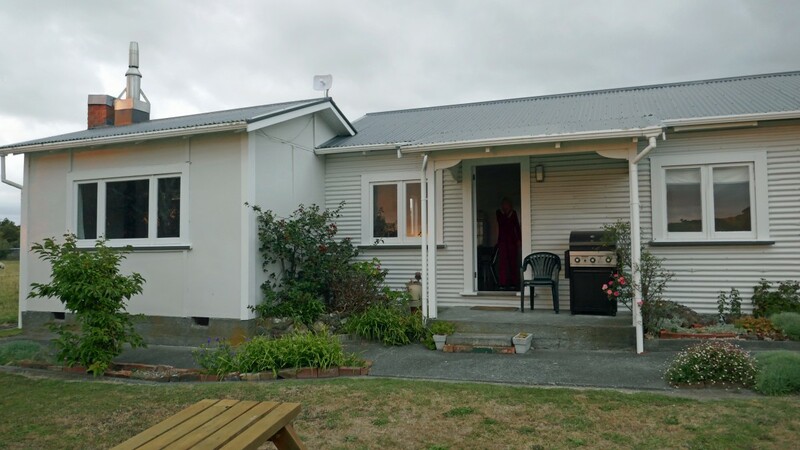 Everything we wanted was there in our cottages and we had arranged to have dinner there and breakfast so we all joined forces in the large cottage Ratanui. 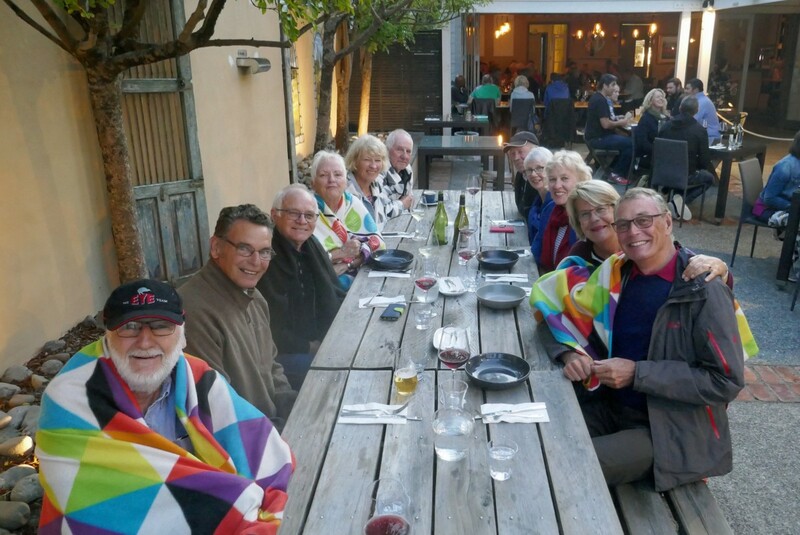 There was plenty of room for all 11 around the table so we chatted, drank wine and ate and chatted about the days’ events – mostly about our efforts to get up out from that ‘bloody’ Siberian gully! 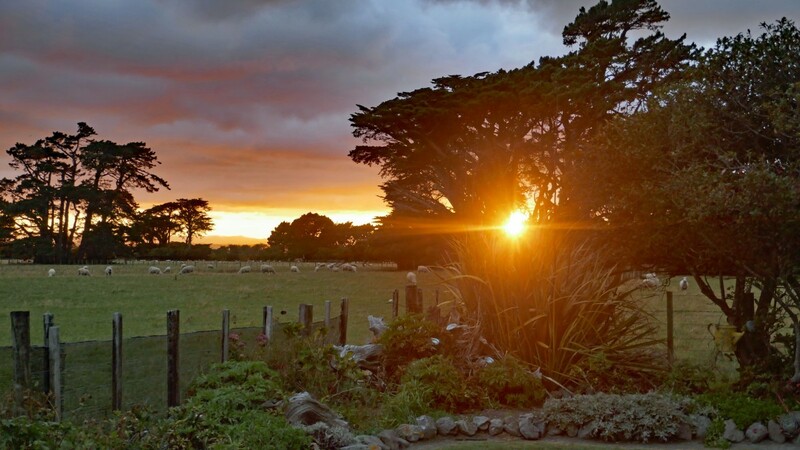 Surrounded by the sound and smells of the Wairarapa and a beautiful sunset we all headed off to our rooms for a good nights sleep! 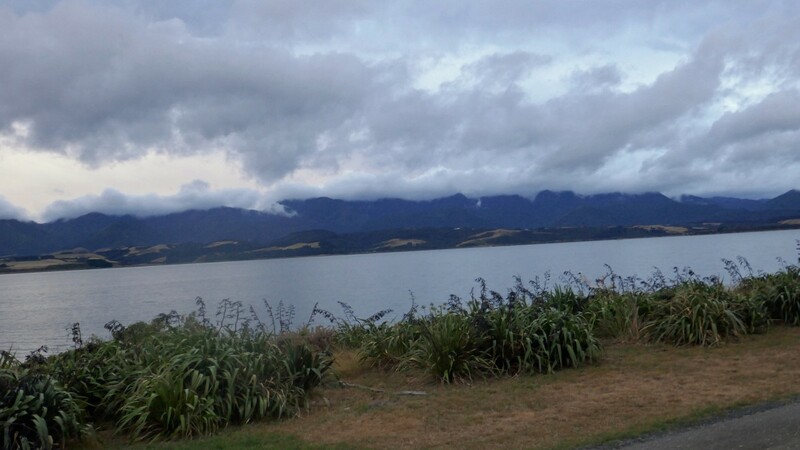 We woke to cloudy skies – the first sign of rain since we started our trip. 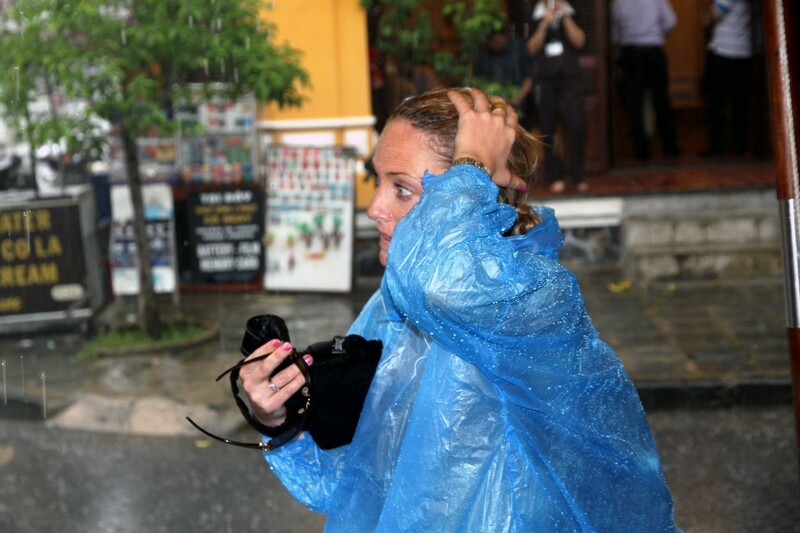 Karla informed us that the weather forecast indicated rain which would increase tomorrow. Based on the threatening clouds and the weather forecast we decided to head off after a hearty breakfast. Having taken our food scraps to the Kunekune pigs who showed absolutely no interest in them, we headed off to Lake Ferry. 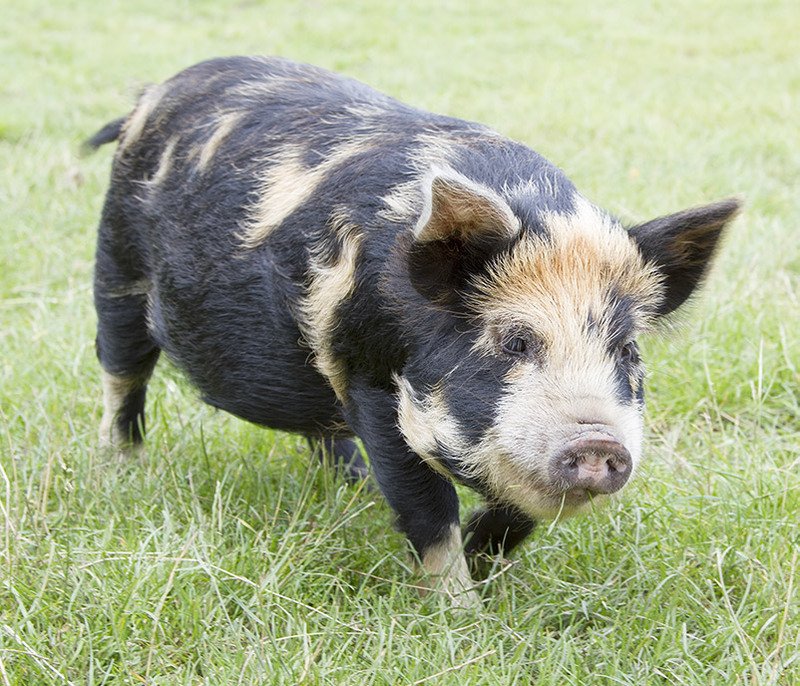 A kunekune pig – not from Waiorongomai! It was pretty well sign posted except for the main junction where we met the Martinborough Road. So one of our groups waited to point everyone in the right direction and by this time it was drizzling steadily and phone service was ‘iffy’ so we could not rely on that for communication. Lower valley Garage…… dont know when it last saw a car! 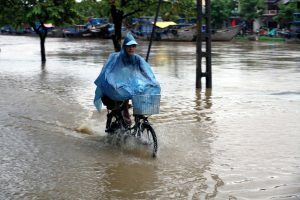 It was an easy pleasant ride (despite the light rain) but we had been warned that there was no cafe along todays’ route. 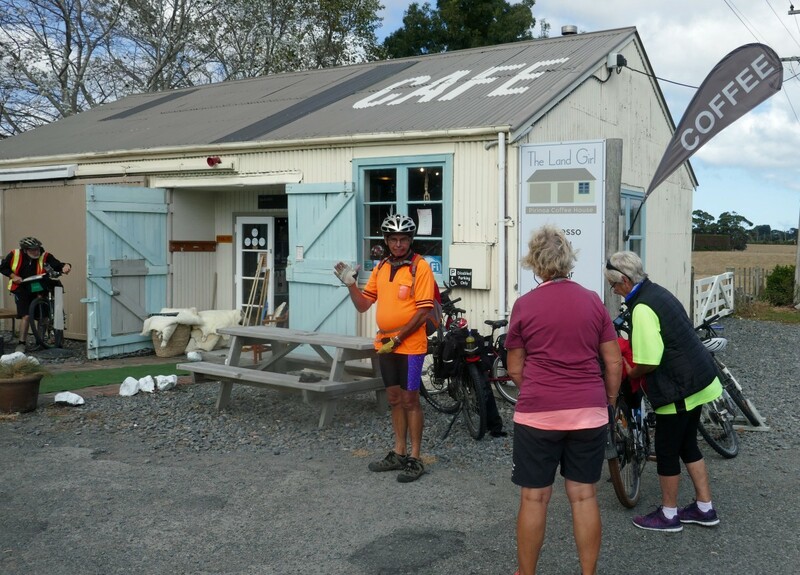 So you can imagine our absolute delight when we saw a coffee banner waving in the wind about 7 km on the Martinborough side of Lake Ferry. What a lovely surprise and what a gem it turned out to be! Called ‘The Land Girls’, it had coffee, gifts, delicious food and lots of character – what more could we want? News spread along the group very quickly and suddenly everyone was gathered there to have coffee and sustenance in the tiny settlement of Pirinoa. If you could not get what you wanted in the cafe the the shop across the road sold just about everything. The Land Girls Cafe – our oasis!! 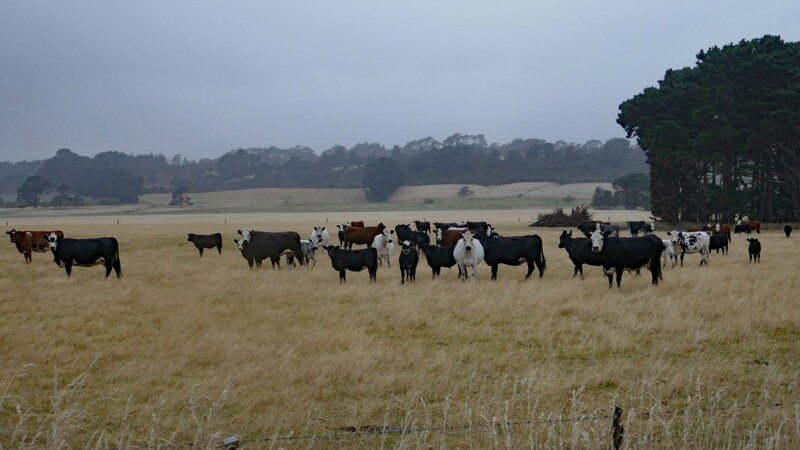 The rain began to clear as we left the cafe and we were able to take in the beauty of the countryside. The sun came out as we got close to Lake Ferry which we were pleased about. We arrived there a little too early for check in but our bags had arrived and the staff were very helpful and happy for us to take our bags to our rooms which was a big bonus. This is a very old hotel so we all shared the ablution block which was clean with several showers and toilets. Our rooms were pretty sparse but we had a bed and a shed for our bikes and there was a pub for drinks and food! We had pre-booked our group for dinner at 6:30 pm- just in case they were busy. The sun really did come out! 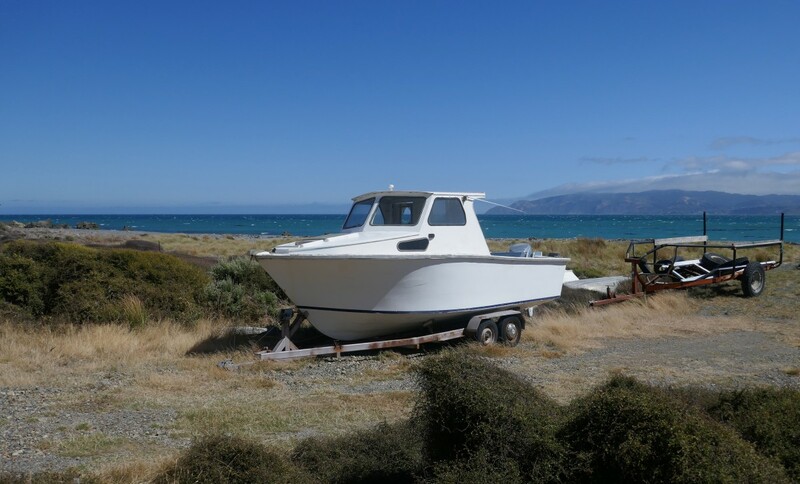 The settlement of Lake Ferry is between the shores of Lake Onoke and Palliser bay. 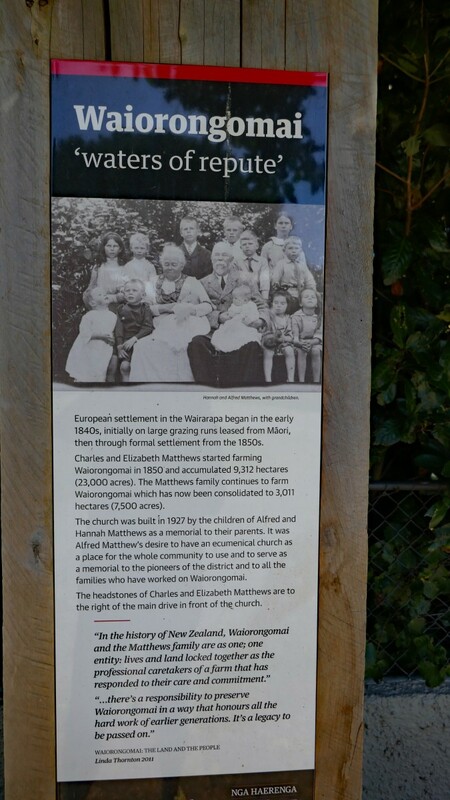 This is a very old region of NZ dating back to the 12th century! 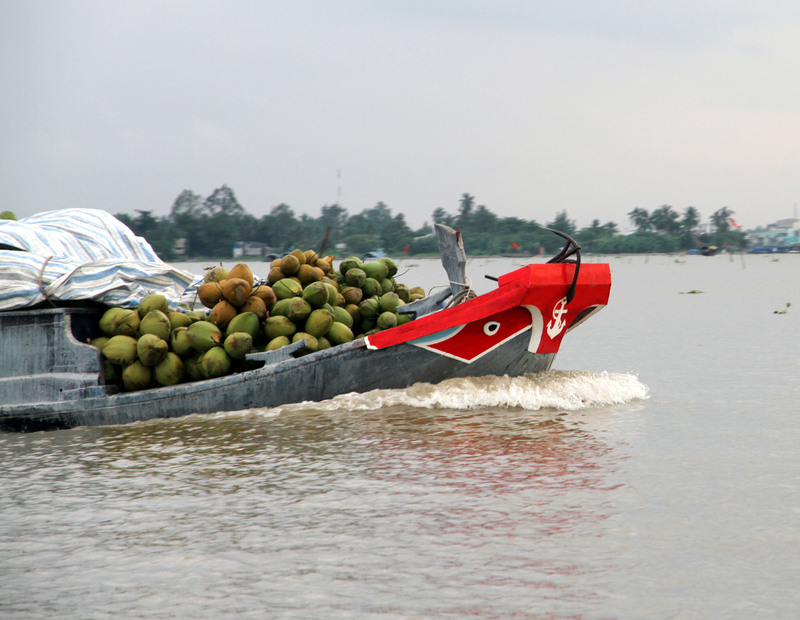 Farming started in 1844 and in 1850 a ferry service was established across Lake Onoke. 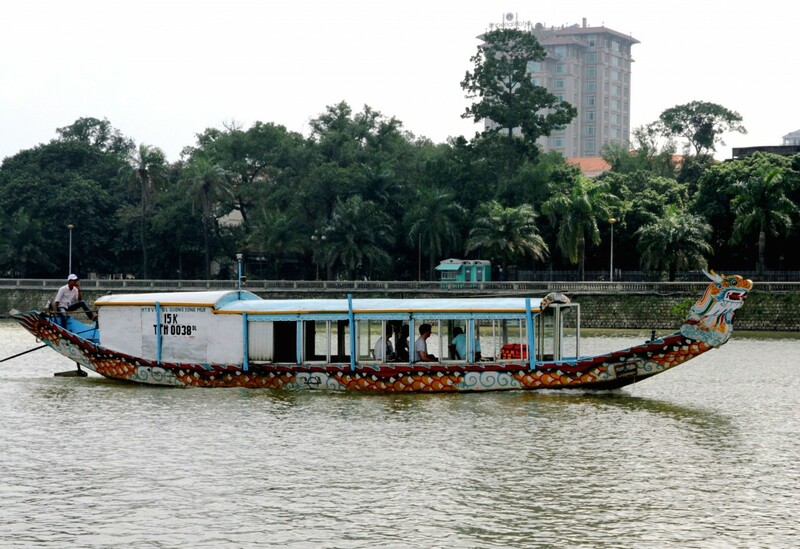 The story goes that the ferryman needed extra income and so he opened Lake Ferry hotel in 1851. After unpacking and sorting our bikes, the sky was blue and the wind was pretty strong, but we decided to brave the wind and go for a walk down to to the beach. We saw a few people fishing and also saw a vehicle stuck in the soft sand with lots of people trying to push it out. Alas, it was going no where and the local tractor was out on another job so the family (on holiday from Australia) had to wait for a tow-truck from Martinborough! They waited in the hotel enjoying some food and drink. I believe they finally got their vehicle out close to midnight! 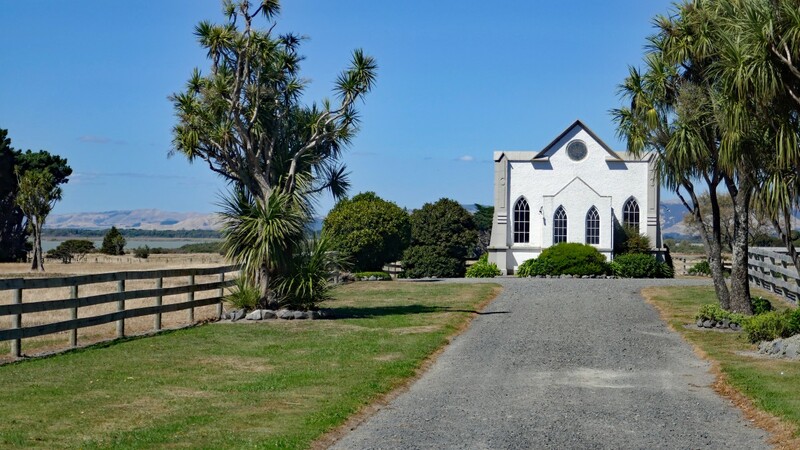 After a few close encounters with some cockroaches in the shower we enjoyed some fantastic whitebait fritters and wine and had the hotel to ourselves after 9pm. 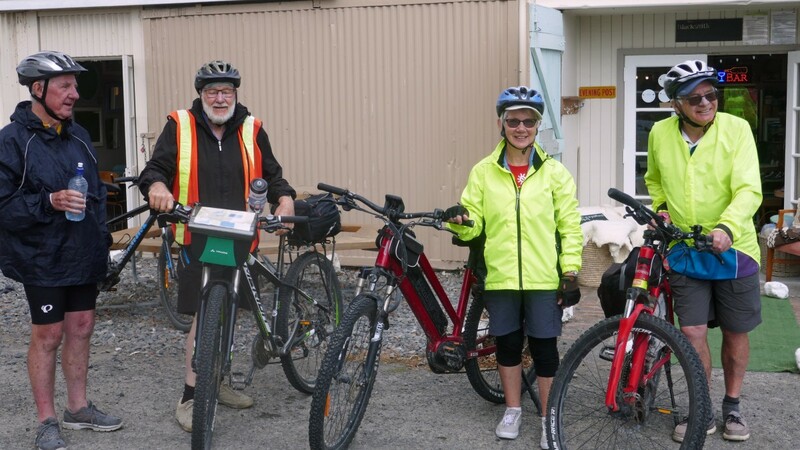 The rain started during the night and did not ease during breakfast but we had to get 11 bikes and 11 people to Martinborough by 14:30 to get a lift back to Petone to collect our cars so there was nothing for it but to get on our bikes!! We ensured everyone knew the way – it was very straight forward but was also on a main road that could be a little busy so care was needed. We all set off at different stages and some chose to stop at the Land Girls cafe again for coffee but i decided I was wet and miserable so kept going. 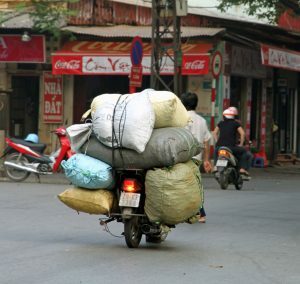 There was nothing for it but ‘head down and bum up and go’ on the e-bike. 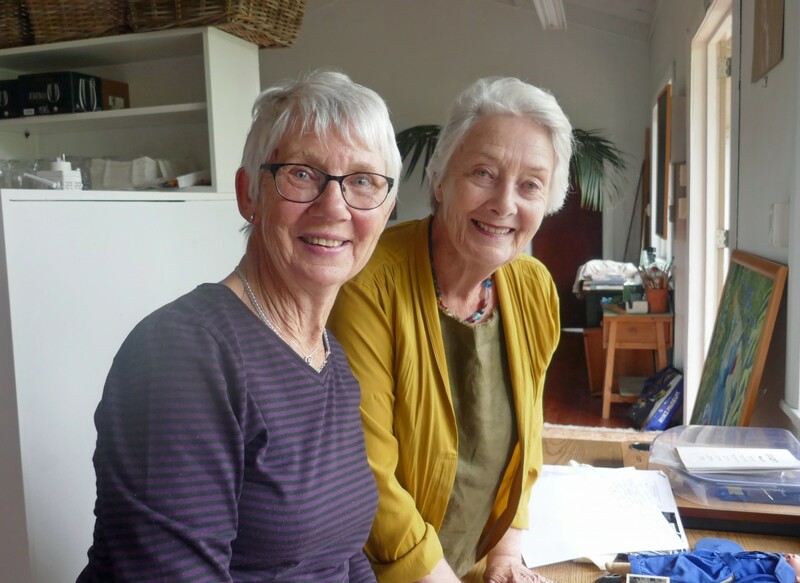 I was within a few kms from Martinborough when an ambulance with flashing lights passed and I thought to my self – I do hope that is not for one of us……… but when Marcia caught up to me she told me it was indeed for one of us. Chris had come off her electric bike and hurt her shoulder. 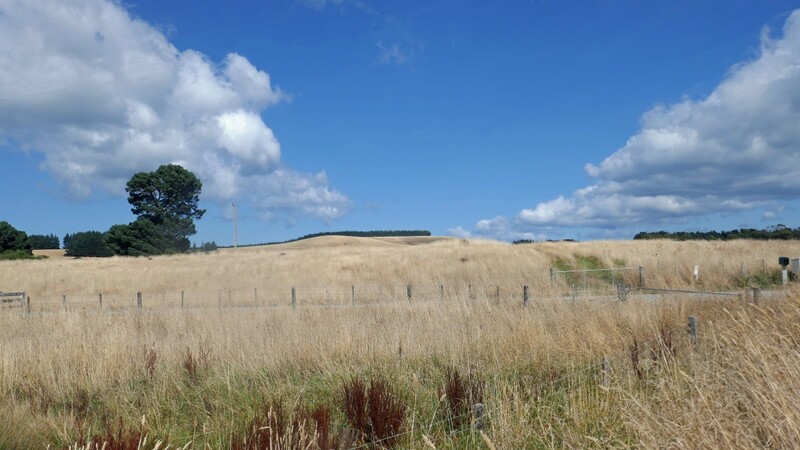 She was taken by ambulance to Masterton where they discovered she had fractured her humerus. 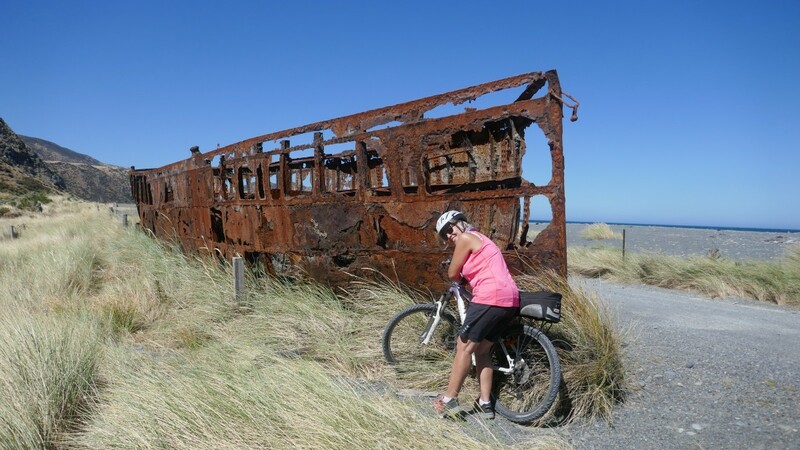 Poor Chris – what an end to her biking holiday. 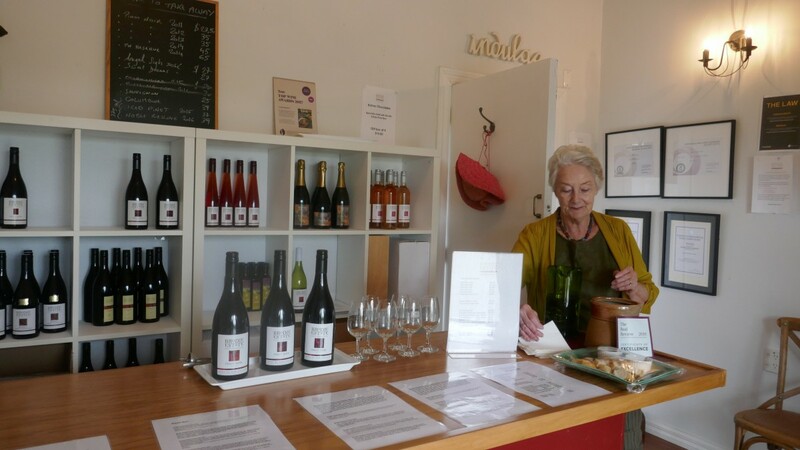 While the rest of us went wine tasting in Martinborough she was in a collar & cuff sling and taking painkillers! Not an ideal way to end a holiday. 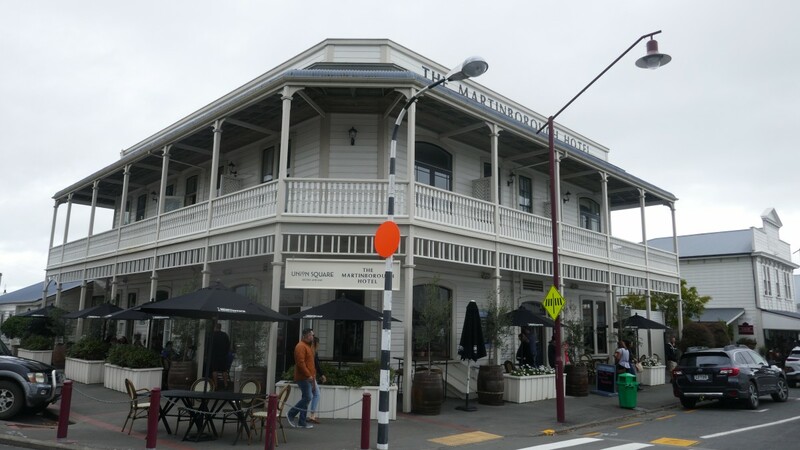 We had three nights in Martinborough, visiting the vey pretty Greytown in the heart of the Wairarapa, which was a great hit with everyone. 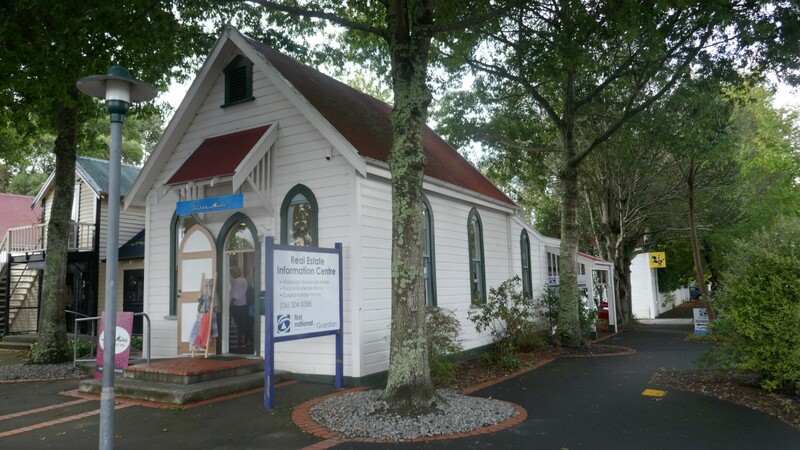 In 2017 it won New Zealand’s most beautiful small town award! 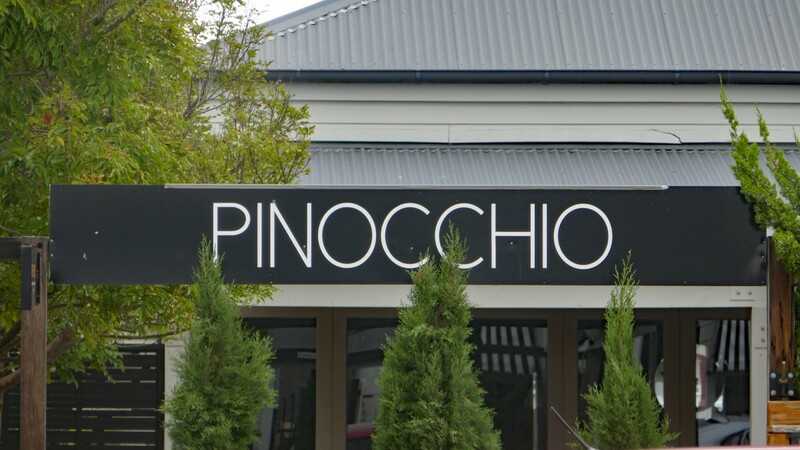 On our second to last night we ended with a dinner at Pinocchio Restaurant, Martinborough – great food and wonderful ambience. When we arrived we discovered we were sitting outside and it was a chilly evening and we did not come dressed for outside dining! 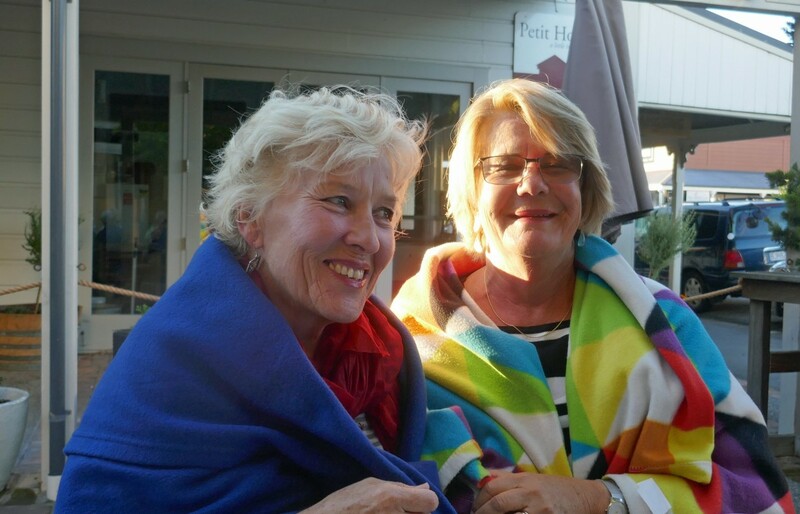 But we were supplied with warm blankets which cause lots of laughter and fun! 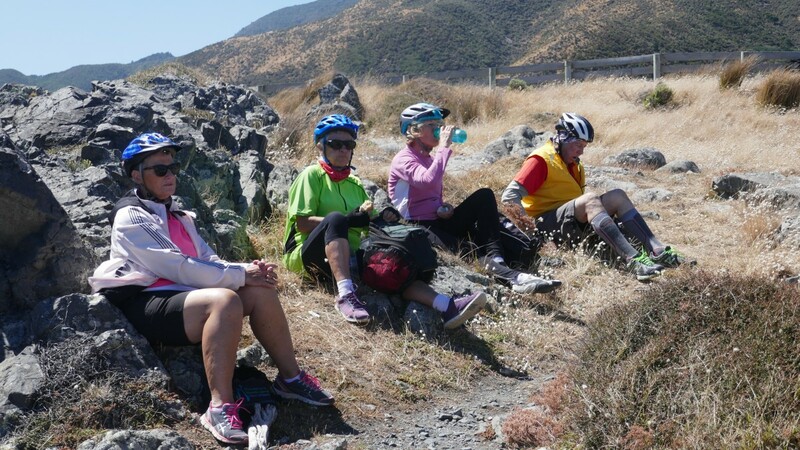 Heather & her friend Louise who joined us on two of our rides and again in Martinborough for the weekend. On the last day we went wine tasting at “On Giant’s Shoulders” & “Brodie Estate” and enjoyed both very much. 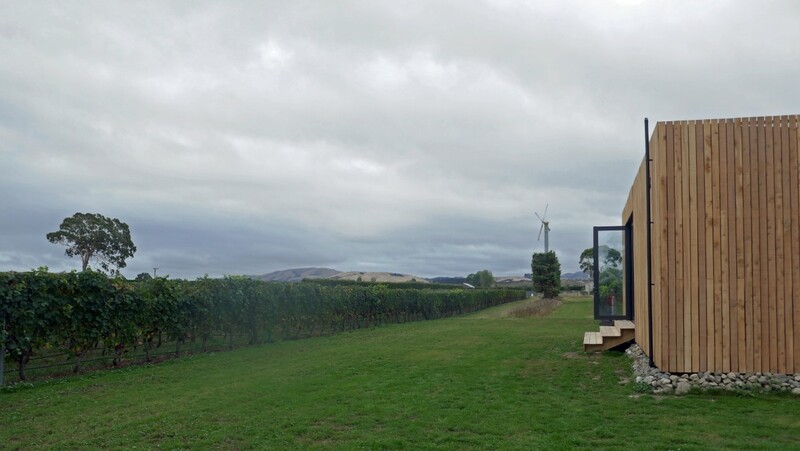 On Giant’s Shoulders is a very old vineyard with a young owner just setting up for wine tasting and can only do it privately until he gets a licence. 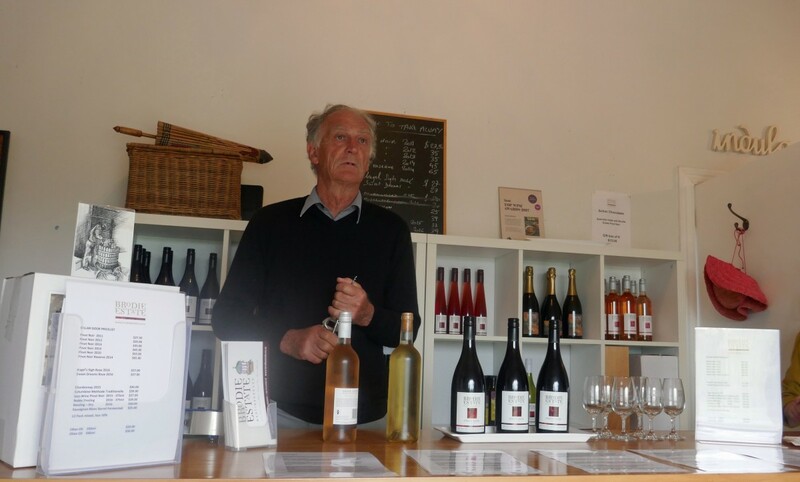 Brodie’s Estate has a new owner and the Brodie wine is still been sold until it runs out! 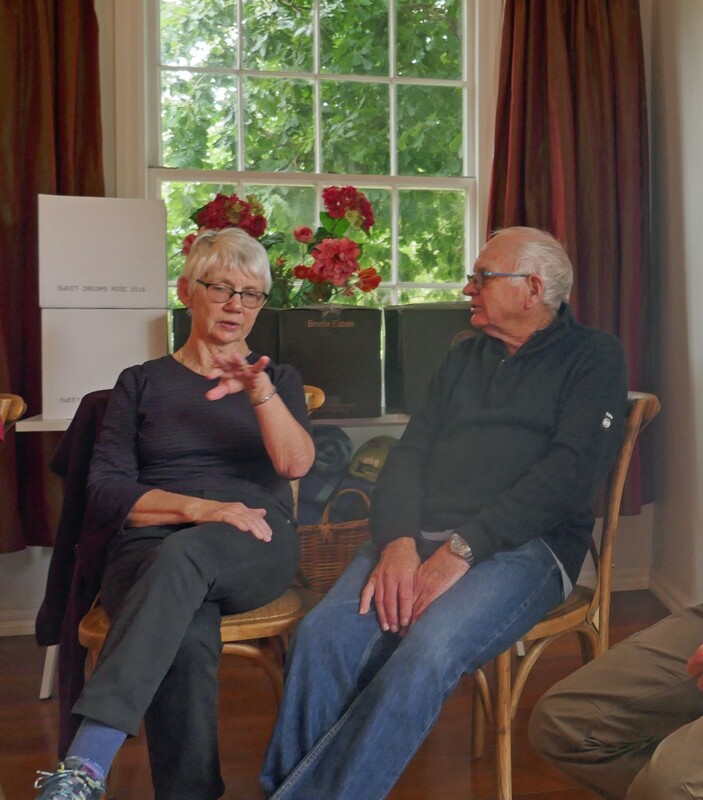 Helen & David – serious discussion!! 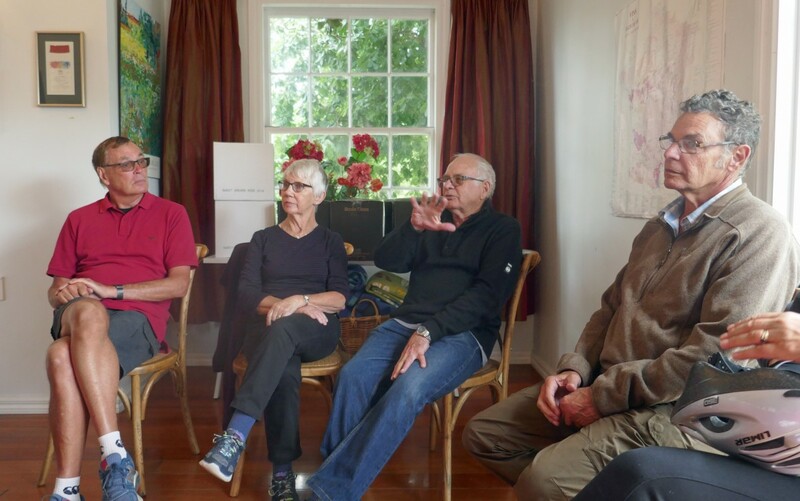 Wine is a serious topic – Peter, Helen, David & Bob! 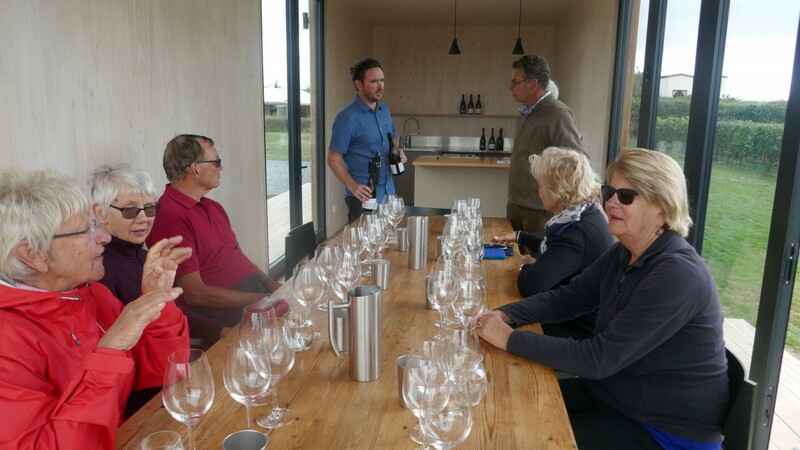 James – telling us about the wines! 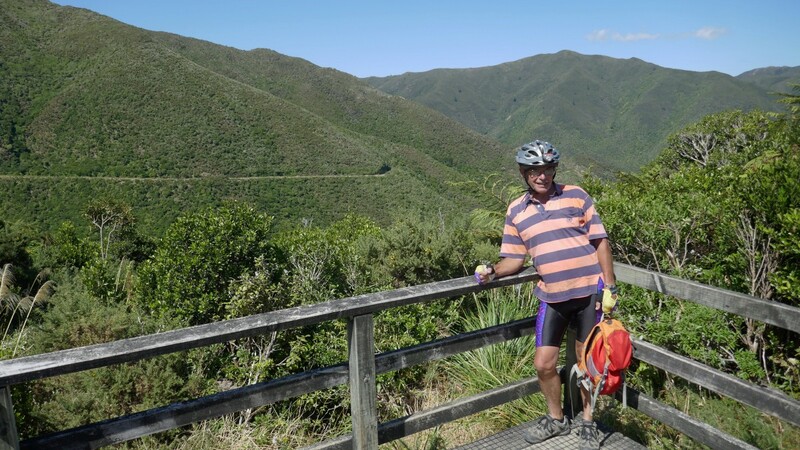 Despite Chris’s accident everyone loved the bike ride and of course the beautiful countryside – a glorious part of New Zealand. 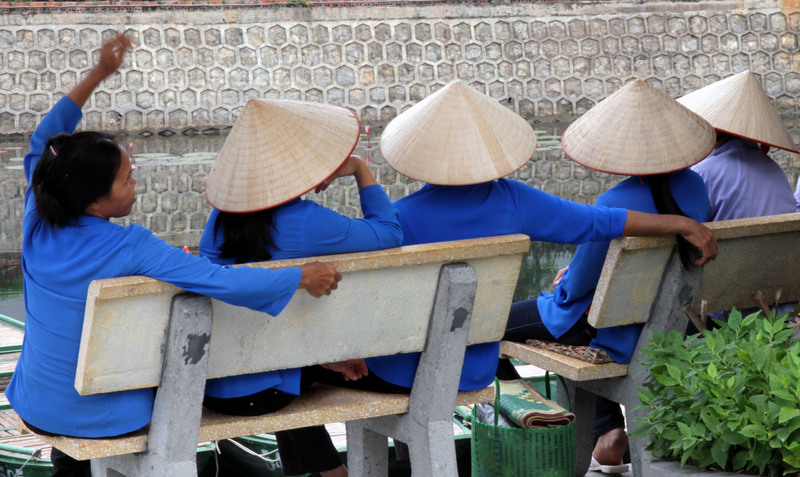 Vietnam – 24 fantastic days in Vietnam! 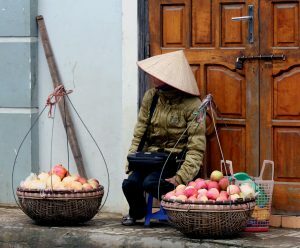 From Sapa in the north to Phou Quoc in the south – Hanoi, HCMC, Hué, Hoi An……..
We finally arrive at Hanoi at 13:10, 3.5 hours after leaving KL. We looked for our name amongst the many drivers with name cards but we could not find it. We had booked an airport transfer before we left with our hotel (this is something I do where possible in any Asian city I travel to). We were not really expecting anyone to be waiting as our plane was early so we just waited and watched everyone else try to find their names amongst the hoards! Finally Marcia spotted our name and the driver behind it and we realised he had been there all the time! 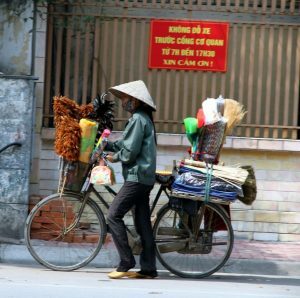 He took us to our hotel called ‘Little Hanoi hostel’ where one of the women from the hotel met us with money to pay him. It was all arranged as part of the deal if you stayed two nights in the hostel. 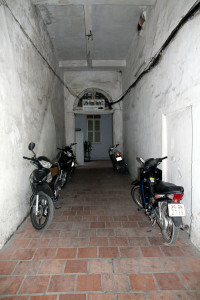 We entered the hotel through a long tunnel, which had bikes parked on either side of it and we passed several homes as we walked down through the alleyway. 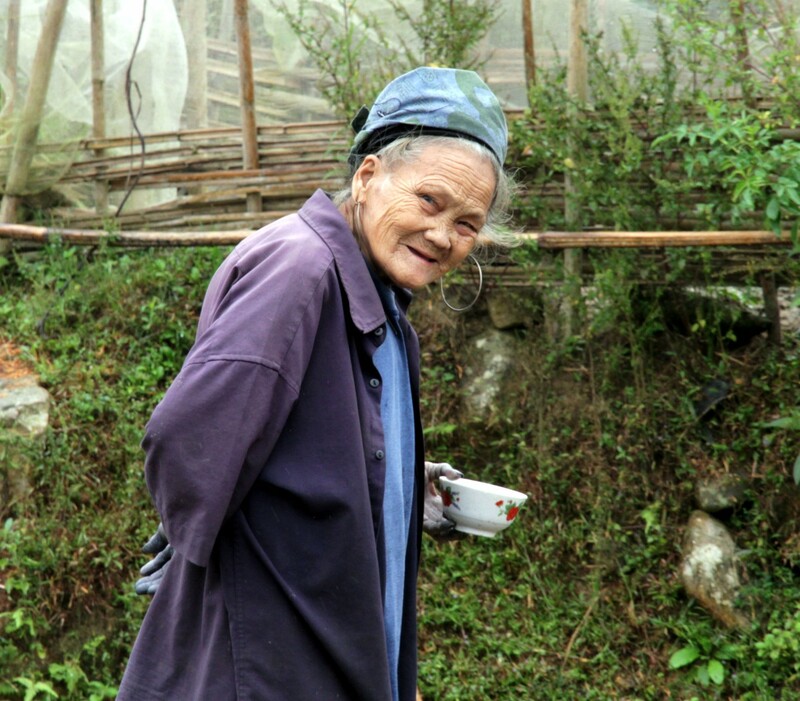 We arrived at the hotel to be met by Chin (pointing to his chin) who gave us some hot tea without milk and sugar – Marcia may eventually get used to it. He asked us our plans and asked why we had not booked things through him! We then planned a tour with him for the following day and asked where we could see the MATCH, Chin assured us we could see it in our room! The match was the final of the rugby world cup where NZ were playing France! It was 23 October 2011 and the match was being played at Eden Park in Auckland and NZ won 8–7 close but sweet revenge for last time! 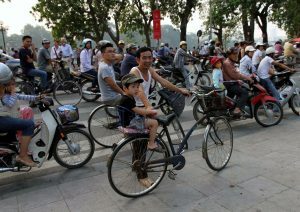 The whole family travel on one bike! 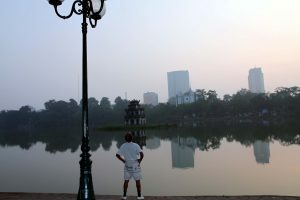 Went for a leisurely walk around the Hoan Kiem Lake drinking in the smells and sounds of Hanoi and starting our love/hate relationship with scooters/motorbikes. The hotel was just minutes away from lake – a short walk through the alleyway, cross the street and you are there. 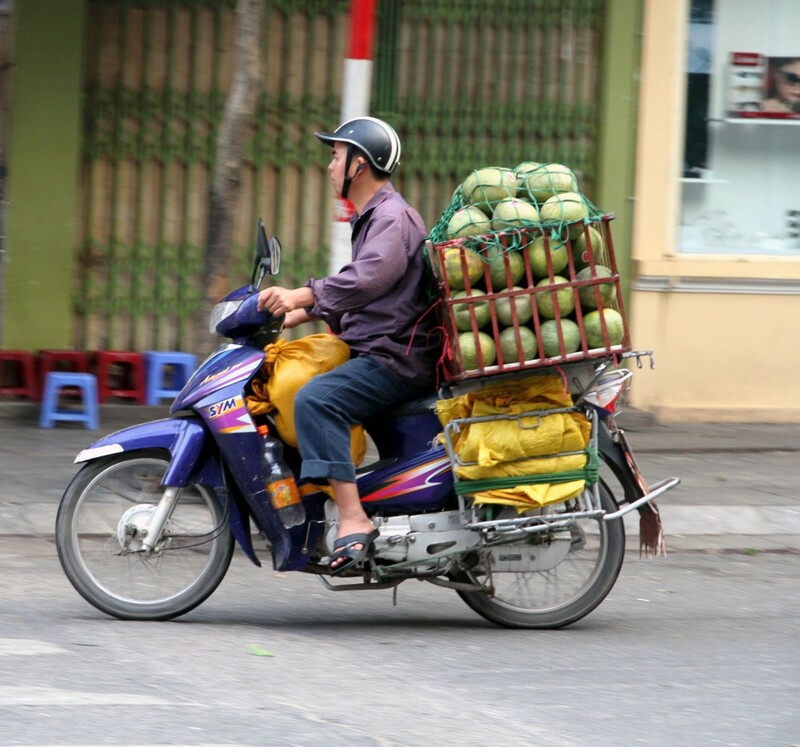 Now I make that sound so easy but alas no – you take your life in your hands – you could be bowled by motorbikes, scoters, bikes, cyclos or cars. However, the plan, according to our research was to start across the road like you mean it and keep going at all cost! Our first few ventures across we waited for some locals who looked like they were about to cross and then stuck like glue to them when crossing but after a few trial runs we finally got the hang of it. 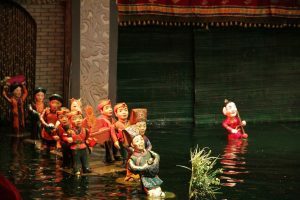 Our trip around the lake was great-we spotted a lovely place to eat for the night, not far from the hotel and booked the water puppet show for the following Wednesday after our few days on Halong bay. We saw hundreds of locals on scooters, motorbikes and bikes carrying everything under the sun that could fit on their bikes – kids, flowers, hats, fruit, boxes and some had piled crates of vegetable so hight they could not possible fit but somehow these crates managed to moved along the road – finding who was driving was impossible as they were completely encased within the crates! We observed many combinations of groups, families and friends on bikes – two adults and two kids, three adults and two kids, or two women in dresses and high heels, many without helmets. We came across a row of bride and grooms having their photos taken in various positions in and around the lake and in one of the many pagodas by the lake. We learned later that many of these were photo shoots many weeks or months before the actual wedding day so they can show their photos at their special day. I never did find out whether they repeat the process on their actual wedding day. 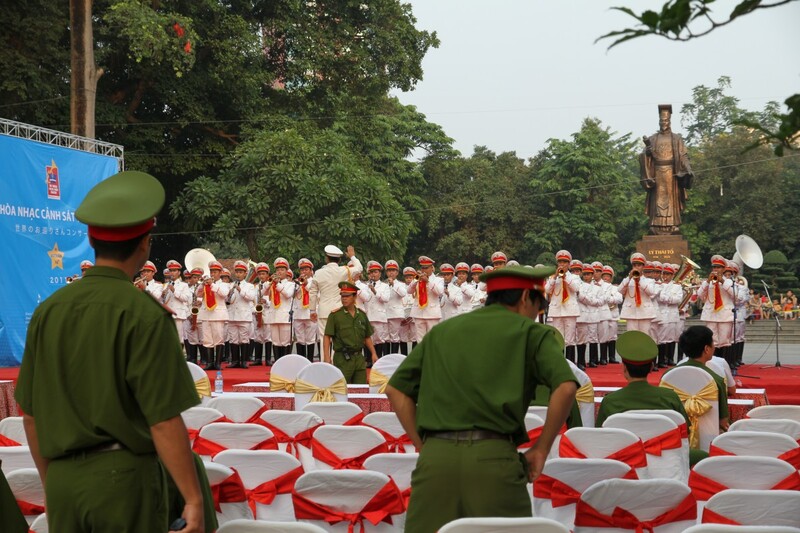 As we walked around the lake we came across a stage set up with chairs covered in white with red sashes and then we noticed a large number of military men in the same colour uniform carrying various brass instruments. They moved toward the seat so we stayed to watch and listen. One sensed a military reluctance for us to be present and eventually they moved us back outside a cordon. We then wandered on to the joys of discovery around the rest of the lake, so many new things to look at and admire . 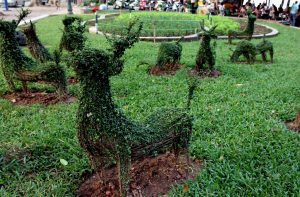 Vietnamese seem very keen on bonsai and topiary-we walked past a herd of green leafed deer sitting close to the traffic lights created in topiary. We strolled down the lake to dinner at the restaurant we had passed earlier as we walked around the lake mostly chosen for its beautiful setting by the lake. We chose a beef dish which I had seem recommended but were very disappointing as it was tough and tasteless. Marcia had a local beer which she did not like. I asked for wine and was promptly told I could have red or white – French red or white, no name no choice, I decided to play it safe with red and it was just ok. It also took us some time to get use to the local currency, the dong, as many prices were in dong and $US so we needed to convert back to NZ. Finally got it sorted $US1 = 21,000dong. Walking back to the hotel around the lake was a different experience than earlier in the day – the lake and Hanoi city had come alive. 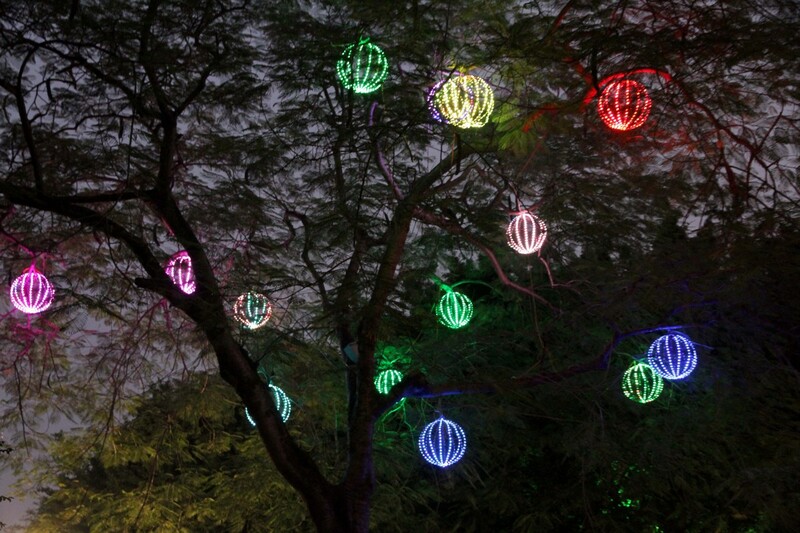 There were coloured lanterns in the trees all around the lake and all the building we passed were brightly lit up. 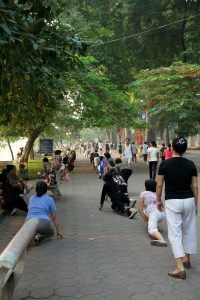 Every citizen of Hanoi were walking/running/jogging around the lake, couples were strolling along hand in hand and some Tai Chi classes were being held. Still lots of car and bike horns and hundreds of bikes snaking through the traffic but everyone seems happy. Families were wandering along laughing and talking together and lovers were sitting close together on the many seats along the lake front. It was magic. We did not want to leave such a rich atmosphere but jet lag was beginning to hit so we decided to hit the hay at about seven pm as we had a big day the following day. We slept a whole eleven hours and woke remembering the magic of the lake from the night before so off I headed to walk around the lake. 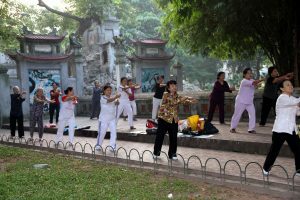 It was like a gym, groups of women and men doing Tai Chi to music – very loud music! 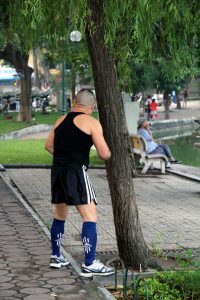 Men were using trees for boxing practice, women using benches for bench presses, and pavements for steps ups – who needs to belong to a $600 year gym when nature can provide all? 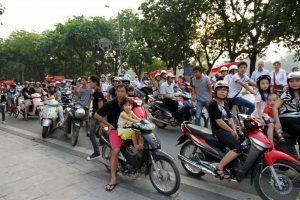 Took lots of photos and watched the 20% of Vietnamese in Hanoi who were Catholics arrive for service in a church just down the road from the hotel-mostly they arrived on motorbike and scooter. 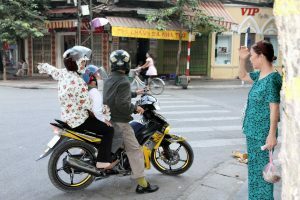 Women rode their scooter in high heels and gloves with their best dress and helmet. 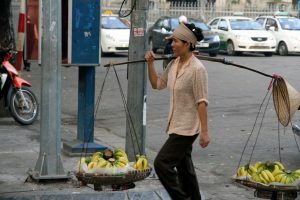 Women walked the streets carrying two huge containers of fruit each container strapped to a bar that she balanced across her neck. She would stop and sell her fruit to people as she walked along. I noticed that most of the street cleaning work is done by women who carry rubbish on their backs and on their bikes. 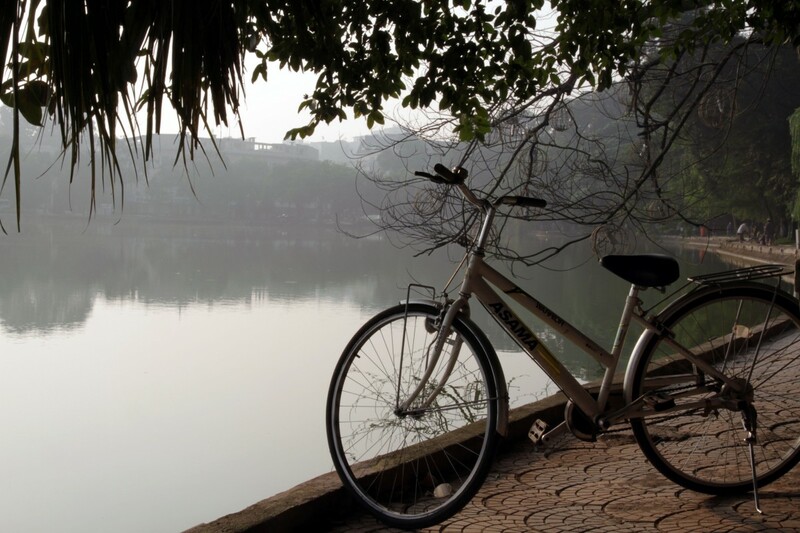 After few hours walking the lake and streets I headed back to Little Hanoi hostel for breakfast of chicken noodle soup and roll it was very different and really tasty. After breakfast Kevin from our tour came to collect us – strange young man learning the tools of his trade but sense he has a long way to go. Out tour took us all over Hanoi which was very exciting and we went to a lovely old pagoda which was a Buddha temple abd was halfway through being restored. 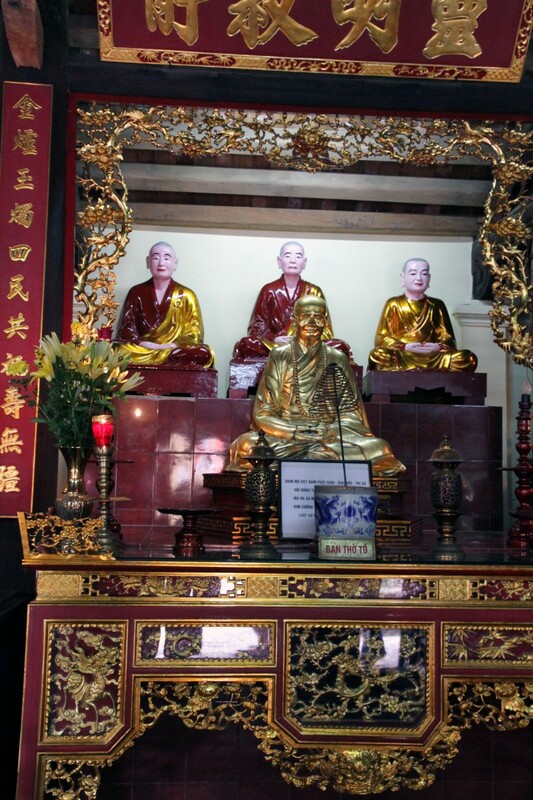 though in the middle of restoration there were many worshipers there paying their respects to Buddha. 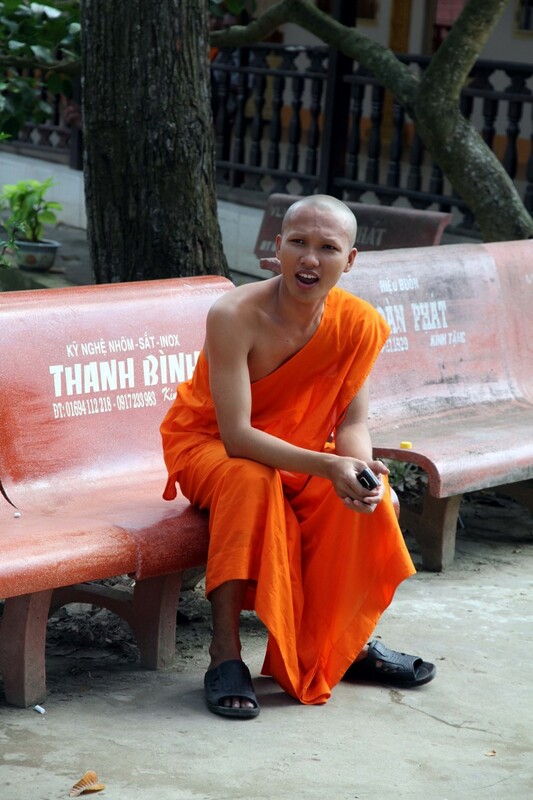 Kevin told us that 80% of Vietnamese were Buddhist. 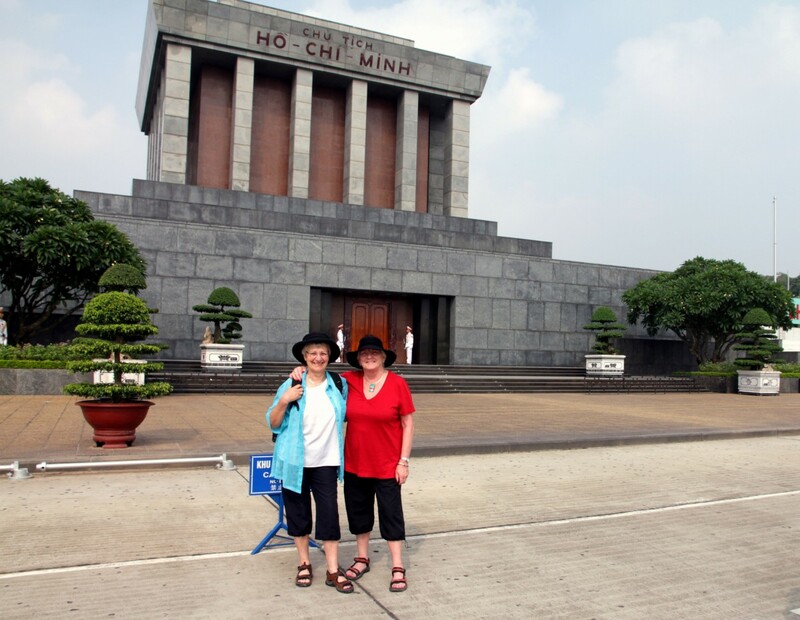 Our next stop was Ho Chi Minh Mausoleum a large memorial located in the centre of Ba Dinh Square,which unfortunately for us was closed for November & October but we did wander around, take ohotos and hear the history from Kevin. 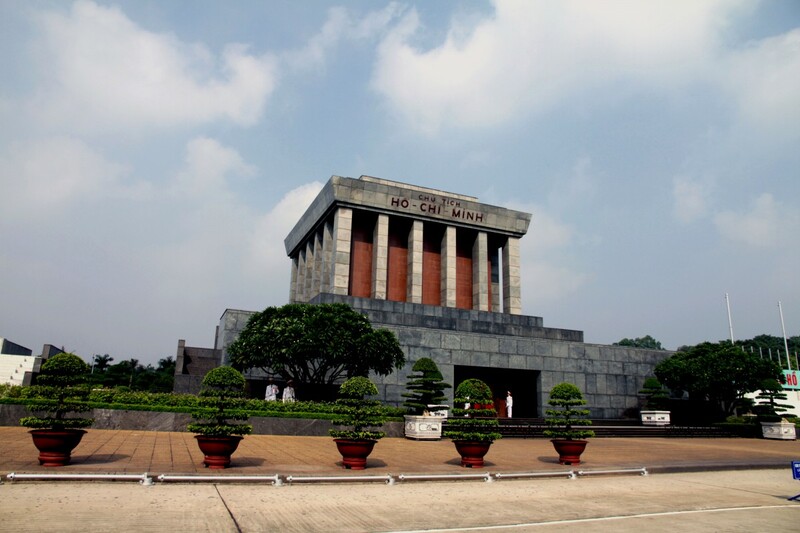 Then on to the Vietnam Museum of Ethnology which focuses on the 54 officially recognised ethnic groups in Vietnam and then on to the The Ho Chi Minh Museum dedicated to the late Vietnamese leader Ho Chi Minh and Vietnam’s revolutionary struggle against foreign powers. 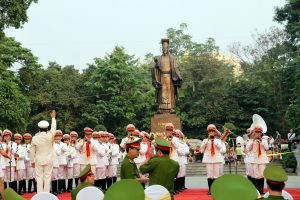 Both were really educational but at the latter museum, the guide earnestly and proudly told us about Ho Chi Minh’s influence on his people, about his life and the effect he had on the history of Vietnam. 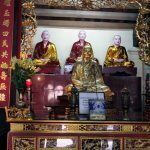 We visited several more temples, mostly buddhist temples. It is worth noting that each museum we visited we were restricted to certain areas – however, I suppose that happens at most museums. 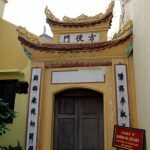 We then wandered through the old quarter and to the visited the smallest pagoda in the world with only one beam called ‘the one Pillar pagoda’ It was charming and there was a spiritual sence within it. 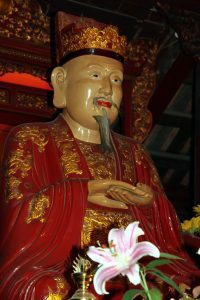 rumour has it that “that one ageing Emperor, Ly Thai To of the Ly dynasty, who had no children, used to go to pagodas to pray to Buddha for a son. 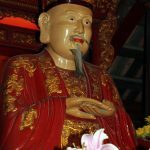 One night, he dreamt that he spoke to Bodhisattva Avalokiteshvara, who was sitting on a great lotus flower and gave the King a baby boy. 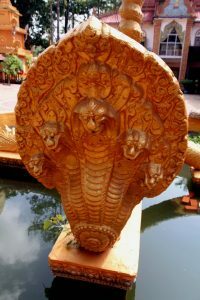 Several months later the Queen gave birth to a male child and the Emperor ordered the construction of a pagoda supported by only one pillar to resemble the lotus seat of his dream in the honor of the Bodhisattva Avalokiteshvara. 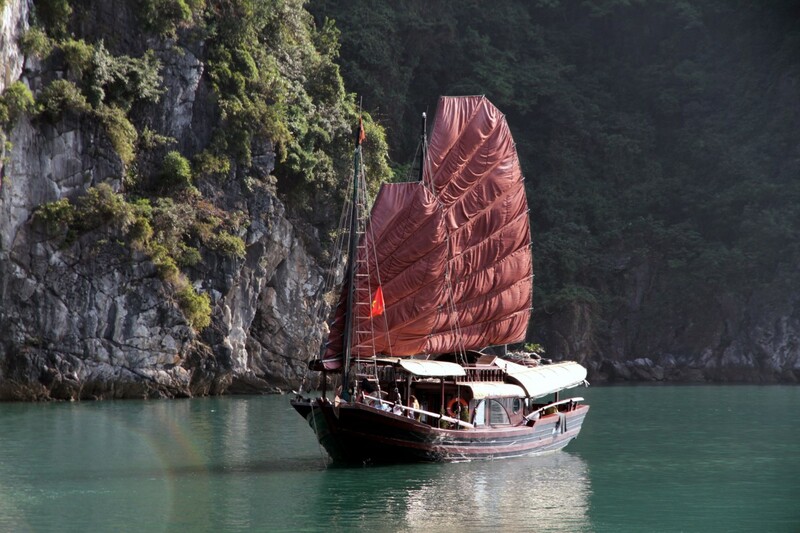 There is a theory that the pagoda was built in a style of a lotus emerging out of the water”. One the way home we stopped at a pretty run down place where goods are made and sold to help Vietnamese suffering from effects of Agent Orange. Many were born with no eyes or very limited vision. While we were there a man walked passed leading a young man who had a white stick and there were four other young men each with hand on shoulder of the person in front all obviously blind. Our lunch stop was the least exciting of the day, we were brought to a small hotel-like building and we were served chips for our first course!!! The rest of the lunch was Vietnamese food and was ok – nothing to get excited about. 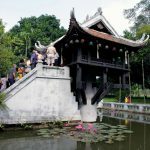 Next stop Van Mieu-Quoc Tu Giam (Temple of Literature), now considered one of Hanoi’s finest historical and cultural sites. 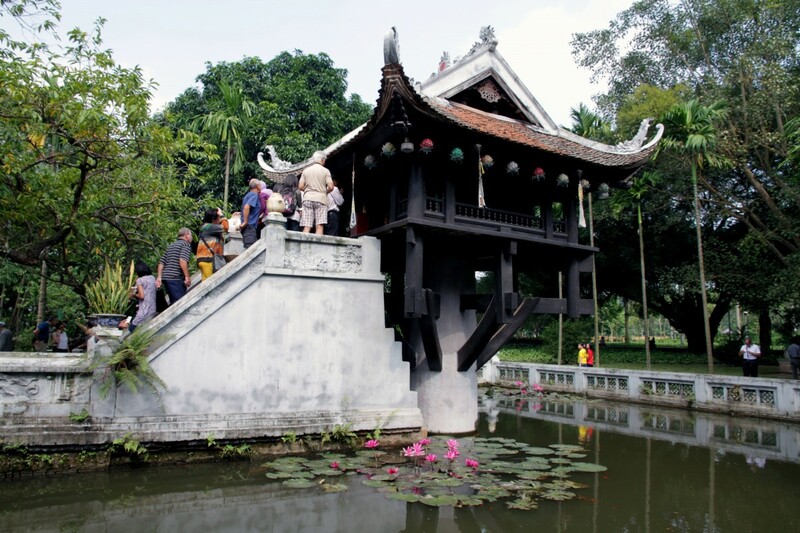 The Temple of Literature, known as “pagode des Corbeaux” during the period of French colonisation, was founded as a Confucian temple in 1070. The university functioned for more than 700 years, from 1076 to 1779, during which, 2,313 doctors graduated. After spending some time there our driver took us back to our hotel so we could watch the rugby match. It was a nail bitting final right to the bitter end but thankfully the all blacks won out in the end…only just!! 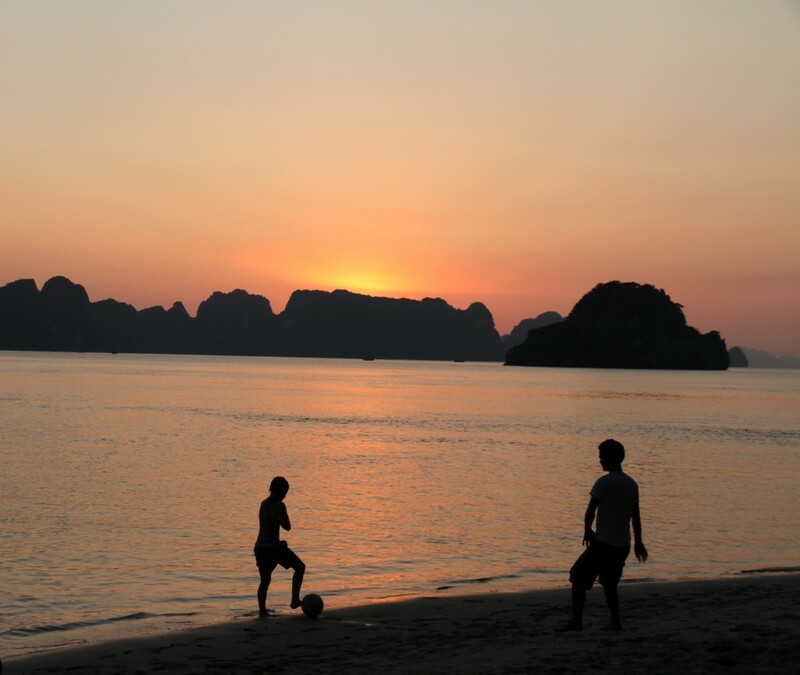 After the match we took advice on where to go for a good Pho soup and we were directed to a place called ‘Pho’ but it was very disappointing – a bit like a McDonalds of Hanoi and we were charged for two paper hand towels. We were picked up at 0815 the following morning by woman from “Indochina junk Company” for our ‘two night three day Halong bay trip (www.indochina-junk.com/dragon-legend-cruise/). 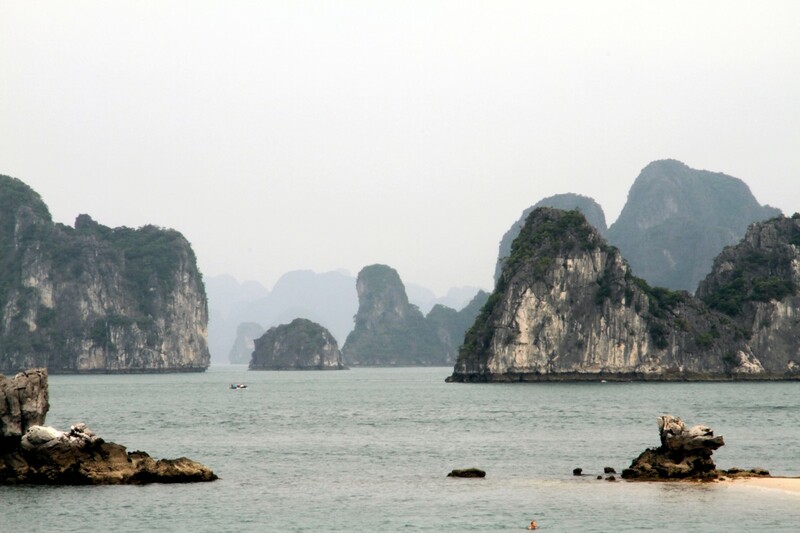 The drive from Hanoi to Halong Bay took about 31/2 hours. We passed women working in the fields in waist high water and cutting/harvesting the rice. 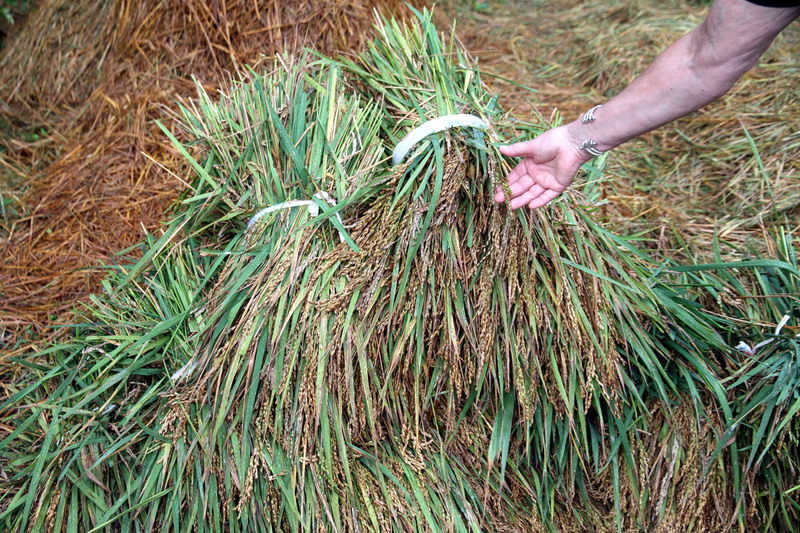 There were layers of rice husks laid out in every space available in tiny front gardens to dry. As it dried it was then raked to continue with the drying process. 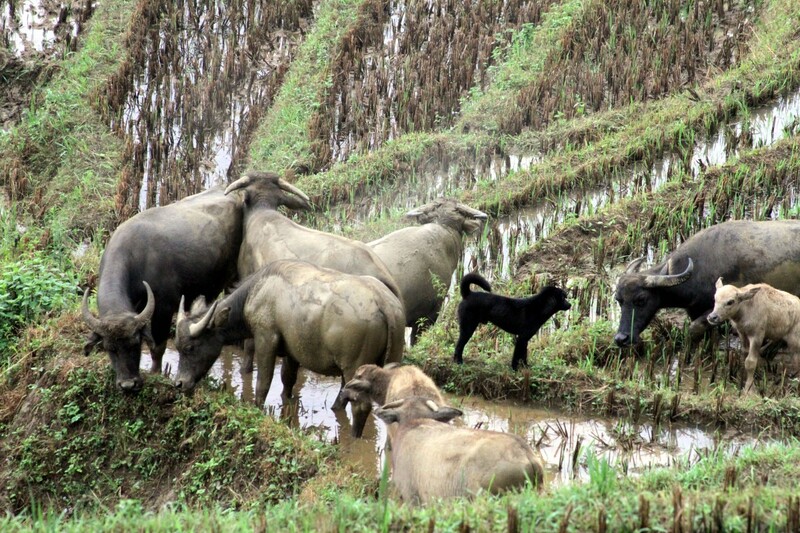 Most of this rice is keep to feed the family for the year. The road trip was somewhat hair-raising – there is no such thing as right of way on any of the roads – for our safety we had to pull over to let huge trucks who were attempting to pass us but on our side of the road! We we obliged to stop at several manual rail crossing. On one such occasion all the oncoming traffic was stretched right across the road in front of us leaving us nowhere to go. However, our driver appeared to know something we did not and proceeded to pull right across the railway track while the gate was still closed….we were all very nervous but somehow we got across and lived to tell the tale! On arrival at their headquarters at Halong Bay we were introduced to our fellow travellers and our guide Quyet who was to be our guide for the rest of the Halong Bay trip. 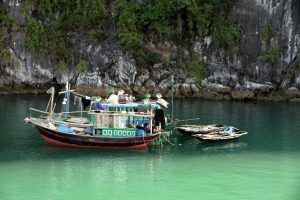 The whole bay was amass with junk boats of all sizes and shapes, some very crowded and others more luxurious. We were all checked in and given some information leaflets and then lead to a small boat that would take us out to our home for two nights – The Dragon’s Pearl 3. What a lovely junk very roomy and luxurious. 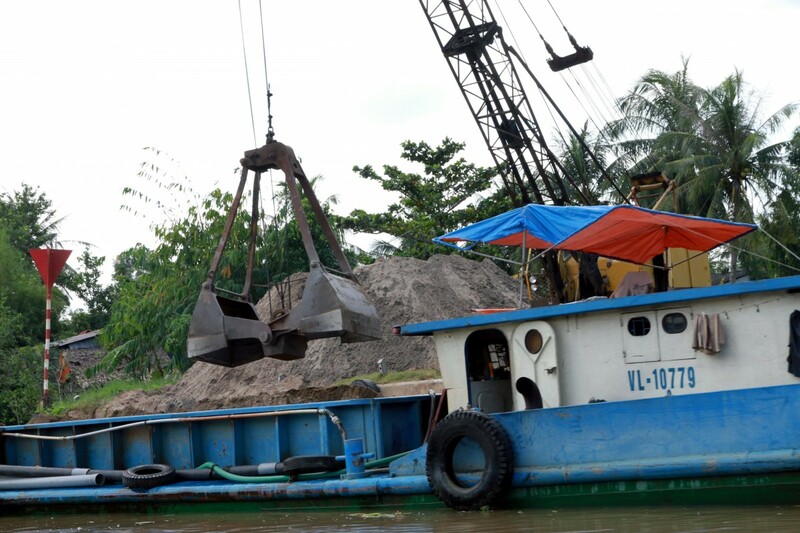 We were ferried back to boat and given an hour to get ourselves spruced up for a return trip to the island. As we approached the island we could see some lights in the distance and when we arrived we discovered the lights were leading up the steps to the cave where we were going to have dinner. 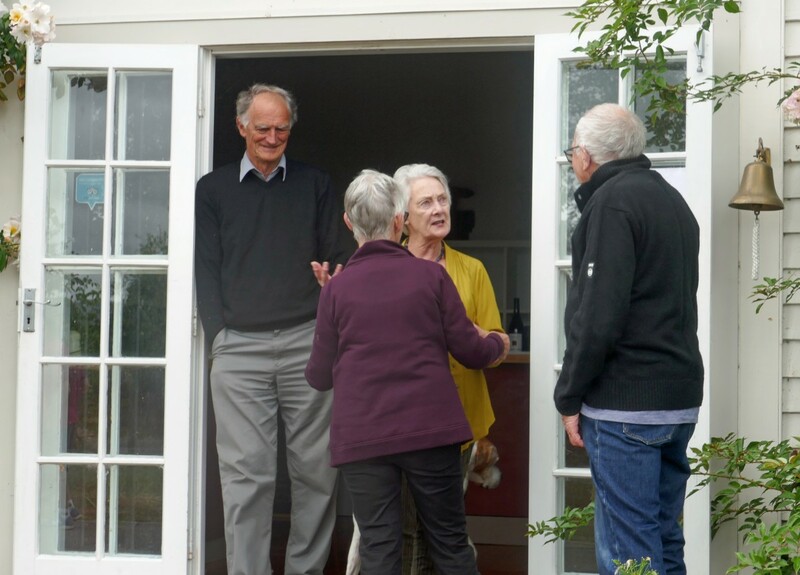 After a fairly steepish climb – following a wine which was handed to us on arrival on the island – we arrive on top of the steps but had to wait outside for a few minutes until they were ready to receive us. We were then shown into this large cave decorated with fairy lights on up some more steps to a larger cave – what a lovely surprise. There was a long table with pink and red rose petals scattered amongst several candelabras(with candles) on the table. We walked to the table amongst tea lights in the shape of a heart on the floor and to the applause and cheers of the whole staff. There crevices in the cave walls were illuminated with tea lights as well. As soon as we arrived so did our drinks – our order had been taken earlier, each person got exactly what they asked for. The dinner was made up of several courses, many of the dishes were BBQ because of lack of cooking facilities in the cave but were so tasty. 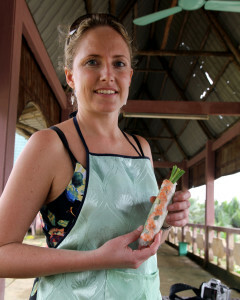 Each course came an elaborate creation carved from vegetables by the chiefs. 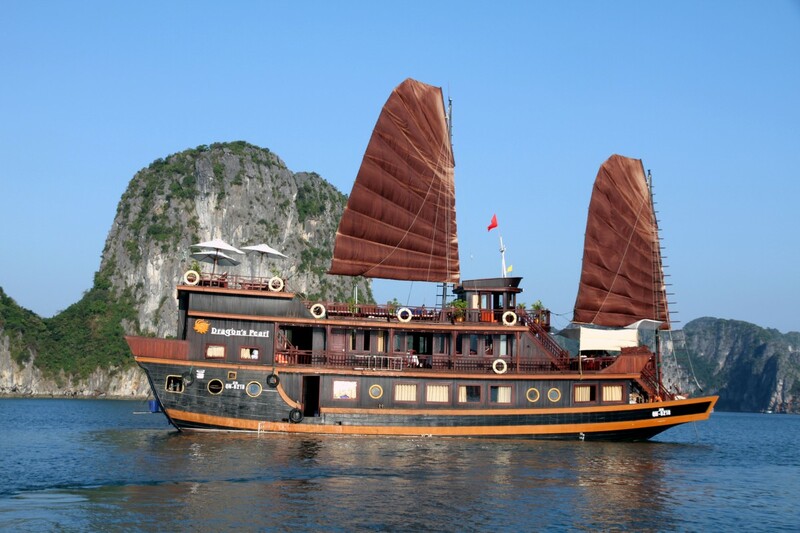 We had two swans, one large bird like eagle and finally a replica of our boat. The staff were all so very pleasant, friendly, helpful, smiling and appeared happy in their work. The whole experience was a little surreal capped off by a boat ride home amongst the tall limestone craggy rocks and then to bed. 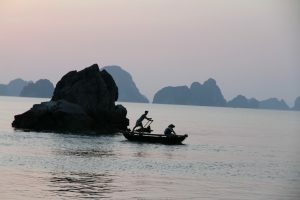 I was up on deck early next morning and saw some local fisherman catching their food for the day. After breakfast – another fantastic feast – we went in the smaller boat to an anchorage and were given the opportunity to kayak again, but it was so windy we decided to just to stay locally and just paddle around – we were so glad we did as thoes that went with the guide came back exhausted having to fight the wind the whole way back. Back to our junk for yet another multi course scrumptious lunch. After lunch we were treated to a trip in a local boat to a remote village and we were just about ready when suddenly several women from the local fishing village arrived in their boats to pick us up and take us there. 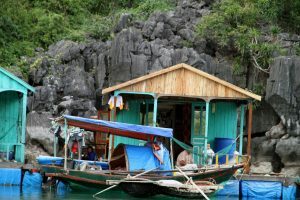 They took us to the heart of Bai Tu Long Bay, where Vung Vieng floating village is located, the village seems to be immersed in the quiet and peaceful atmosphere and was surrounded by craggy rocky mountains. 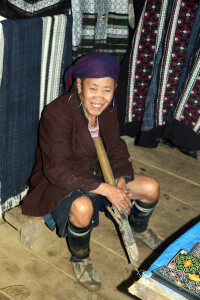 The villagers were happy to show us their traditional nets and how to cast them and pull them up. 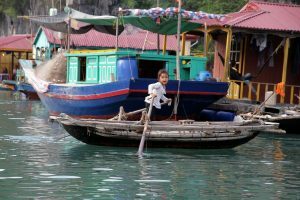 Children learn to swim before the walk and lean how to handle a boat – we saw a five year old hop into a boat and row herself across the water to another floating house on the other side, nobody seems in the least perturbed. 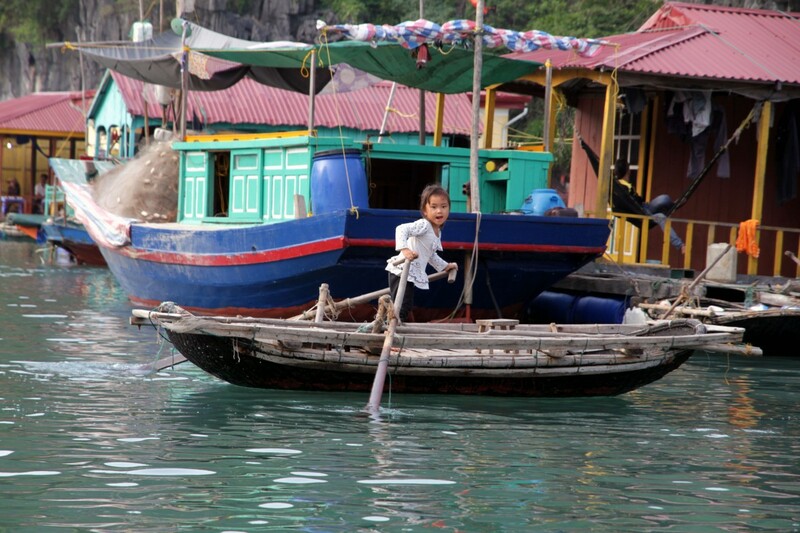 Only 160 people live in the village which has been created since UNISCO made Halong bay a heritage site in 1994. 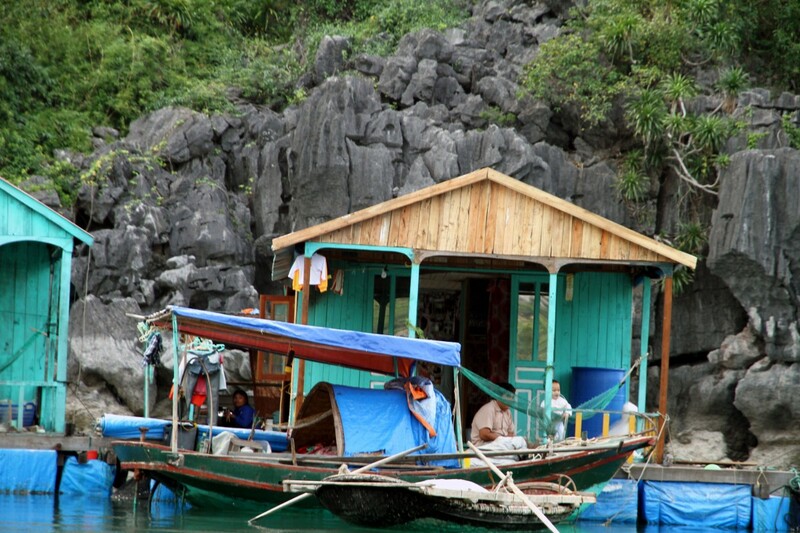 Before the floating village was established people live in small groups in caves. 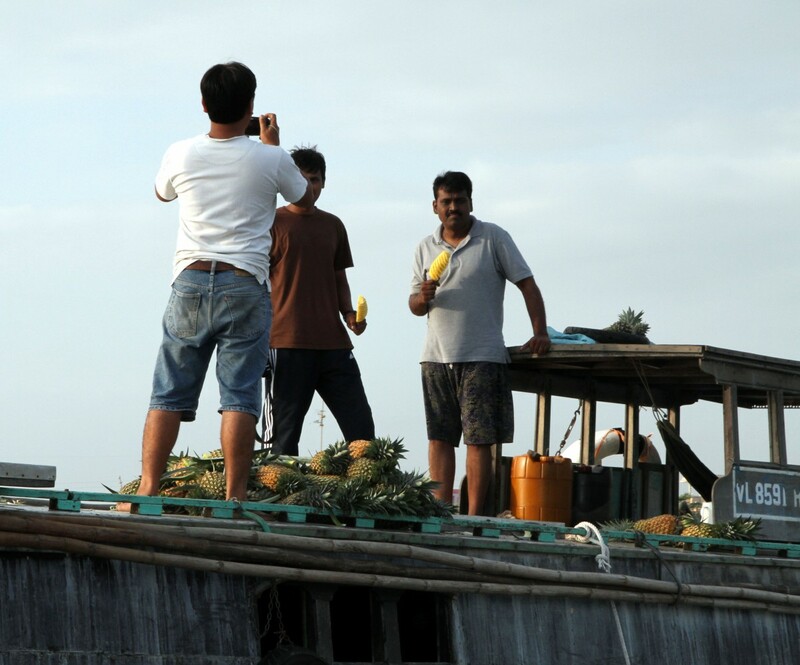 Now they have been brought together and support each other, they fish and sell items to the public who come to visit. 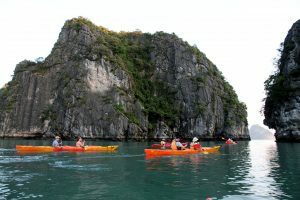 There are four villages in Halong Bay and each touring company seems to work with certain villages to ensure people come to visit their village. 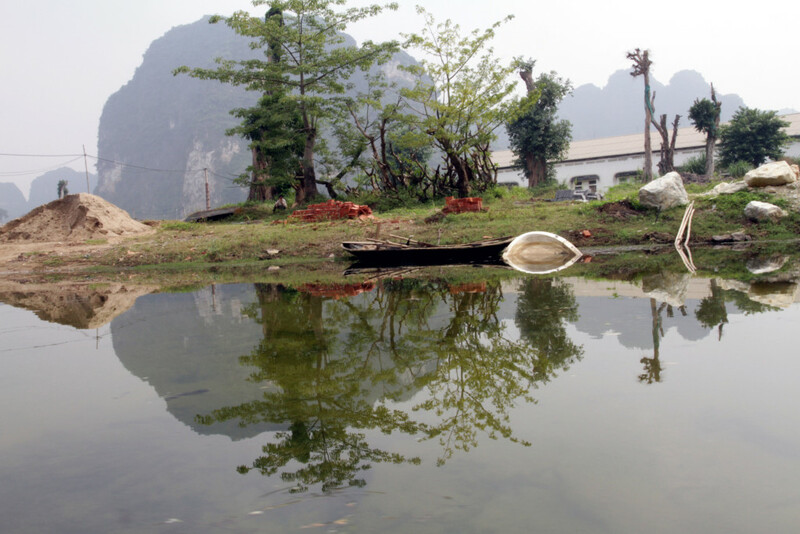 In this village they elect a chief and that same person is the chief for 7 years. His house is made up of just two tiny bedrooms and one living room for six people with kitchen outside. All the villagers love karaoke and have TV in houses. Dinner for family of four! 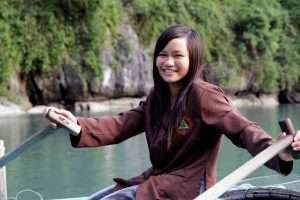 Once loaded onto their small row boats, they first took us through their village to a beautiful lagoon beyond, allowed us to paddle their boar – Marcia had a go and did a good job, not easy to do. 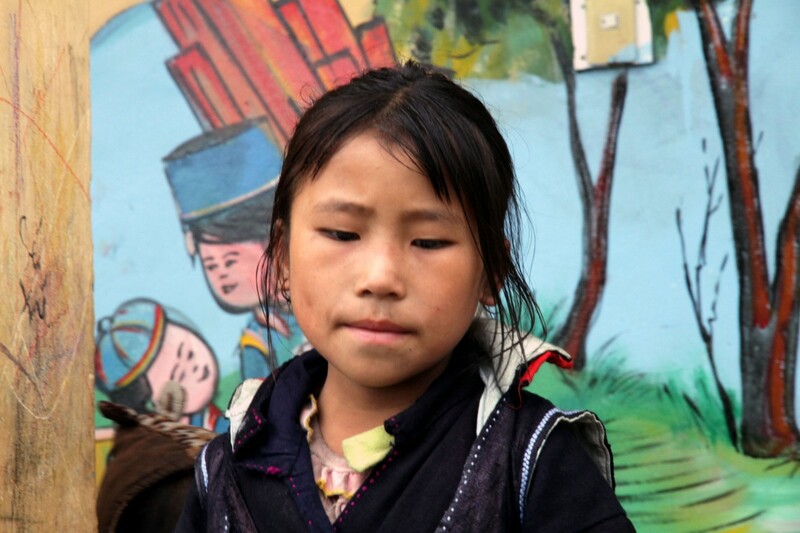 When in the village we were allowed to enter the schoolroom where we saw all kids doing their school work. We brought pens and sweets for the kids and bough some goods from their shop, a buffalo horn comb and some book marks. The villagers appear to be very poor but are becoming more affluent with the incoming tourist. 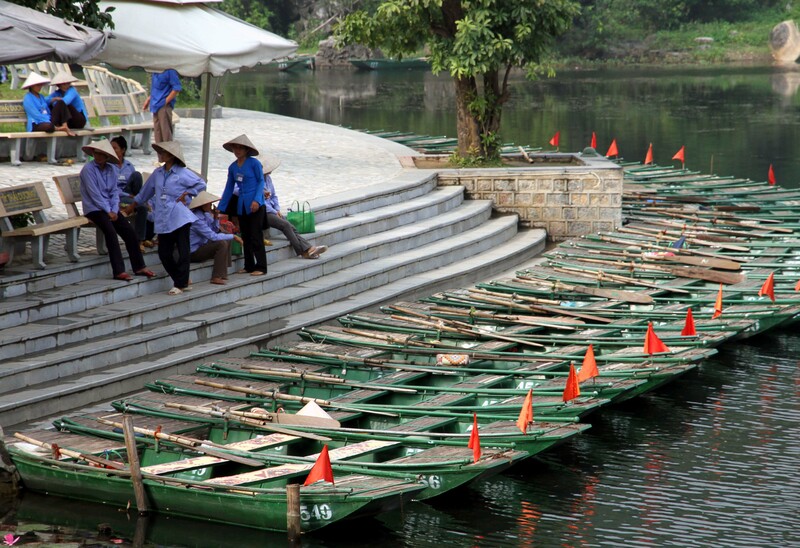 Beautiful young women and many small girls were very capable at rowing their boats – not a mean fete. We also gave some money to the person who rowed us -it appears that the rowing is shared equally between all the families so the proceeds are shared equally and it is all fair. It was a wonderful trip and will be remembered for a long time. 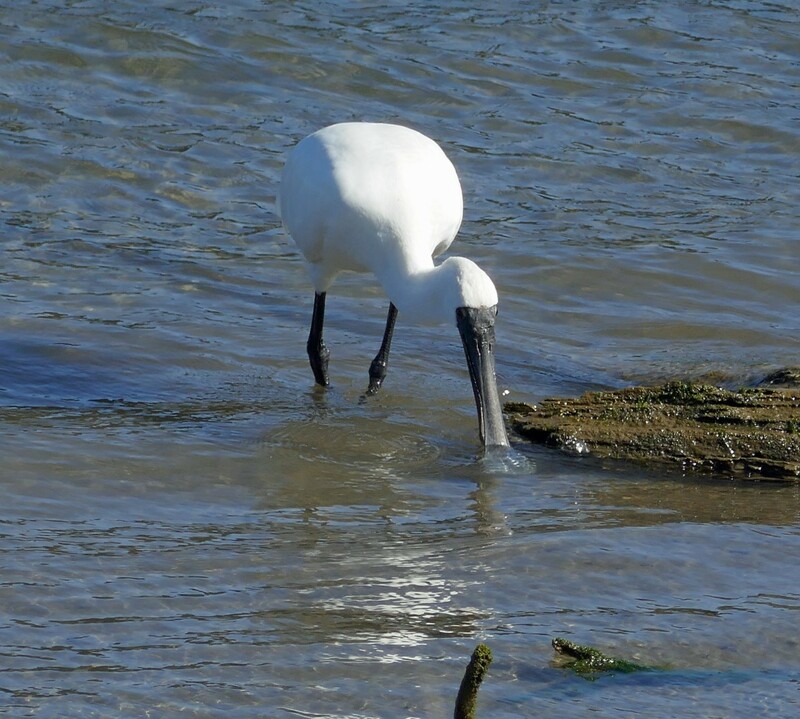 Back to our junk for a shower and a change and more food food…food…. The group on board the vessel were a mixed bag -Su and Bill from Byron Bay, Australia, Elaine and John from Tunbridge Wells, a family of four from Melbourne, two Canadians friends, fours friends from Melbourne, two people from Malaysia, two more from Oz plus, young English couple and another English couple who husband had had a bad bike crash two days before they left England. All very pleasant people, oh and a mother and daughter from India. 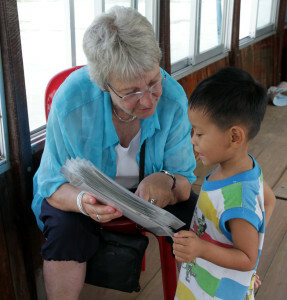 We are likely to meet many of them again as several of them mentioned they were heading to sapa on the train tonight. Last morning on boat, got up early to look for sunrise. 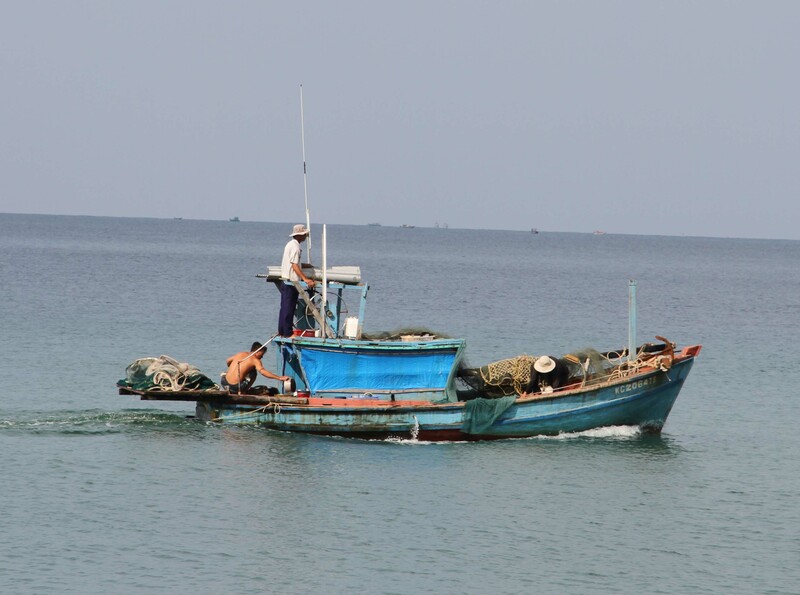 Again I saw several fishermen out catching their daily intake of fish for the family. 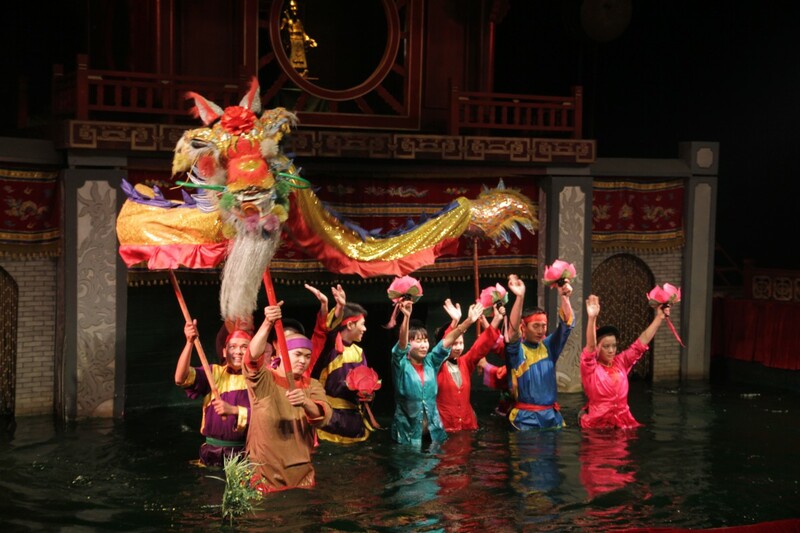 They troll a long folded net into the water while using motor to move on so the net drops into the water. 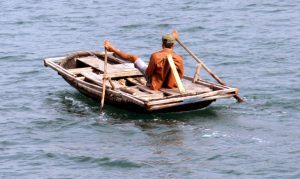 When the net has all been dropped into the water they then drive boat around and around while drumming to frighten the fish into their nets. 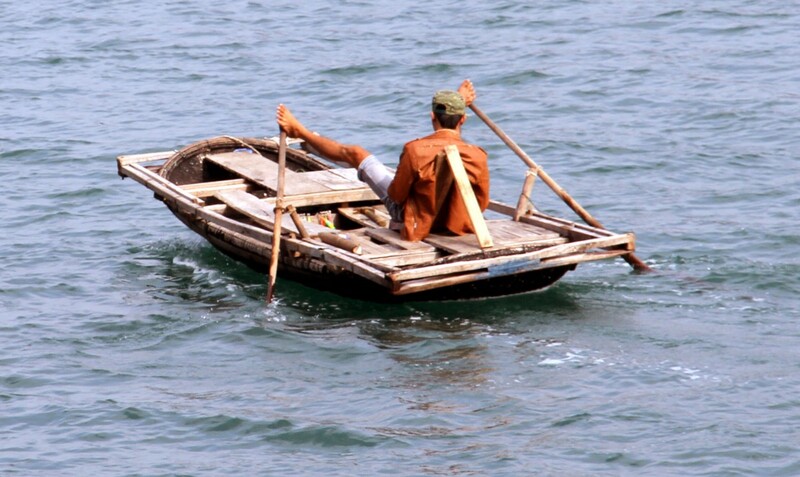 They then turn off the engine and use the oars to row the boat around again to collect the net. This all takes about hour and half – then they do it all over again. Another beautiful breakfast followed by trip to beach which we declined so we could get ready for our train trip tonight. We were given choices for lunch today and the plan was to have it early. 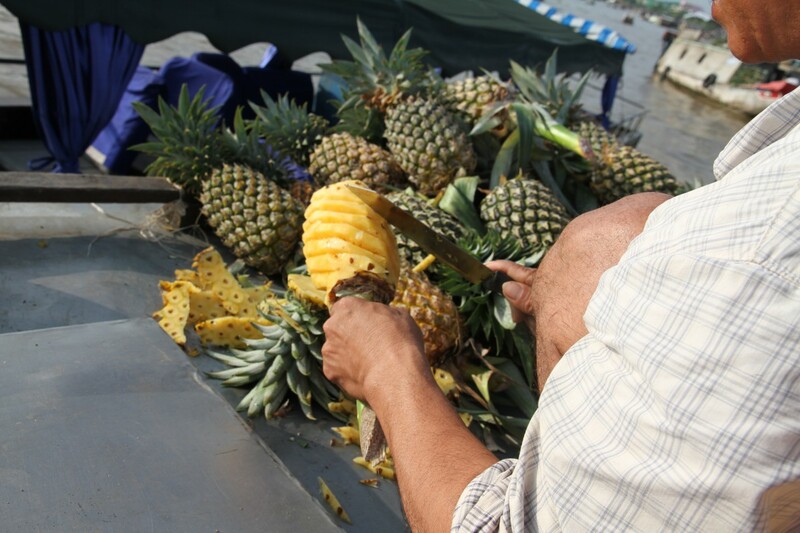 We tired many different foods such as lotus nuts, tiny scallops, tiger fruit, pomelo and more. When we finally got back to head office we waited for about half hour for our bus and enjoyed our trip back to Hanoi. We were dropped off at our hotel ‘6 on 16’ where we were warmly greeted by the staff. We met Pete who was taking us to the train later, who told us about his son Vang whom he has legally adopted because his mum died when he was very little and his dad became addicted to opium. Pete helped the father with rehabilitation and he managed to get clean. He was lonely and met a woman two mountains away. Pete helped him get on his feed save some money and head over to get woman. He came back naked and all money was gone and heartbroken. 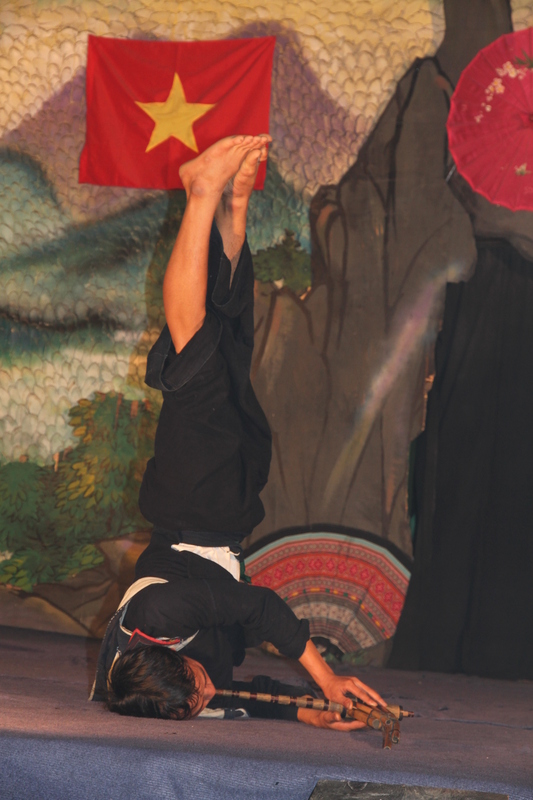 He soon after committed suicide and left Vang alone. Pete from the tour desk, sorted out our train tickets for us for the night train to Sapa, a village nestling on the wooded slopes of the Hoang Lien Son Mountains at the eastern extremity of the Himalayas. At the hotel we caught up again with Melbourne family of four from the junk who had been staying in the same hotel as us. We arranged to take two taxis to train station so we could all fit and got forceful instructions from our leader/guide Viet to stay together and follow him. He also warned us not to follow anyone who tried to encourage us to follow, either in this train station or in Sapa. He went off to get tickets and was herding us all together when a man raised him arm and said ‘follow me’ and we all took off after him. Viet came running after us saying “no no no” and the man thought it was a huge joke and went away laughing to himself. 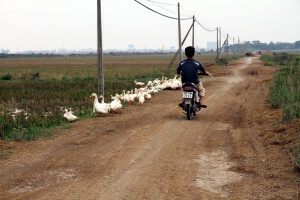 We all felt very stupid and Viet gave us another lecture on why we must not follow anyone!!! He took us to our sleeper and showed us how to lock doors. A woman conductor checked our tickets and we locked the door securely and went off to sleep to the sound and motion of the train. 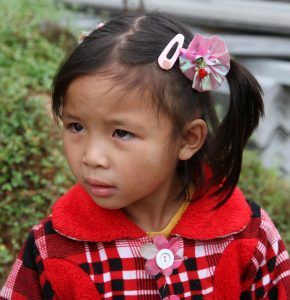 We were woken at five am just before we arrived in Sapa otherwise we would have ended up in China. 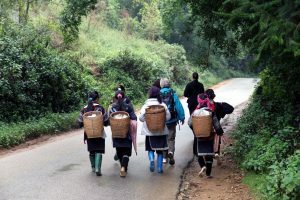 Getting off the train in Sapa, we were unsure which way to go so we decided we would follow the majority who would hopefully lead us to the exit from the station. It was pitch dark so we needed to watch our every step especially as at one stage we had to leap down from a steep platform cross the railway tracks and climb up onto the platform on the other side. I was half way across the railway line when I hear a thud behind me in the dark. I sensed it might be Marcia and sure enough when I looked around I could just make out her outline upended on the railway track with her suitcase on top of her. A kind man helped her up and took her bag to other side. Her arm was scratched and her pride damaged but otherwise she appeared ok. However, later that day we discovered that she had in fact strained her ankle. A driver was waiting for us outside the station with our names on a board. 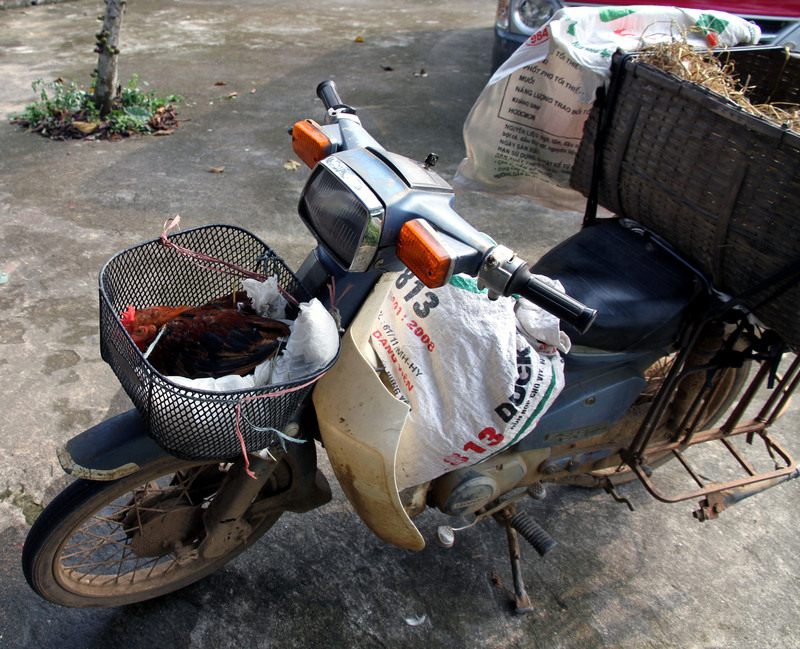 We had a fairly hairy ride to Sapa on very winding and narrow roads. 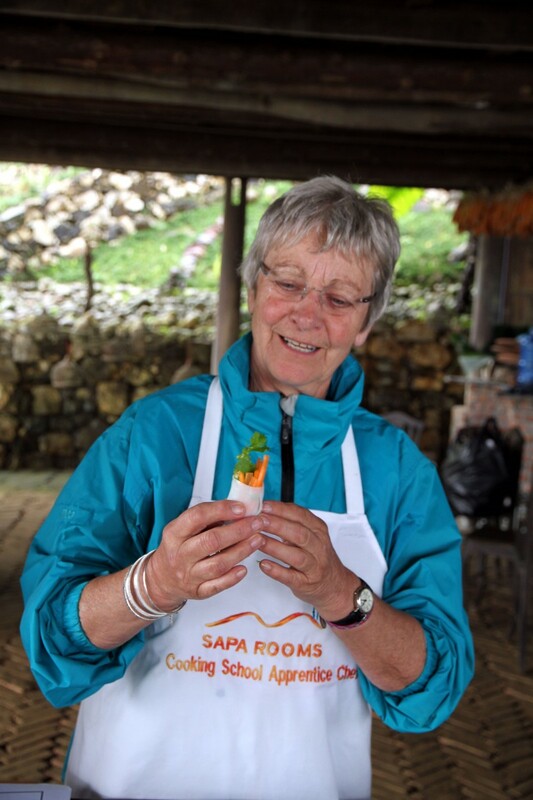 We were greeted warmly at the Sapa Rooms Boutique Hotel and given a lovely breakfast followed by a very enjoyable good tasting coffee. Sustained by our meal and coffee we moved to go out the front door to face the throngs of women from Black Hmong tribe waiting outside to attach themselves to us so we would buy something from them. 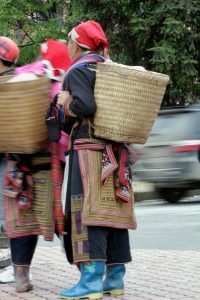 They follow tourists wanting them to either buy something from them or guide them on a trek to a local village such as Cat Cat or Lao Chai. Their command of the english language was pretty good but limited and it was obvious that they’d been doing this a long time as they only seemed to congregate outside hotels where gullible tourists stayed! We ignored them all and walked through the food and vegetable stalls displaying fresh fruit and vegetables. One woman saw me touch one of her vegetables and got out her water bottle and set about spraying me directly shouting something like ‘bugger off’ in Vietnamese. 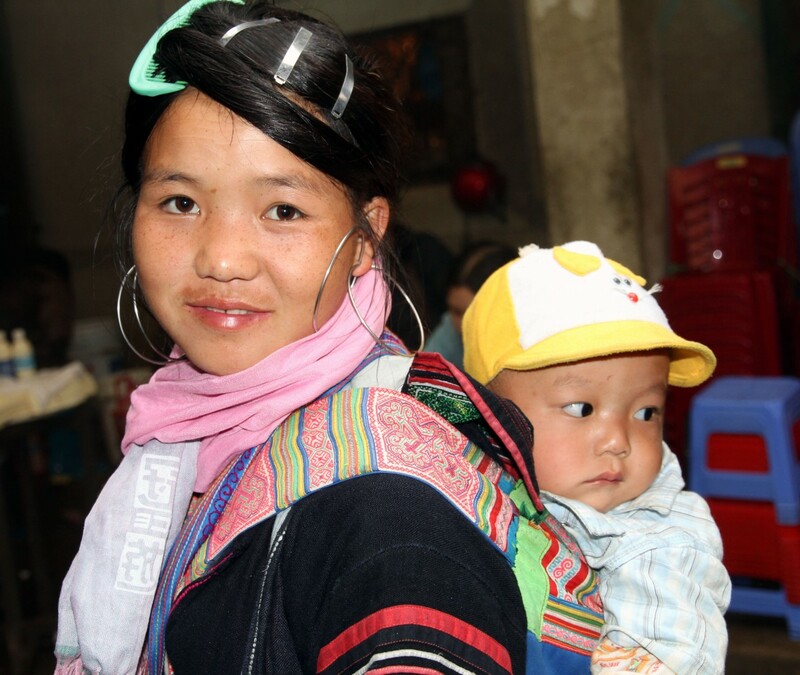 At that stage a young Hmong woman with her baby Phu seemed to have become our constant companion. 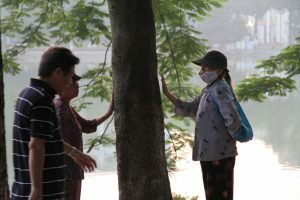 She was not pushy so we walked with her -she could also speak a little English and was able to tell us what was what. 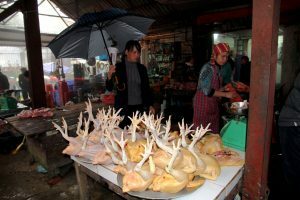 We then went through the meat market where we saw a butchered buffalo and all its parts, all possible parts of a chicken, entrails, variety of pork cuts and some meat had hooves on them.There were live chickens in cages ready for the chop when their dead mates were sold. 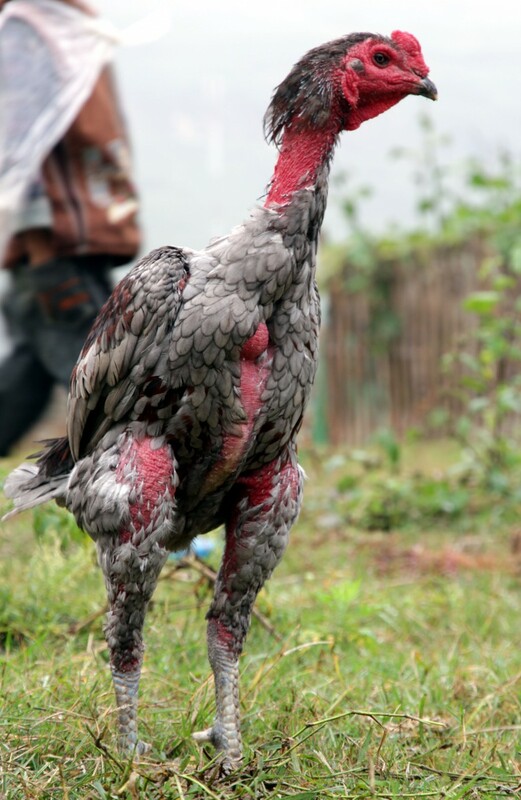 There were black skinned chickens and also have black-bones, they are called Chinese Silkie and have been prized for their medicinal value ever since about the eighth century. 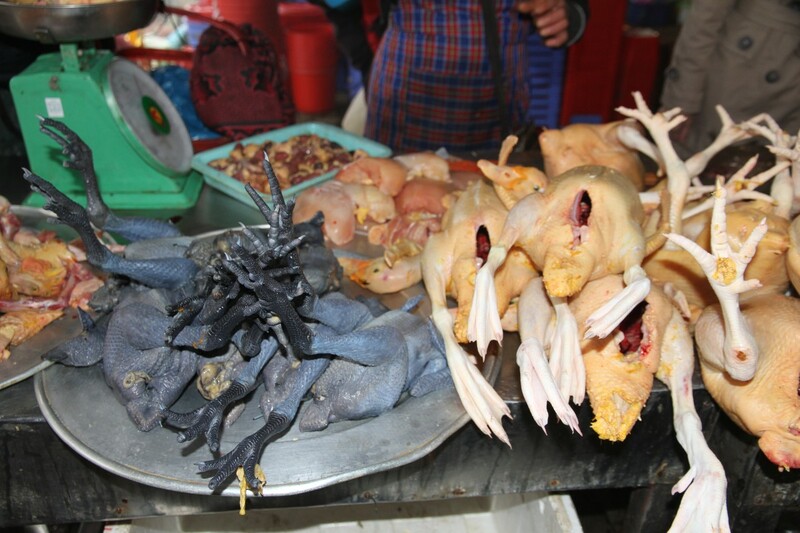 Chinese women eat black chicken after giving birth to get a boost of energy, but it’s also said to have a positive effect on the yin, blood, lungs and stomach. Leaving the market we headed up to the local catholic with our new ‘Black Hmong’ friend who did not come in with us but insisted that we come back to her and buy something. Once we had bought something from her she disappeared and we wandered on back through the streets where we passed severl Red Dao women sitting on the pavement. 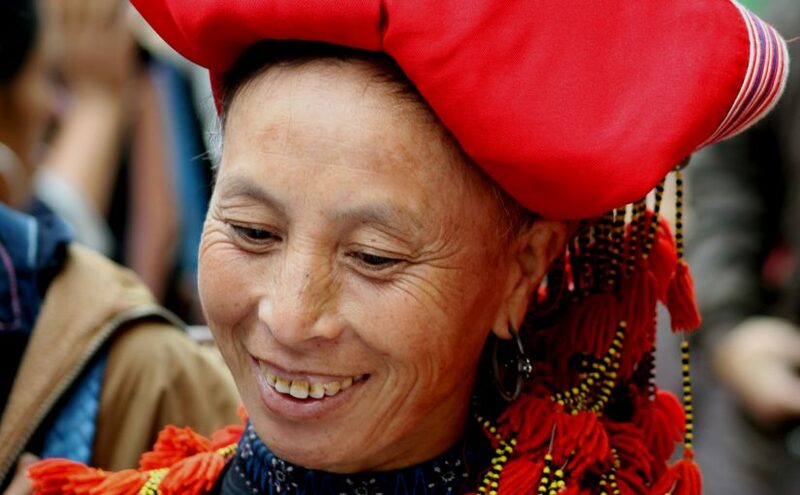 The Red Dao are the 9th largest ethnic group in Vietnam with a population of just under 500,000. 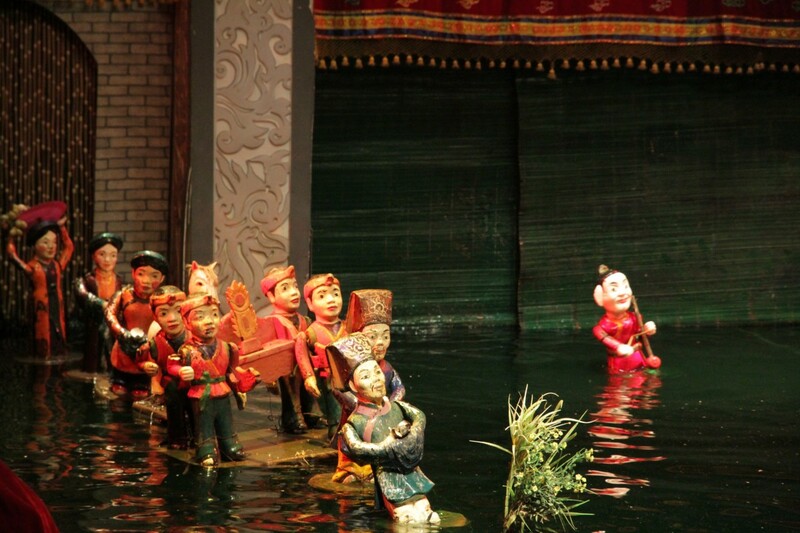 They came from China around the 13th century. The women wear bright colourful costumes and wear black trousers richly embroidered with flower or star. 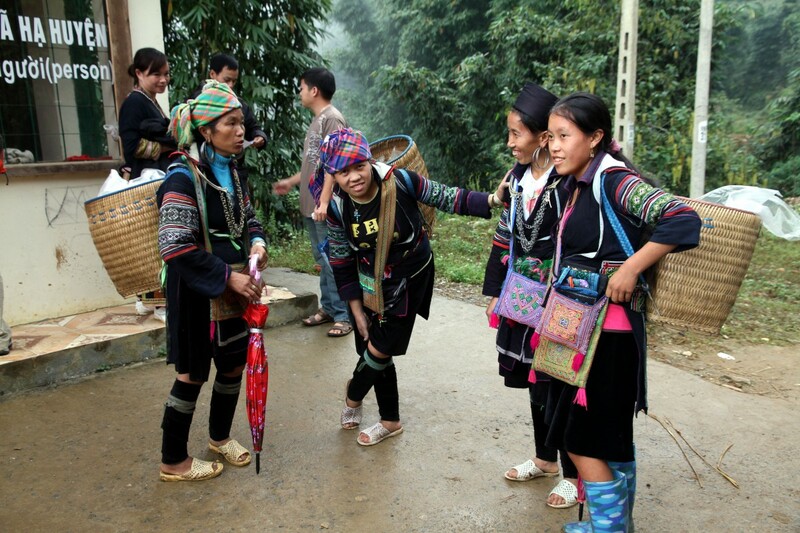 They wear black or read jackets again with some embroidered patterns on their borders. 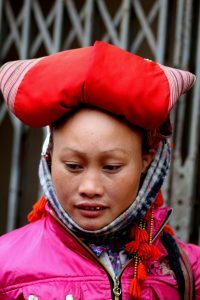 They wear black or red turban on their heads and some silver chunky jewellery. 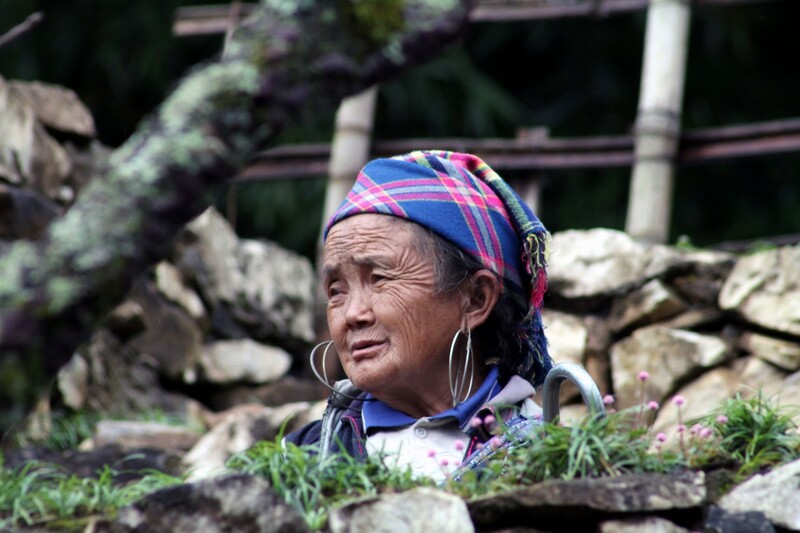 The women also shave off their eyebrows which is regarded as a sign of beauty. We headed back to the hotel through the markets were there were lots of ‘fake’ Columbia and other gear, we bought some pants and a backpack on way back. 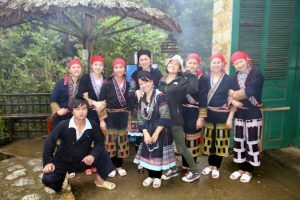 Once at the hotel we had coffee and got ourselves ready for our 6km walk guided walk to the to the Hmong Mountain Retreat which was part of our package. The whole package:return train fare (four bunks booked for two of us), one night accommodation in Hmong Mountain retreat, cooking class, guided walk to Cat Cat and the retreat and one night back in Sapa in the Sapa Hotel – cost $330US each. Our guide Suemay who spoke English with an American accent took us off up the road where she stopped to get tickets to enter the village. We walked along the road for about two kms and then turned off the road into a walking track that had a very steep decent which seems to go on for a few kms, the track wet, steep and slippery and several people in front and behind us slipped. Marcia’s ankle was very sore from the morning fall of the train platform, so it was extra hard for her. 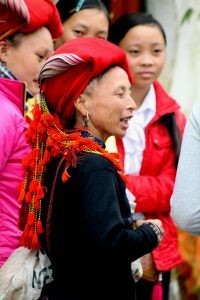 We were followed all the way from Sapa by five Hmong women who tried to attach themselves to us even though we were with a Vietnamese guide. 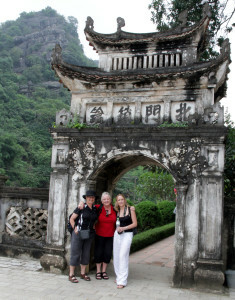 There were four of us in our group, us two Kiwis, Kate from HCMC and Belinda from Oz. There were heavy grey clouds all the way and every now and then there was a light drizzle of rain but was great walk full of atmosphere and views. Stopped in a small village along way for lunch where our guide went off to cook rice noodle and beef soup in a kitchen behind a very basic cafe. We enjoyed the company of the Hmong women that had attached themselves to us so we ended up buying some small embroidered bags from them. Marcia was very grateful to them for their willing hands in the steep parts so she bought two bags!!! 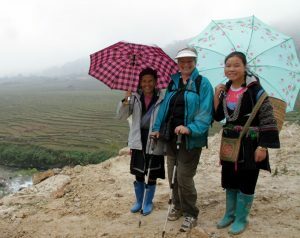 A driver met us at the end of the 6km walk to take us uphill to the retreat. 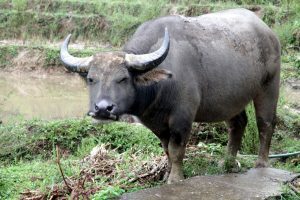 As we waited for our driver, we saw a man and his buffalo climb a very steep switchback in a field close by. 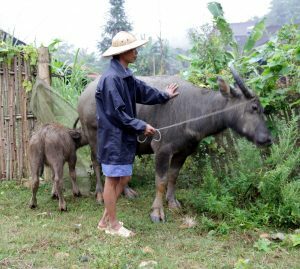 Young Hmong boys are trained when very young to handle buffalo and learn how to work them so they can work them when they need to and they will do as the ask. 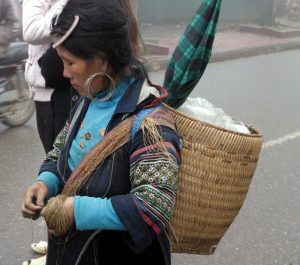 Must admit to feeling a little uncomfortable about the young women who should be part of a working tribe in a village ‘begging’ in the streets – even though it is not technically begging as they are selling their wares but the attitude and approach is undignified and false, they just need to take a different approach but not sure how. 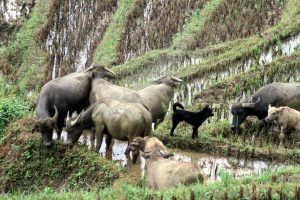 However, there is such poverty in their villages and their desperation to sell goods to get an income makes then appear aggressive but the competition is pretty fierce. I understand that they have to make a living and use the opportunity presented by the influx of tourists to earn income by selling their goods and working as trekking guides. 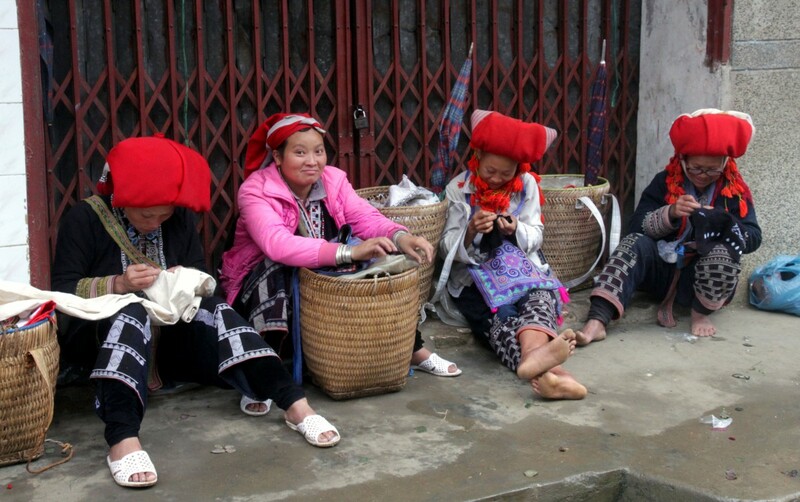 This means that these women now become the breadwinner in their family, it’s not uncommon to see very old women selling to tourists or offering guide services, in fact we came across several older women selling their bracelets and bags and they were well into their eighties! The Black Hmong and Red Dao women live in the villages around Sapa and walk miles into Sapa every day to sell to the tourists. If they find a tourist who wants a guided track walk all days and then home at night and often in pair of plastic flip flops. Interestingly enough at the Hmong Mountain Retreat two very very old ladies came into the resort to sell their wares but they were ‘hunted’ away by the younger people serving behind the bar. The guides were also a little derogatory about them and told us not to talk to or buy anything from them. Such a shame as we would have loved to engage them in conversation (lack of language might make this impossible) and would love to smile at them without having to give them money or buy something else we did not want. 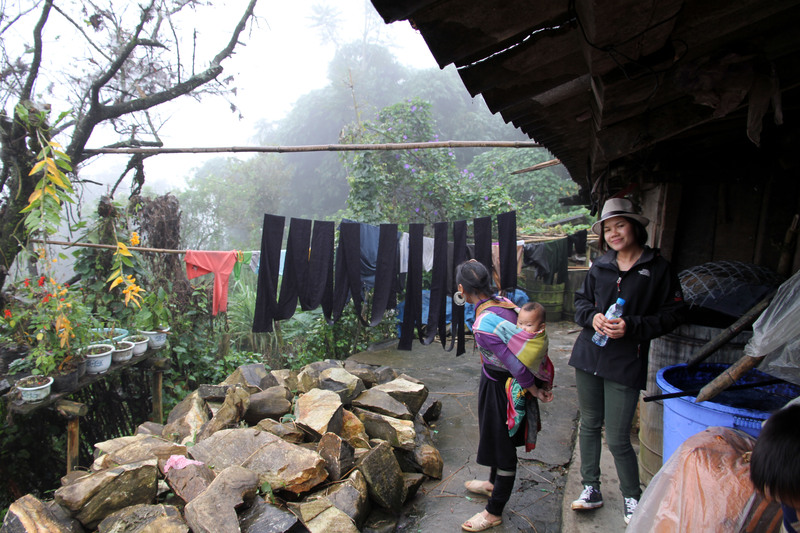 Hmong Mountain Retreat was in a really lovely complex situation on the side of a hill with 7-8 separate huts each with a lovely view but unfortunately we could not sit and admire the view because of the mist. We set up our ‘mossie’ nets and rested inside the hut until dinner time catching up on reading and blogging. Dinner was served upstairs in the communal area where we met all the all other guests that were staying at the Retreat. There was a young boy aged about 11 years called Vang who helped staff to serve food and collect dishes but unfortunately he did not speak any English so we could not converse with him. He was a lovely looking boy and very willing and well able to help the others. 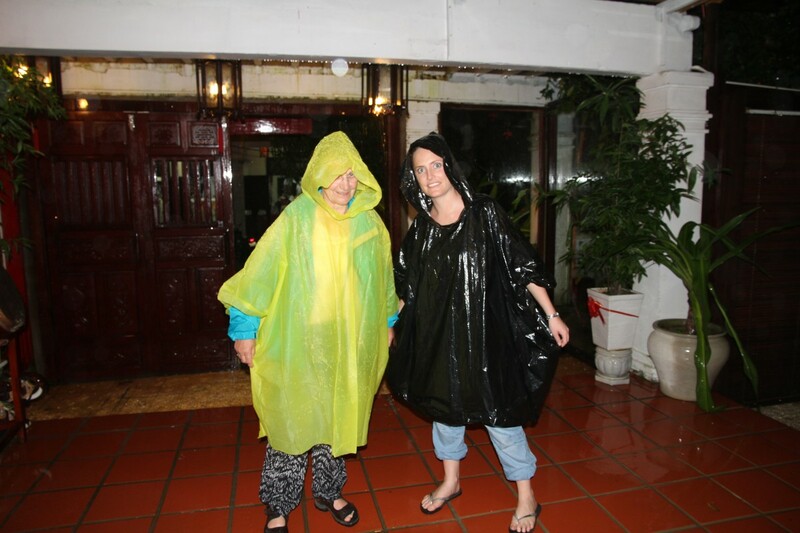 The ablution block was a little away from our huts so when one needed to pee in night during a heavy deluge of rain so went onto wooden slat deck and peed holding umbrella!! All huts were made from mud and had thatched roofs. Despite the rain we had a good nights sleep. We had originally planned a guided walk over the hills to another village but Marcia’s ankle was very swollen and sore after the 6km walk yesterday so instead we opted for a cooking class. 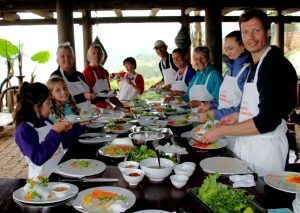 It turned out to be great fun and the food was very tasty, we were joined by family of four from Melbourne, mum and daughter from KL, and Oz and Kiwi couple living in Singapore. After eating all our cooking we were loaded onto a minibus and driven back to the hotel for the night. 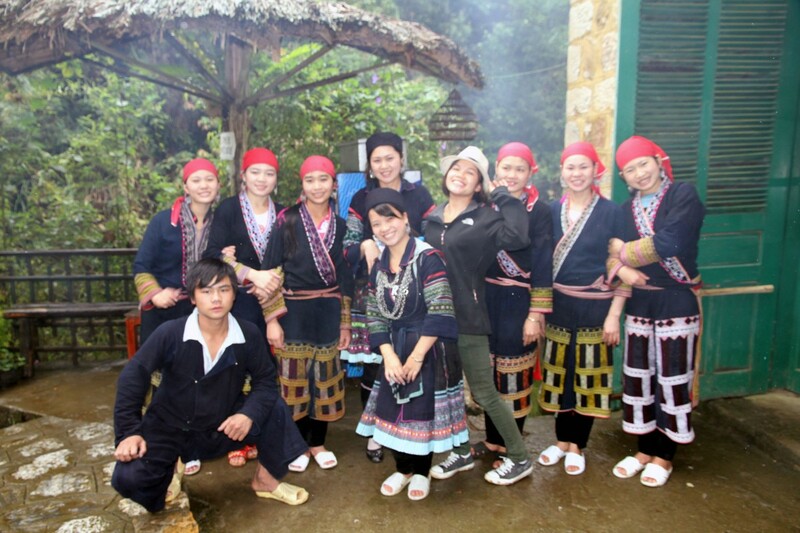 It was lovely to be back in the warmth of Sapa Rooms hotel. We strolled around Sapa village and ended up having a 45mins foot massage each and really enjoyed it. In the foot massage place the girls told us that they work from 8am to very late often to 11 or 12pm. 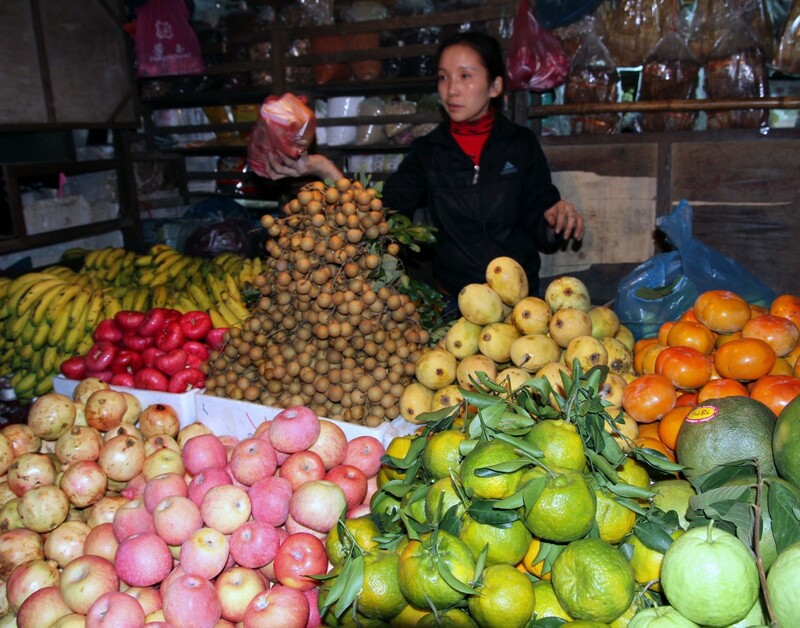 A guest in the hotel called Mike was heading off early the following morning to the markets on the border between Vietnam & China (assured they were worth the three hour drive). He invited us to come with him and we were tempted but he was heading off at 6am and would not be back until about 4pm. We opted for ‘time out’ and a relaxing morning. We did have a relaxing time, used the laundry facilities, drank coffee and generally lazed around. Went window shopping but ended up buying a backpack, raincoat and sandals. We sat in the lobby drinking coffee and watched the world go around. 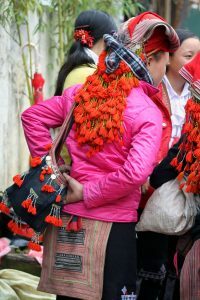 The Hmong girls still congaed outside the hotel and when not trying to sell to tourists they dressed and undressed their hair all day. They have an amazing capacity to remember who has been there before and leave you alone, they also remind you that you did NOT buy from them yesterday! 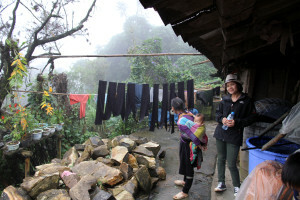 At one pm Khuyen, who also doubles as the floor manager at the Sapa rooms, turned out to be my guide and I was the only one going to Cat Cat village (Marcia’s ankle still swollen). 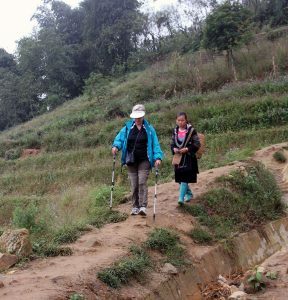 We set off on the 7km walk down hill and continued downhill the whole way to the village. On the way down to Cat Cat village she stopped at a home and showed me how a rice grinder worked by water pressure and took me into a genuine village home. Inside this tiny home there were six kids, two very young kids under two and they were running around and on top of some bags of rice. 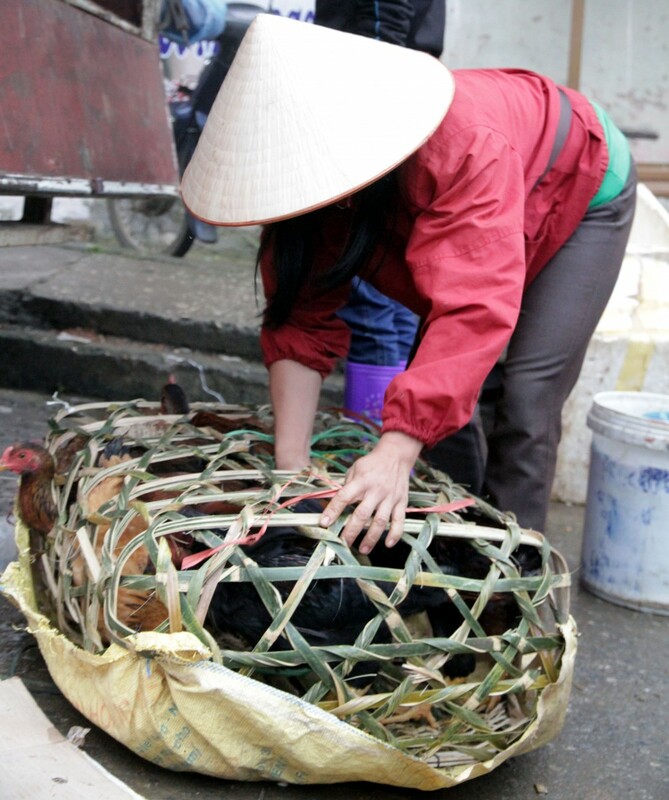 One had just fallen off the huge rice bag on to the dirt floor and was crying. There were no windows in house because people believe that spirits can come through windows and ruin crops. Maize hung from the ceiling in large bunches and they use the stone grinder, worked by hand, to turn it into flour. 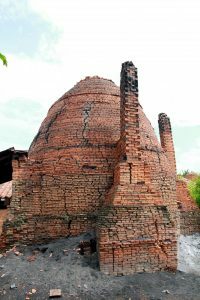 Their kitchen had a huge central pot for cooking sitting on a dirt fireplace in the centre of the room. I could not see any adult ‘mother’ just some seven year olds looking after the rest of the kids. There were huge stacks rice both upstairs and down. The kids all smiled and waved as we left. We then stopped at the handicraft place where I saw then women weave, dye and prepare the threads and cloth for working on. One large heavily embroidered ‘mat’ can take up to a year to complete. Within the house there were massive vats of natural dye which needed to sit for about a week to get the colour correct. The village of Cat Cat was amazing situated alongside a stunning waterfall and as we walked we passed several stall with women and men selling street food including hen’s claws. 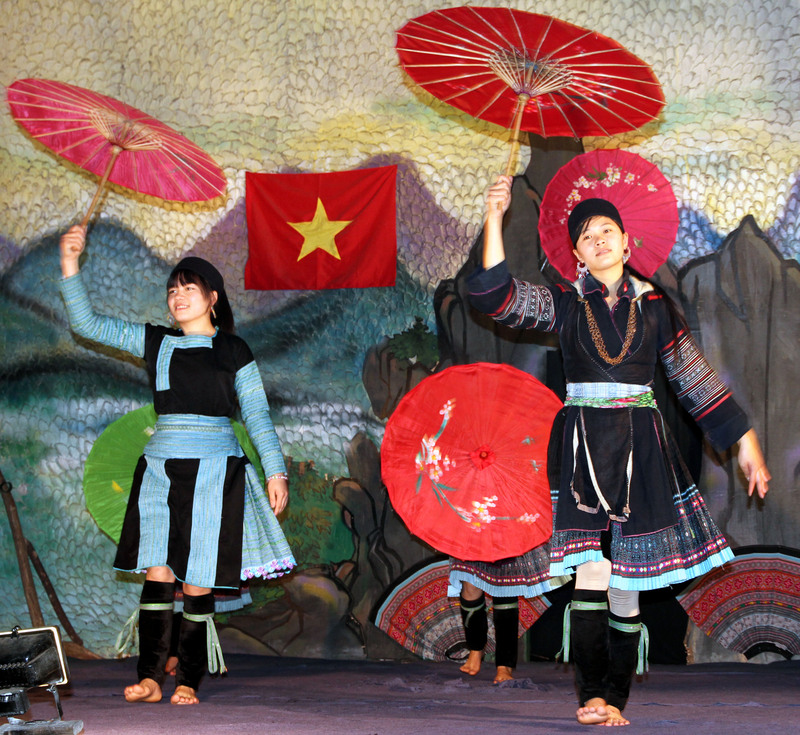 At the very end of the village there was a stage set up where the local tribes – Hmong, the Red Dzao and the Tay all sing and dance but they needed four people to perform so I waited for a while in hopes that someone else would arrive. So after waiting for ages and nobody seemed interested I asked how much it would cost for four ticket – $6 I was told so I bought all four! It was a really delightful session of music and dance each dance depicting a different aspect of their culture – I particular loved the dance with instrument and umbrellas, the rice harvest dance, the man playing the flute, the red Dzao dance. It was incredible value and I thoroughly enjoyed it despite been an audience of one! However,back to hotel but what goes down must go up!! Well the road back went up and up all the way back up to Sapa just a little less steep as coming down but a longer route. 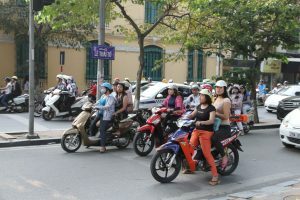 Many motorbikes offered lifts and I was tempted many times but slogged on and arrived back to Sapa rooms in a lather of sweat. Had shower and got ready for overnight train. Collected by our driver for our trip back to train station, one hour drive away, we were taken to a diner beside the station so we could grab something to eat to take on the train or eat there. Everyone had beer as it was so cheap – $1NZ for a large bottle tiger beer. No wine available but had roll with soft triangles of NZ cheddar (the plastic type)!!! Back on the train which was comfortable but a bit noisy! 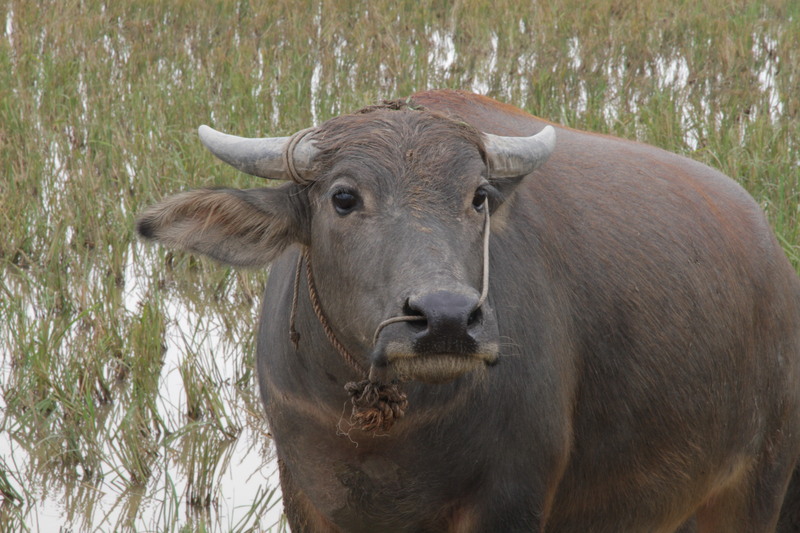 Day 9 – Meeting Niamh & travel by car & driver to Cuc Phoung National Park. 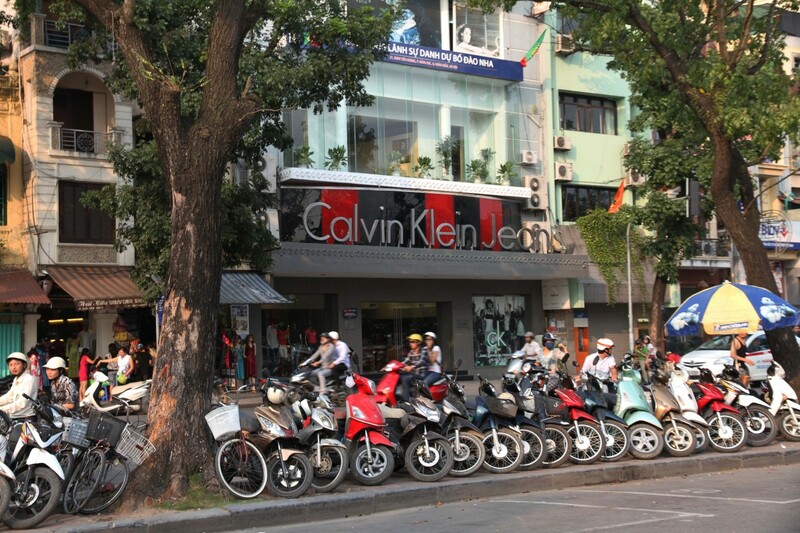 Arrived in Hanoi at about 0430 and walked outside the station to find a cab, easy to find at that hour. 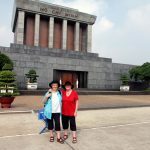 We were heading into Hanoi to meet up with my daughter Niamh who was flying in for UK, so we took the cab to the hotel Niamh had booked but it was all closed up at that hour of the morning. We decided to walk to the lake, sit and watch the world wake up. At seven am we went along to the same cafe as we went to on the first night – only because it was the only cafe opened and rang Niamh to join us for coffee. Went back to her hotel ‘had breakfast ‘shower and wandered around the streets until lunch time. We had booked a car and driver ( a cheap thing to do to get from A-B if there are a few of you) to drive to our next destination Cuc Phoung National Park. 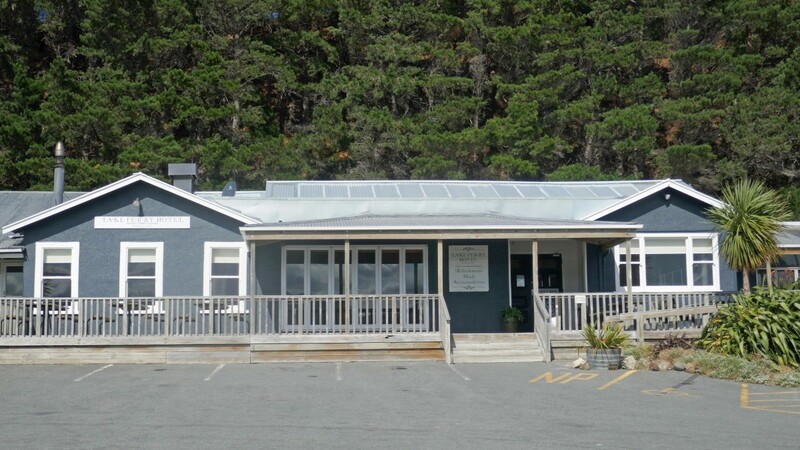 There were several types of accommodation in the park, we had chosen to stay at Mac Lake but when Niamh decided to join us we needed to change our accommodation to head quarters as we could not get an extra room at Mac Lake. It was an amusing ride down and took 21/2 hours. The driver got lost getting out of Hanoi several times and eventually after four tries we were on the way. His driving was not too bad but he kept poking Marcia who was sitting in the front seat beside him asking her to pass his water. He finally asked her to light a cigarette for him but she refused so Niamh did! 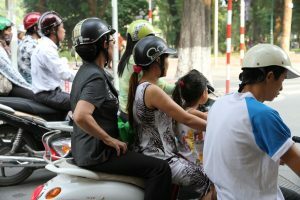 Marcia was very brave to sit up front as the driving everywhere in Vietnam is pretty bad. As we drove along we thought we had missed our vital turn off (did we know better than the driver?). But we had no way of communicating our thoughts to him, Niamh also needed a ‘rest’ stop but we could not even communicate that to him! 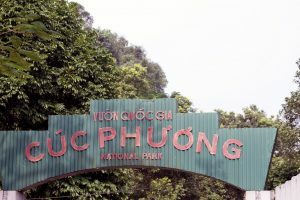 Finally we got to Cuc Phoung National Park and into our rooms – very basic but comfortable (http://www.cucphuongtourism.com) but did long discussion about what room would suit us and where on the compound would be best! Established in 1962, Cuc Phuong is the oldest national park in Vietnam as is 120km southwest of Hanoi. Not full of tourists and has lust rainforests and walks. Once unpacked and settled a guide from the park took us first to the primate centre where the look after rescued monkeys. 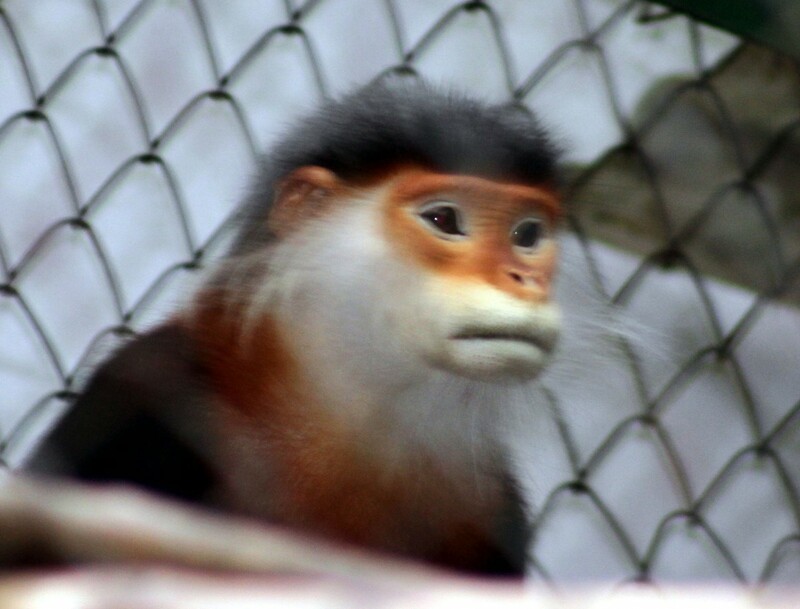 Established in 1993 as a project of the Frankfurt Zoological society, it had succeeded in breeding many rare species in captivity such as Delacour’s langur, Hatinh langur, Black langur and Grey-shanked Douc langur. We saw male and female gibbons, including a very sleepy female and lively young male, also saw a white pant languor, five colour languor and long armed languor. There are three stages of rehabilitation within the centre and as they grow and get healthier they move to the next stage. First a caged stage where they become well. 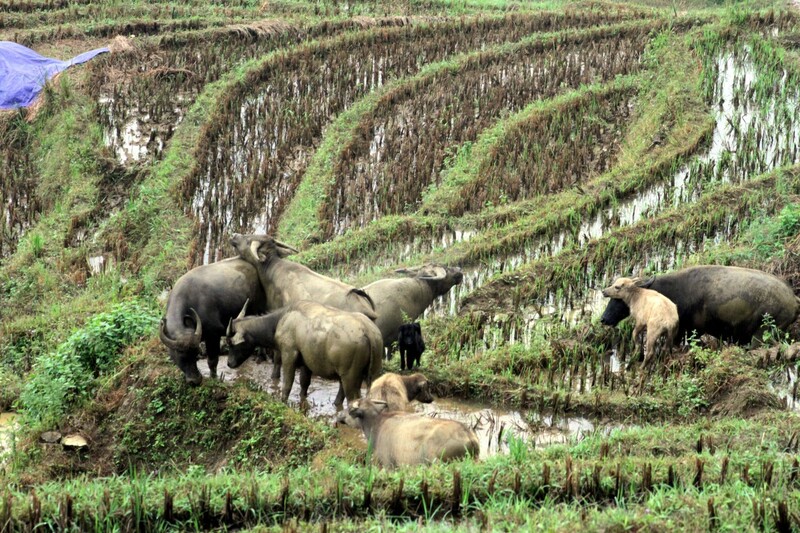 Second, a seven hectare fenced section where become used to fending for themselves. 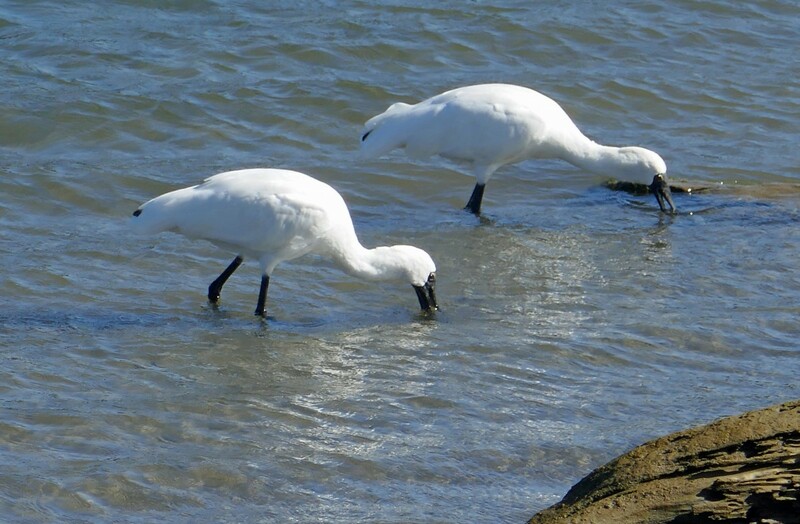 Finally, they release them back to their natural habitat and are tagged before release for ongoing surveillance. 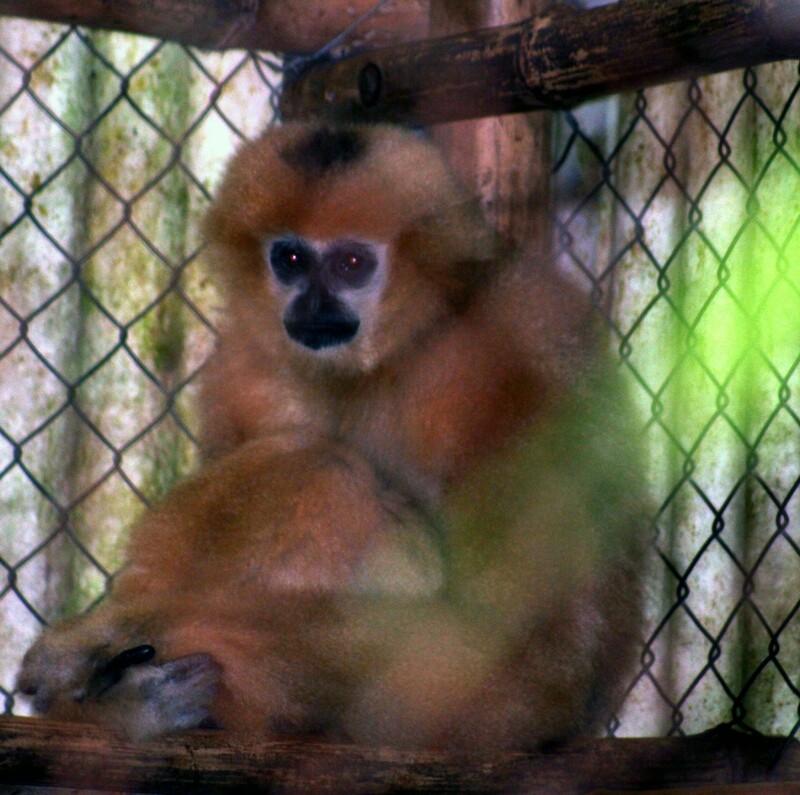 As we left we heard the gibbons start to sing very loudly – a real treat! 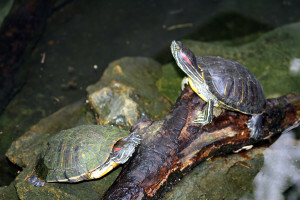 Next we went to the Turtle Conservation centre which also breeds, educates and researches turtles and tortoises but have special research project looking at the breeding, nesting ecology, incubation of eggs, and growth of the Vietnamese native keeled box turtle. We had dinner in the dining room and were the only guests in the whole complex, food was pretty reasonable. 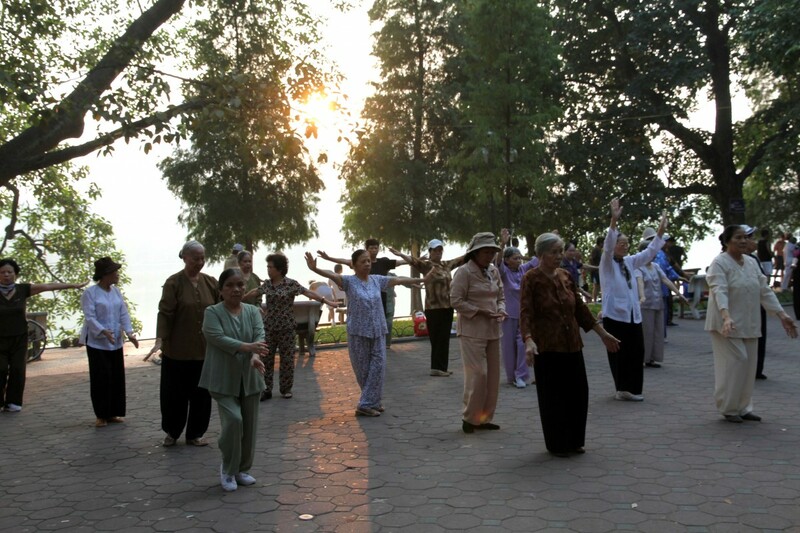 We got up early for a morning walk around the botanical gardens. Amazing coloured butterflies, one with vivid blue spots on it’s wings amongst lots of bugs and insects. The park was very overgrown with a few workers slashing and weeding in vain. 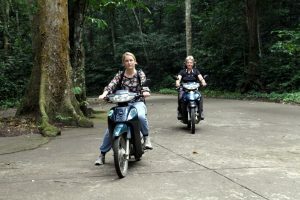 We wanted to venture further into the National Park so the staff suggested we hire some motorbikes! 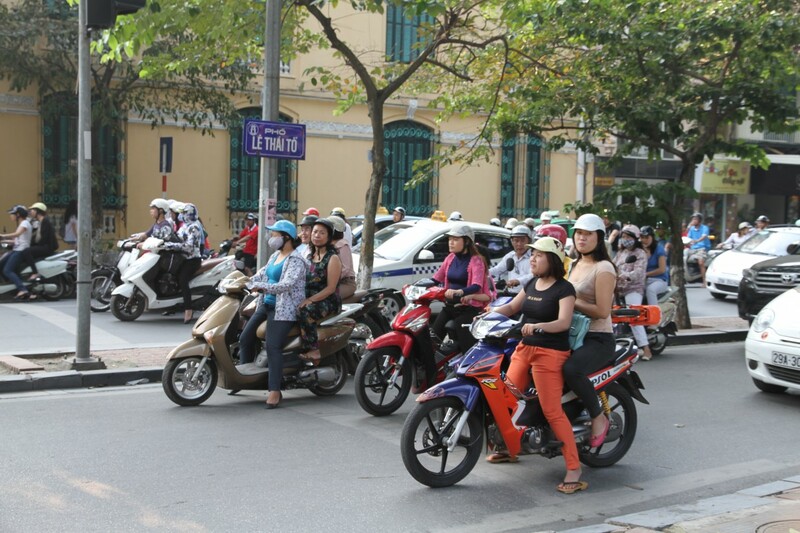 They were manual 125cc motorbikes with a top speed of 140km/h. No need for a licence! We were asked … “Can you ride a bike?” “Yes.” “Ok. 250,000 dong please” ($15NZ). 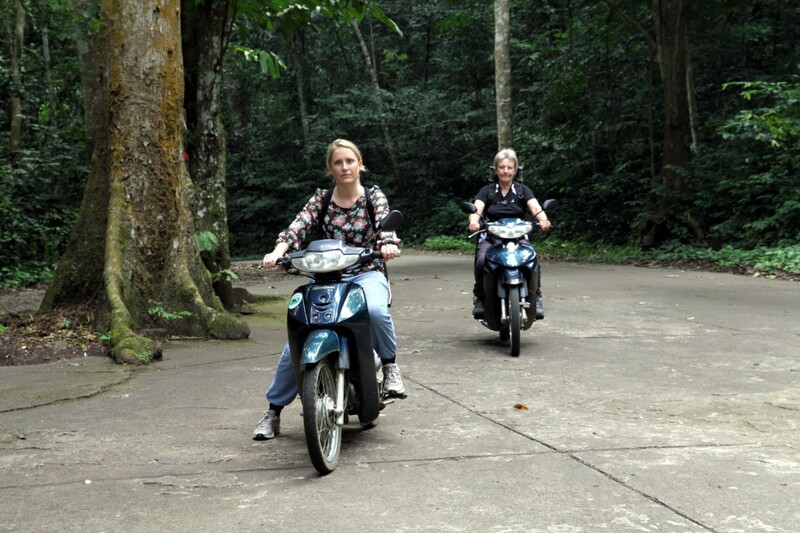 Not having been on a motorbike for a few years Niamh and I set off tentatively before Marcia took off like ‘easy rider’. Niamh and I spent the rest of the day trying to catch up! Our first stop was Mac Lake. This was our original choice for accommodation and what a beautiful setting it was. 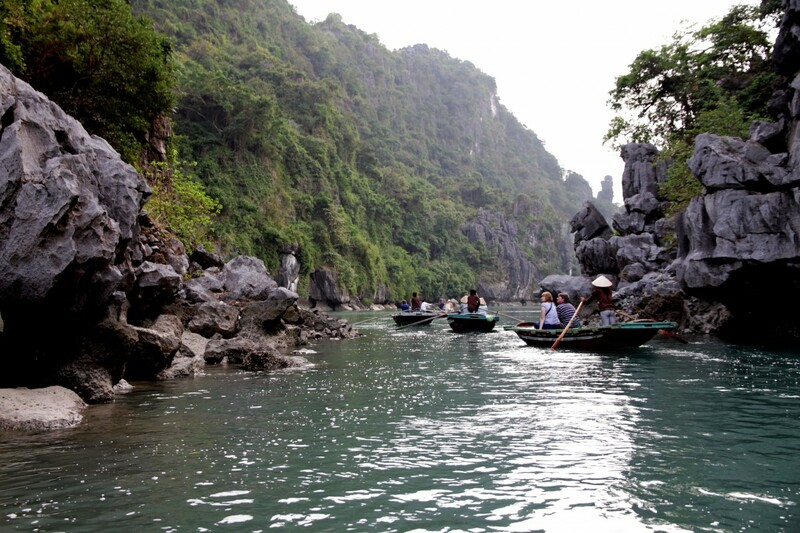 We rode on to the cave of the prehistoric man which is now home to bats and climbed the 220 steps to get there. The cave dated back 7500 years, making it the only human habitation in Vietnam. Sadly the artefacts were handed back to the local museum leaving the caves with nothing but three tomb mounds. Next we drove on past the 1000 year old ‘big tree’ to the end of the road, 20km from our starting point. Found a little cafe where we ate pork noodle soup but noodles were plastic. The women running the place were very reluctant to take ‘tatty’ bank notes but I said I had nothing else. 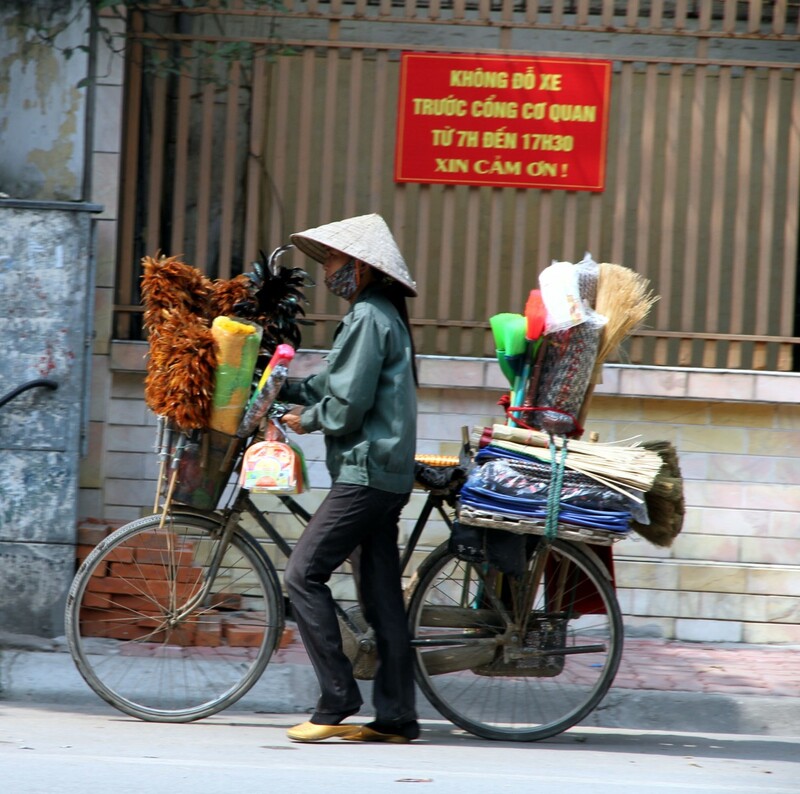 This is something to note if traveling in Vietnam do not accept tatty notes in your change! After another plate of fried rice with egg back at the centre (from the ‘extensive’ menu in a v basic setting) along with glass of red Dalat wine! It was red – what more can I say! Marcia and I went ‘night-spotting with our guide Huyen. On the way there in the car, Huyen told us the story of his family and tribe – the local Muong tribe. 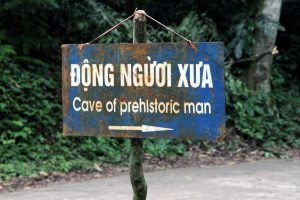 His tribe had been moved from the park when it was made a UNESCO site in 1963. 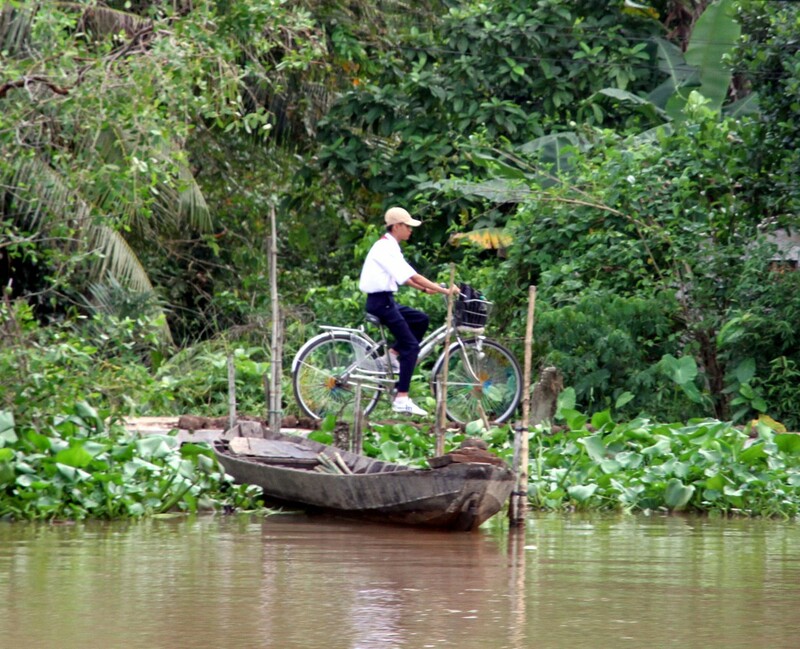 They are now in an isolated village which is only accessible by bike, scooter or walking. 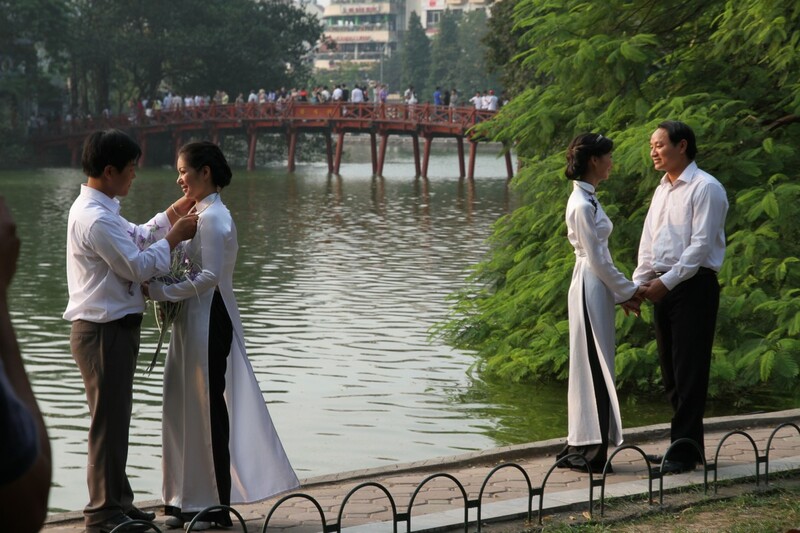 He is married – a marriage arranged between his mother and her friend. He laughs at how he said ‘no no no’ twice before agreeing to meet her. The third time he went and she was very pretty. 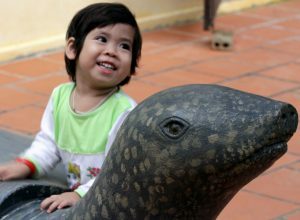 He didn’t love her but now he loves her very much because she is very patient and they have a lovely daughter called Ve. His parents say they want a grandson because a boy is important to them but he doesn’t care – he loves his daughter. Huyen is one of two Muong guides at Cuc Phoung Park. For him to train as guide he had to borrow money from a special bank with no interest. He spoke no English before he did this training two years ago but now speaks it well with a very strong accent. 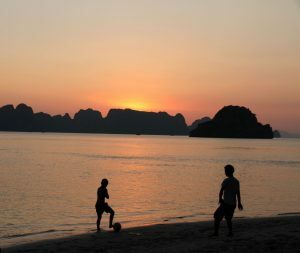 When he has paid his loan off he plans to go back for another year to train further in English and ecology. When we arrived at our ‘night spotting spot’ he gave us a torch and had a very powerful torch himself. We had barely gone into the forest when he spotted a ‘Loris’ monkey with huge large bulging eyes. That was a highlight but we saw lots of bugs and snails. 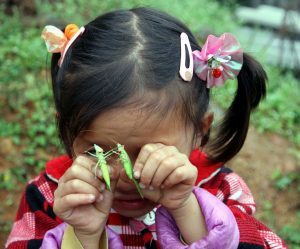 We watched while a centipede ate a grass hopper, saw a black and white snail crawl along a leaf, saw the beetle bug eat huge rings in some large green leaves – the eat a circle in the leaf and then eat the rest of the leaf. 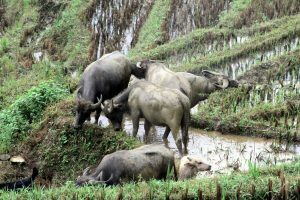 Next day we were picked up early by a pre booked driver and car from Cuc Phoung NP and driven to Nimb Binh about 1 hour away. The drive there was exciting as we passed through very small villages as the locals went about their daily chores. 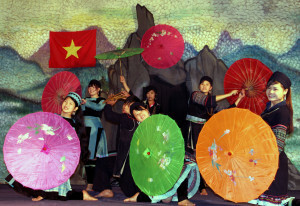 We were taken to our hotel Ngoc Anh, 30 Luong Tuy,($US20 per room including breakfast for 2) and shown to room. 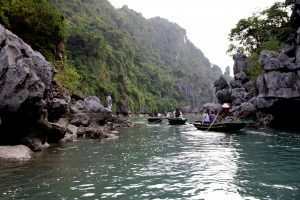 Having put our gear into our room we met Long our guide for the day tour we had booked – Tam Coc (rice fields seen from boat – called the inland Halong Bay), Hoa Lu Temple, King Dinh Tien Hoang temple & King le Dai Hanh temple. Long, our guide was very talkative, intelligent and interested in discussion about anything and everything. 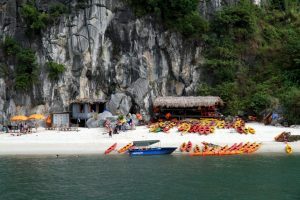 We first went to Trang An to see the grottos, we took a boat from the hundreds waiting in a long line for all the tourists to show up. 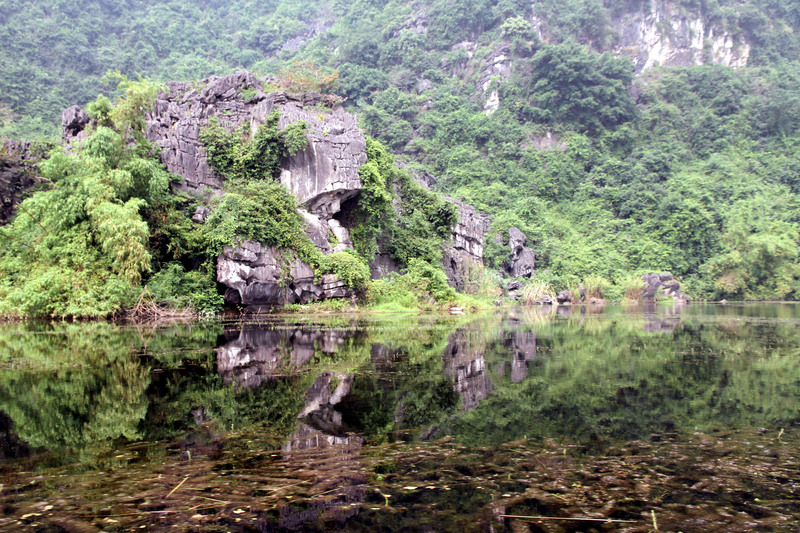 It was a tranquil setting surrounded by limestone karst and green paddy fields. 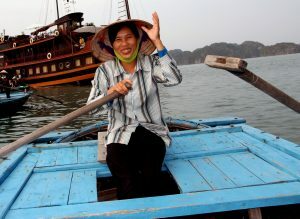 We were rowed in the wooden boat by a very slight woman in a huge hat who seems to row all three of us easily! We were not a light weight,but she seemed very capable. When we got to cave we realised the entrance was very low and Niamh was uncomfortable going inside so we detoured and went through a cave further on and then into a lagoon. We then drove to Vietnam’s ancient capital Hua Lu which was involved with the 1000 year celebration of independence of Vietnam, one interesting fact -the emperor defeated the Mongols – one of the few countries to do so. We then went to Tam Coc for lunch and ate goat cooked over lemongrass with sesame seeds on top, it had an interesting taste but I liked it. 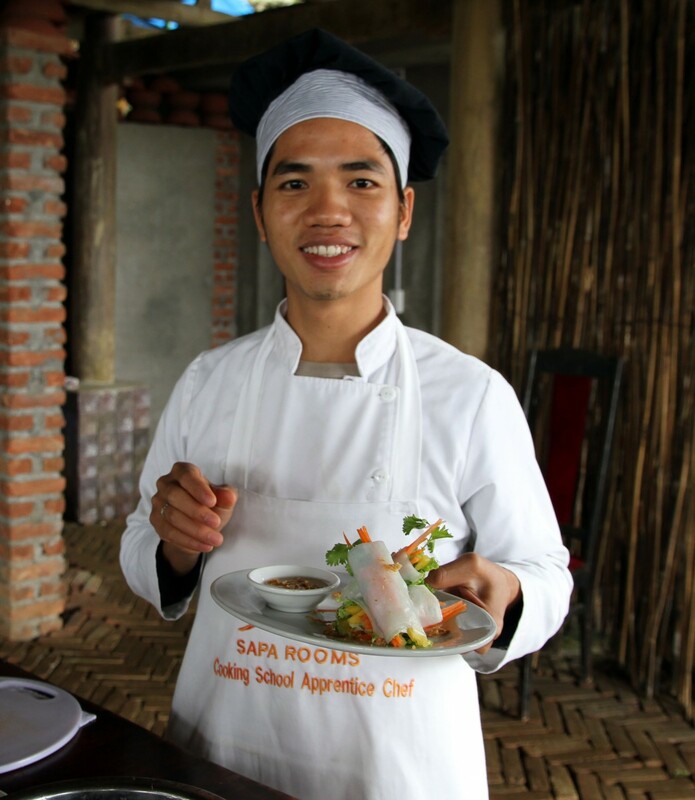 We were shown how to make our own spring rolls with pineapple, Vietnamese mint, goat and cucumber with a dipping sauce of unfermented soy sauce and ginger. We also had chicken and pineapple dish which was very tasty. 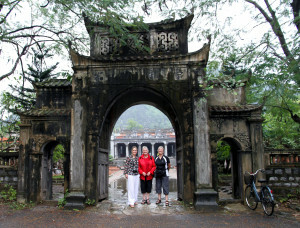 After lunch we went to Hua Lu temple, one of the many temples in Vietnam. 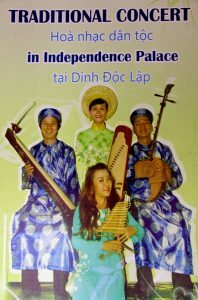 In this one an old man was playing a single stringed Vietnamese instrument inside the foyer while his wife hassled all three of us but especially Marcia to put money in her bin. There was a huge gong outside the temple to call locals. Long, our guide tried to explain all the mix of religions. Buddhists love, peace and happiness, Tao was about looking to the future and money and Confucius was about wisdom. 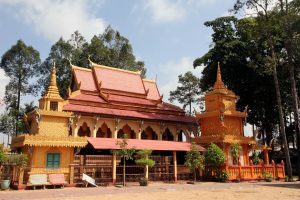 Many came to the Vietnamese temple to pray to the king when something went wrong and they bring range of gifts from beer and cigarettes to biscuits and money and just leave them at the feet of Buddha. 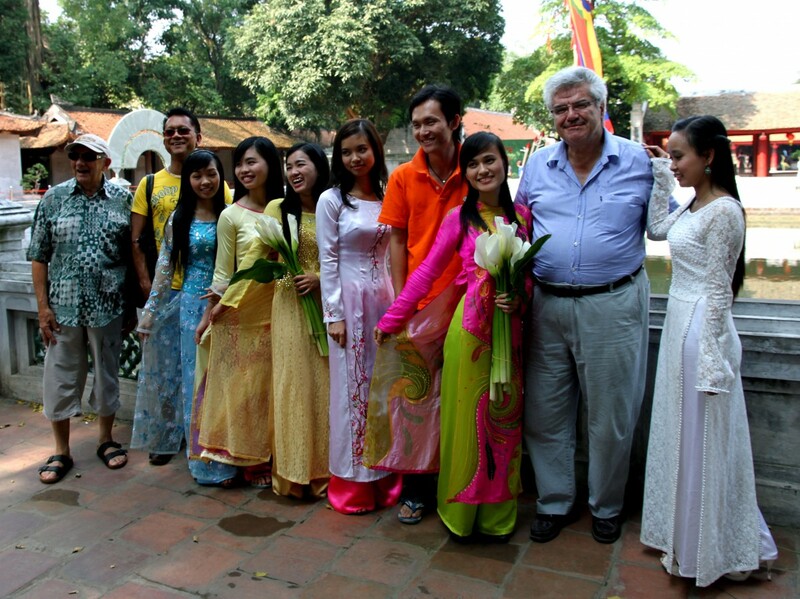 He told us that most Vietnamese have a mix of religions depending on their needs at particular times in their life. Within the temple the statues of the king and the male sons sit in front and daughter/s of king are off to side. 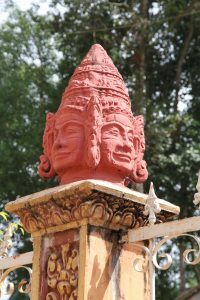 The front temple is used to pray and the back of the temple is to give thanks. After the temple Long took us on a long walk around the rice paddies and alongside the Tam Coc River where we had been earlier but a different area. 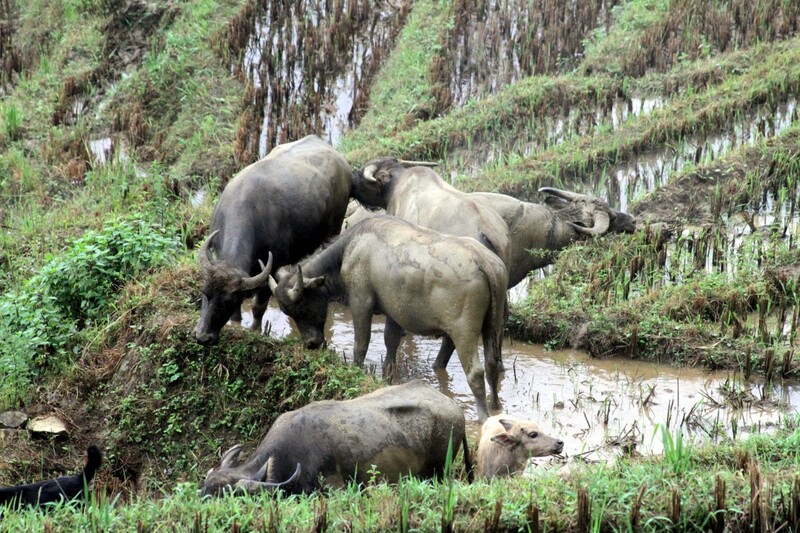 Some oxen we came across were determined we would not walk the narrow path and we had to wait ages for them to move eventually we had to ‘shoo’ them out of the way. 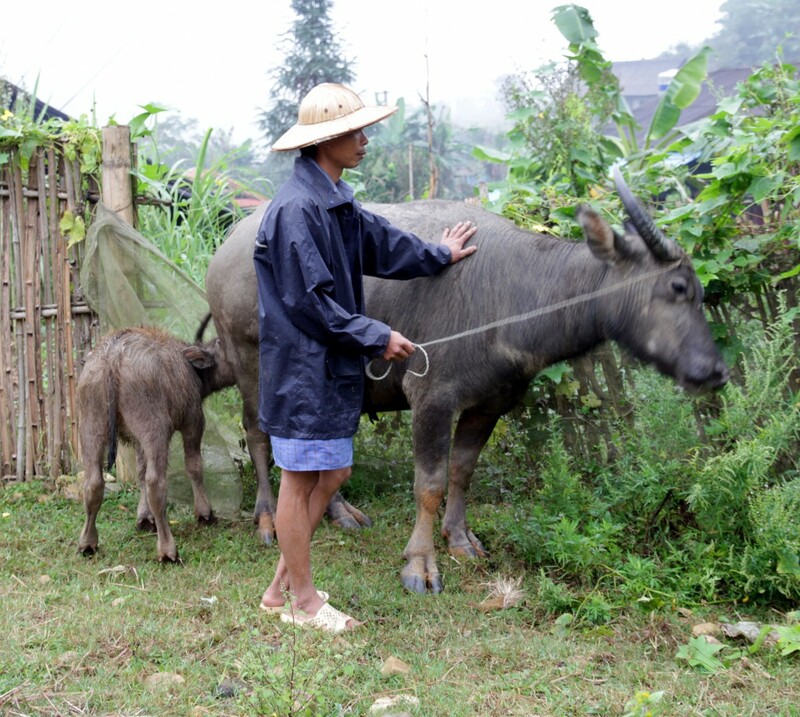 We were also chased by a nanny goat passing through a new pagoda being built in a local small community – pagoda means communal area and there were three other buildings which we assumed would end up being a community complex. We arrived at our path home but it was too wet to take it so we walked across a mud built rock wall – it was crumbling and unstable so Marcia with her sore ankle and giggling the whole way, grabbed my bag that was on my back and hung onto it all the way across with Niamh bringing up the rear in case she fell backwards. Back to hotel via Long’s brothers ‘restaurant’ where we bought a bottle of Bordeaux white wine for $18. We had dinner at hotel – very tasty spring rolls, fried rice and pork with rice and the wine of course! We had an early morning call as we had to catch an early to catch train to Hué. Great views and countryside on route but our train was very old and basic. 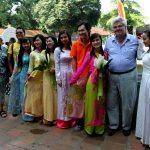 We arrived at HueNiño Hotel, 14 Nguyen Congtru, and we were greeted with a refreshing cool drink and a fried egg with sweet coconut bread and jam. Our rooms were comfortable and clean with all mod cons and I had a very comfortable bed. Marcia’s back still very stiff and painful from the fall but her ankle getting better all the time. Niamh and I went out to the local DMZ bar to have a drink and stayed about an hour as it was a very lively place. 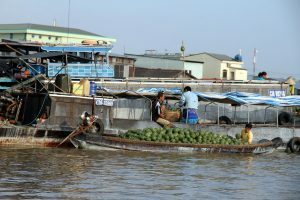 After a great breakfast we walked to the Thuong Tien bridge and decided to take a private boat along the perfume river but as we walked we were continually harassed by people selling rides on cyclo, motor bike and boats. 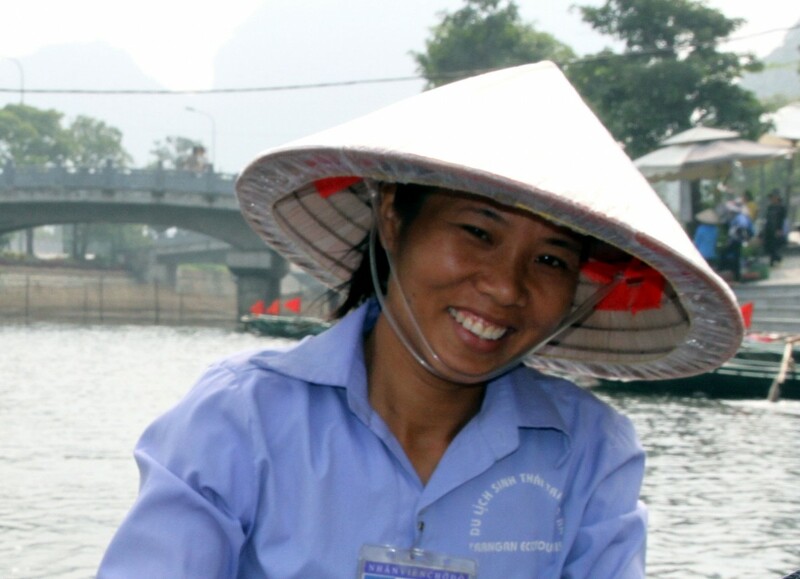 We finally found a woman who ‘seemed’ official (often very hard to know!) and bought a ride for VD 750,000 (just under $NZ50) for 4-5 hours. Off we set with mother father and baby on board (reluctant and crying) on a pretty old rickety ‘dragon’ style boat. The woman asked us if we wanted food, once we said we did they turned the boat around and headed back the way we came so we quickly decided that was not what we wanted so we turned around again and headed back up the river. We were no sooner on our way when mother brought out her cards and bookmarks etc, followed by silk pyjamas and wooden carved pieces. She was pretty insistent and pushy until we finally made it clear we did NOT want any more. Eventually after she stopped trying to sell to us Niamh bought some pictures and I bought some pyjamas. 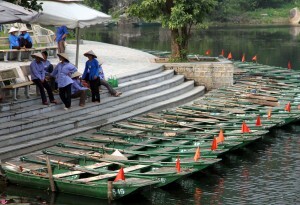 The boat ride was smooth but the river was busy with many other dragon boats like ours going in all directions. 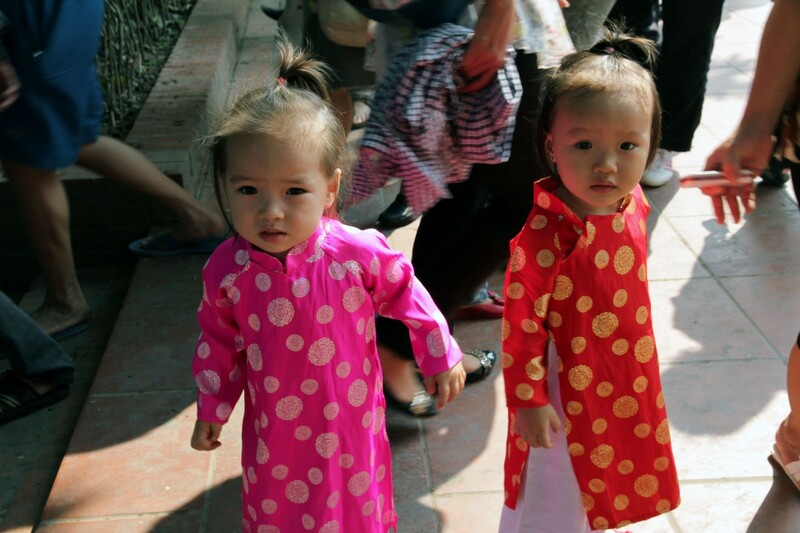 We got dropped off at the Heavenly Female perfume pagoda called Thien Mu Pagoda. It has three gates and is seven stories high each one dedicated to a Buddha that appeared in human form. 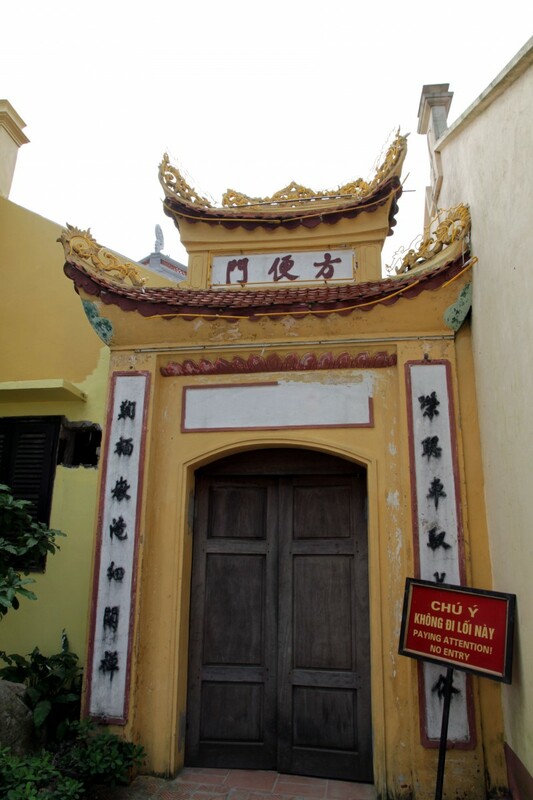 Founded in 1601 by Nguyen Hoang after he heard that “local residents saw an old lady in red appear every night on top of the hill. 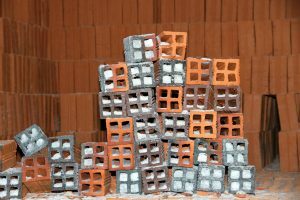 She foretold that: one day, the Lord would pass by and build something of great importance. From then on, the hill was named Thien Mu Son (Mountain of Lady from Heaven). When Lord Nguyen Hoang actually went pass the hill, he heard the legend and decided to build a pagoda and named it Thien Mu. 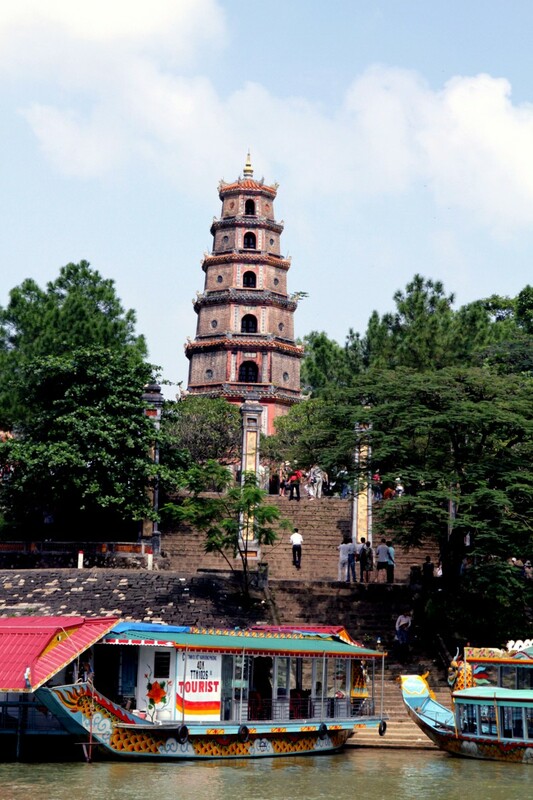 Having gone through a lot of eventful phase, damages as well as renovations, today the pagoda still exists and remains the unofficial symbol of the ancient city Hue”. It was beautiful and in lovely setting very tranquil. 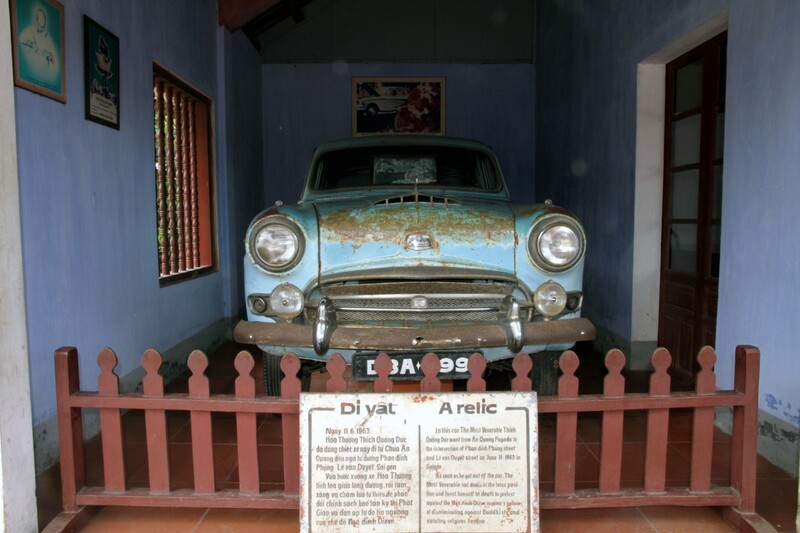 We saw the blue Morris car which on June 11th 1963, the monk Thich Quang Duc drove before he burned himself alive during the riots in protest against the persecution of Buddhist monks…during the reign of President Diem who was assassinated later that year. 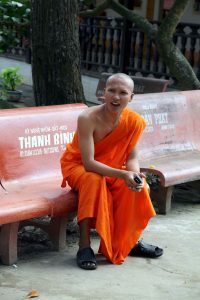 Just after we got there a young Buddhist monk came to close it down, it looked like they still prayed there. 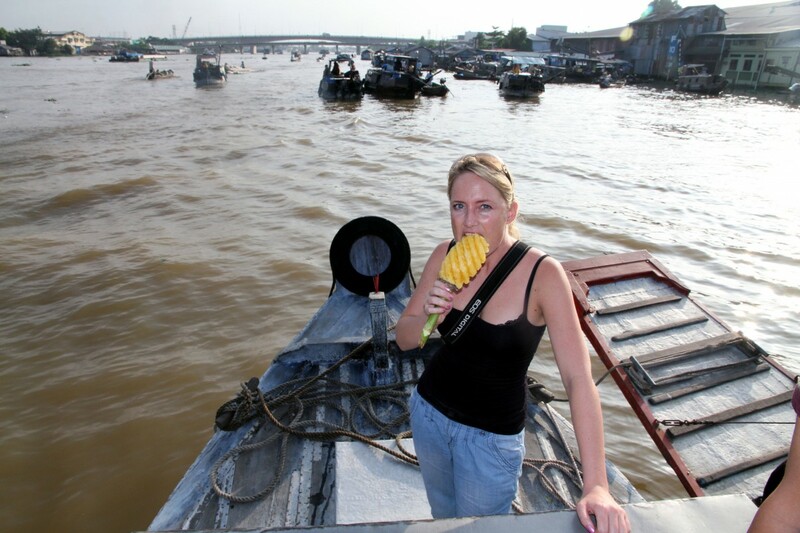 Back on the boat we asked the driver to drop us back at the Hué market instead of our starting point and they were happy to do that. 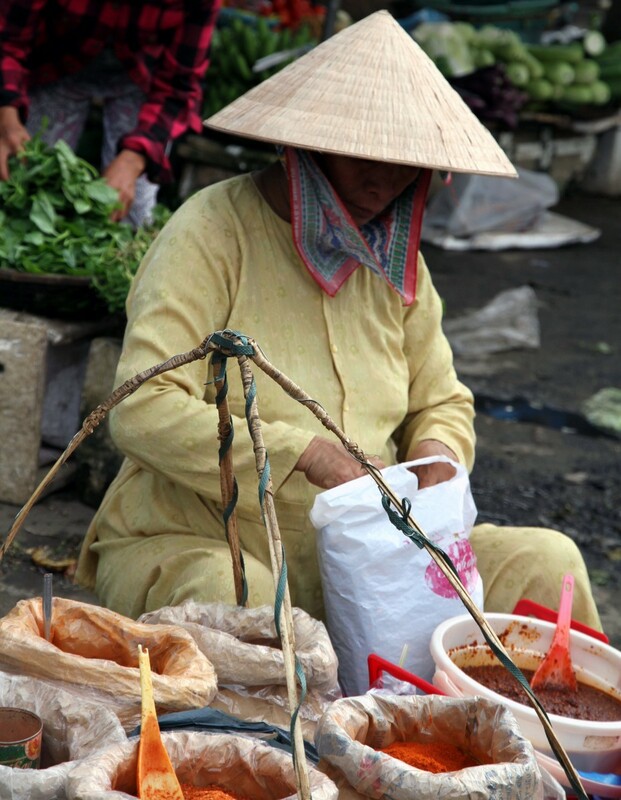 We wandered through the market looking for street food which was really not street food as it was prepared in stalls inside a building. The woman behind the counter came out and pulled out some plastic seats and sat us down and kept bringing out food we neither asked for or wanted!! We ended up paying her just stop her bringing out more food. Both Niamh and Marcia had a beer with their ‘meal’. One old lady seemed to attach herself to us and kept turning up everywhere we went. We were not sure what she wanted she was quite insistent that we go here there and everywhere, eventually we escaped her and left the markets. 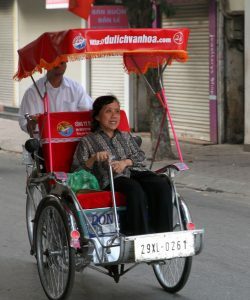 As we left the markets we came across a row of cyclos and decided we would hire one each for an hour and asked them to take us into the Citadel behind a 10 km wall which is 2 meters thick. 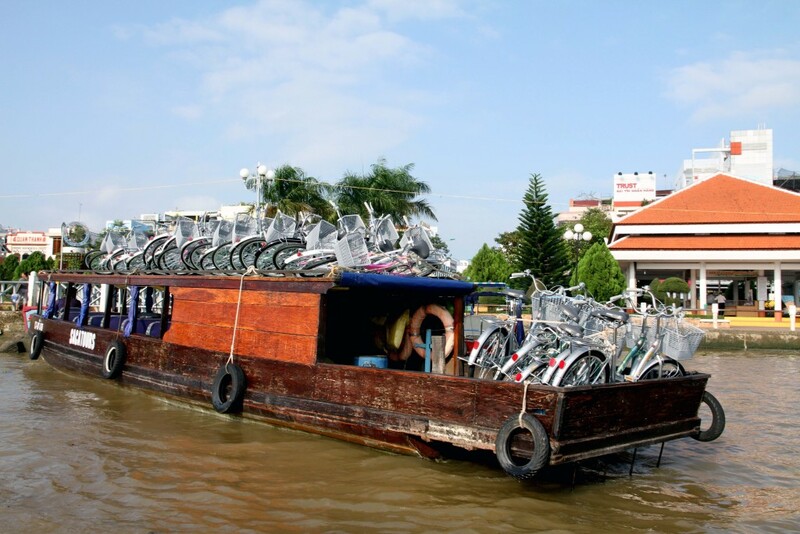 The cyclo trip was absolutely hilarious. Once again Marcia had picked the ‘fast’ guy and he went off like a mad man but my guy wheezed and puffed his was around. 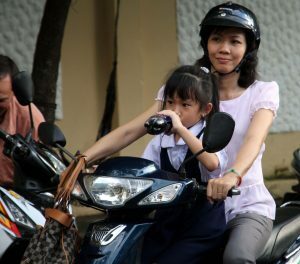 I closed my eyes when we were changing directions or crossing the road as there seem to be no road rules or no cycle rules! My driver kept looking back at me and shouting “Vietnam number one or Vietnam ok” that was all he said for the whole hour. After a tour around the Citadel, they took us back to a bar DMZ close to our hotel – the same one we had gone to the day before. The cyclo guys wanted more money because we had been in the cyclos longer than the hour. We paid up as we had really enjoyed the experience. 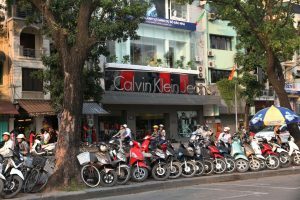 We wandered around trying to find a place to eat and finally found Khuyen Trang cafè… lots of tourist and their guides in their eating Wandered back home through some back streets to soak up the local atmosphere and then ended up at ‘why not‘ for a few drinks. Our hotel always had fresh juice ready to serve to us no matter what time we arrived back. 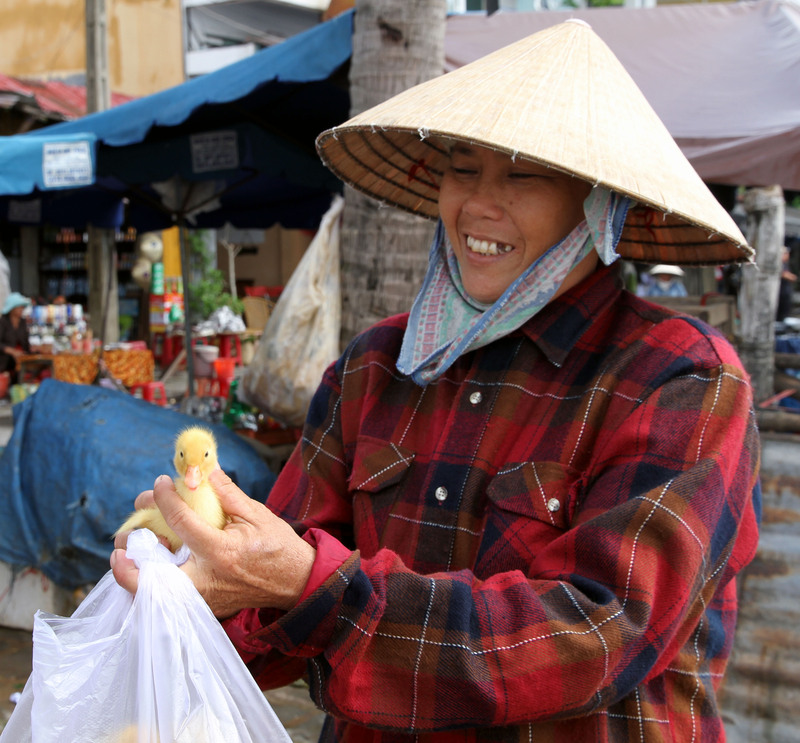 Up early next morning to catch train at 10am from Hue to Da Nang. Lots of tourist on train and it was crowded but there was an open window between carriages where I could photos. 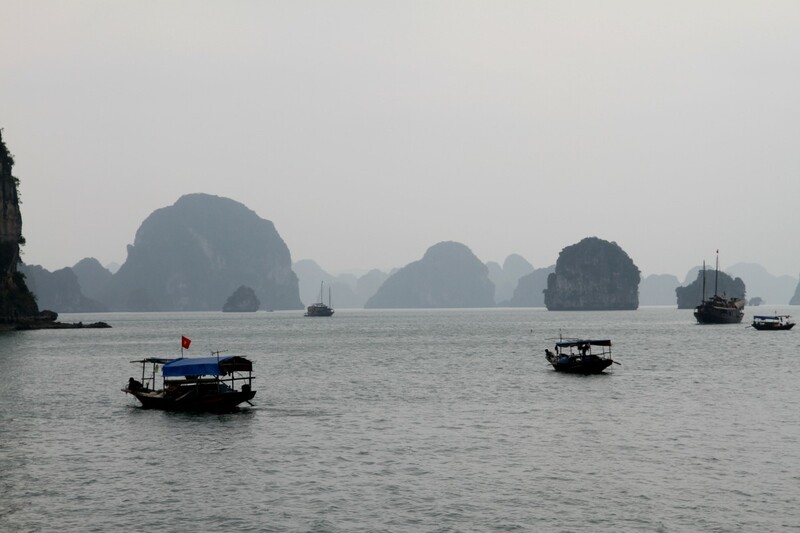 The weather was cloudy and it rained a lot during the trip so the views were misty. I wandered down the train to the open window to take some photos and noticed several women leap onto the train as it slowed down to go around a bend or go through a village. They first of all threw their pack into the space above the steps while the train was moving slowly, then they leaped on to the steps and hung on to the iron rail and hung on there for well over half hour while the train gained speed and passed through tunnels. when we got close to the outskirts of Da Nang they were getting ready to leap from the train and the woman who was hanging on under my window looked up and smiled in her pink raincoat. Looked like a terrifying ordeal but it also looked as though it was common practice. One assumed that poverty would be the reason behind this risky act as these were not young women and also train travel is not expensive – but that is our $NZ buying. 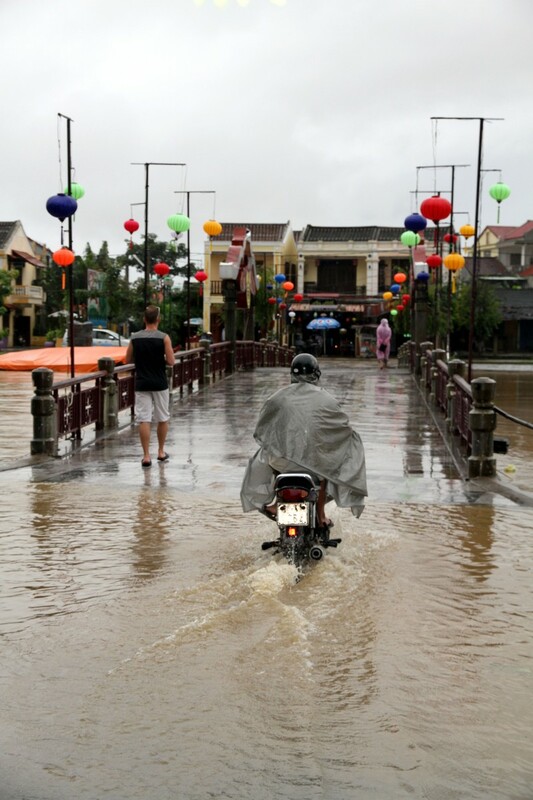 We got into Da Nang at about 1330 and our hotel in Hoi An had arranged for a car to meet us at the station and take us to the Sunflower hotel, Hoi An, where we were greeted warmly and offered a cool drink. We left luggage in the hotel foyer with the staff and went to the hotel restaurant for lunch. Niamh and I then walked into town and planned to meet Marcia in town later. The hotel had a courtesy bus in and out from town as it was about 20 mins walk. We called into a shoe shop that made shoes and boots to measure and Niamh ordered a pair of shoes and in fact returned to the shop later to order some more. We walked towards the river but discovered it was flooded because of several days of rain so we ended up having a drink at Memories cafè. We texted Marcia to join us and she set about walking to meet us but got lost and the heavens opened and she got so wet she ended up back at the hotel. She changed and took shuttle from there to join us. We then went to Mermaid cafè to eat. It rained and rained and as we walked home in the pouring rain Marcia felt a rat (or something like a rat) run over her foot – we were glad to get back to the hotel! chef who takes us to the local wet market, where we watched him buy the food we needed to cook and watched Vietnamese buy and sell their food. We were told that the ingredients in the market were organic. We bought lots of fresh vegetables and herbs and then went to the meat market to get some meat. 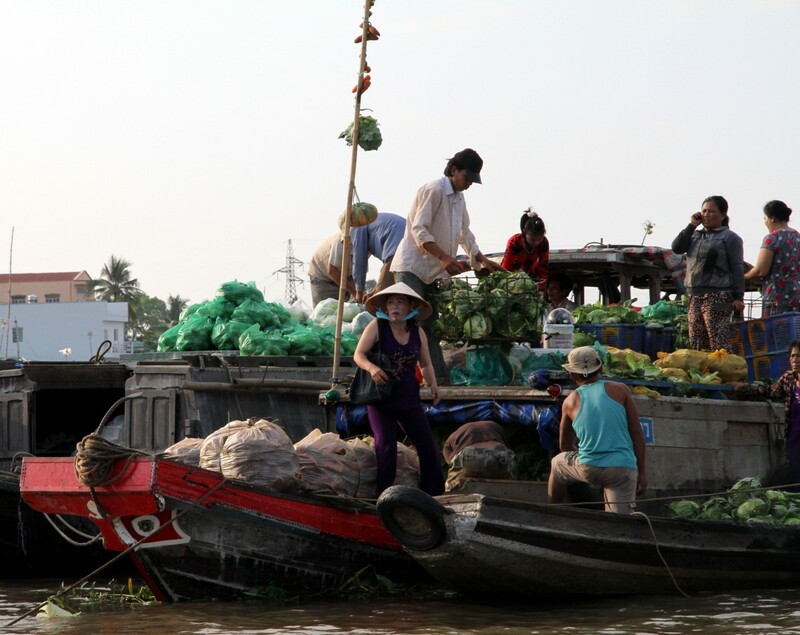 Stocked up with all our ingredients we hop on a boat near the markets and take a 40 minutes ride down the Thu Bon River to catch a smaller boat to take us to Thuan Tinh Island. 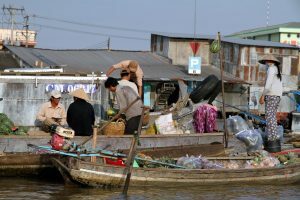 As we went down the river we passed lots of fishing boats on their way back from their morning’s work and were busy cleaning fishing nets from the morning’s catch. In the smaller boat our guide took us along the palm groves to a tiny island – no cars or scooters just boats – no motor boats. 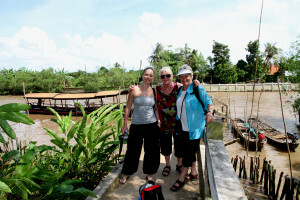 We finally pulled up on a small wooden jetty leading to the local village.There were six of us on the cooking class. 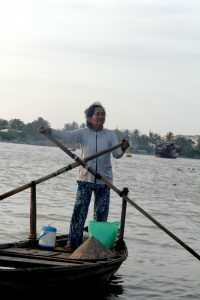 We arrived at the island where a woman with baskets on a yoke was there to collect and carry our food to where we would cook. 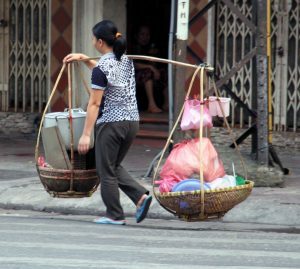 One of the group, an English guy tried carrying the yoke and was very clumsy and unsteady in comparison with the woman who moved so gracefully. 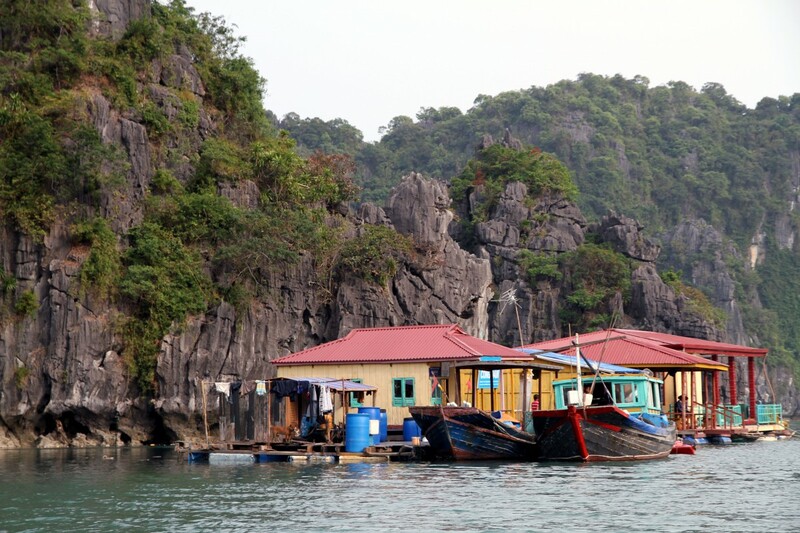 We were then on a tour around the little island where only four families lived. Our guide then took us to watch rice being ground by a manual stone grinder the end result was rice milk which we would use in our cooking class. 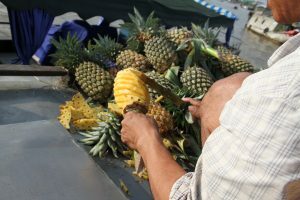 We wandered around the little island looking at many organic fruits and vegetables – green papaya, guava, banana, morning glory spinach, star fruit etc and then came back tot the home where we were treated to baked ice cakes and bananas – yum, we dipped the rice paper in a chili sauce. Next to the cooking class but before we must wash our hands from water poured from a coconut shell. The cooking class was outdoor and both the chef and our guide were really knowledgeable and friendly. Menu for the class was Pho Bo (Beef Pho), Nem Cuon (Spring Roll), Banh Xeo (Vietnamese Pancake). We had a lot of fun and loved the taste of what we made. We also got copies of all the recipes. After the cooking class back to the boat and we were dropped off at the old town and walked very fast to a pre booked pampering session. 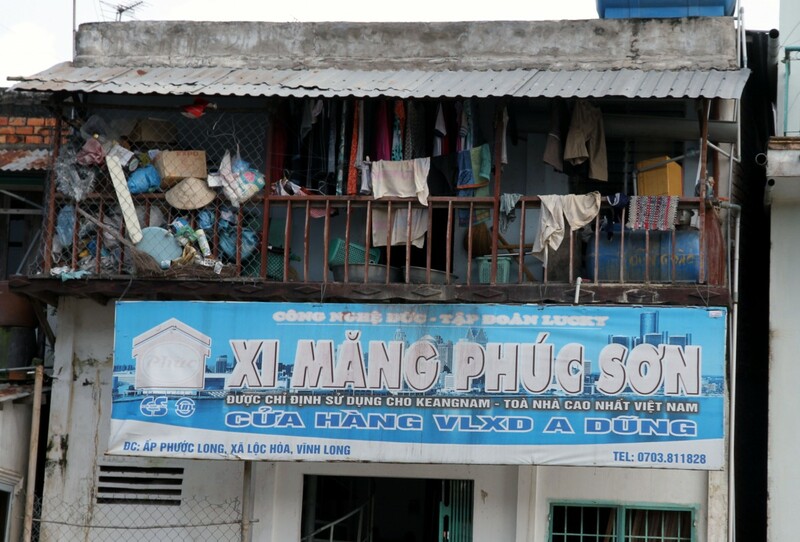 On the way we called to a tailor who had been recommended to us called Ành where we choose what some things we wanted but were limited by time as we needed to get to our appointment so we said we would be back. We did love the pampering but noticed that the sheets and towels were not changed just recycled. After our spa session we wandered back to the tailor(ess) Ành again and made some choices and had some measurements made. Then on to ‘before and now’ for drink and some bruschetta with gorgonzola on top. 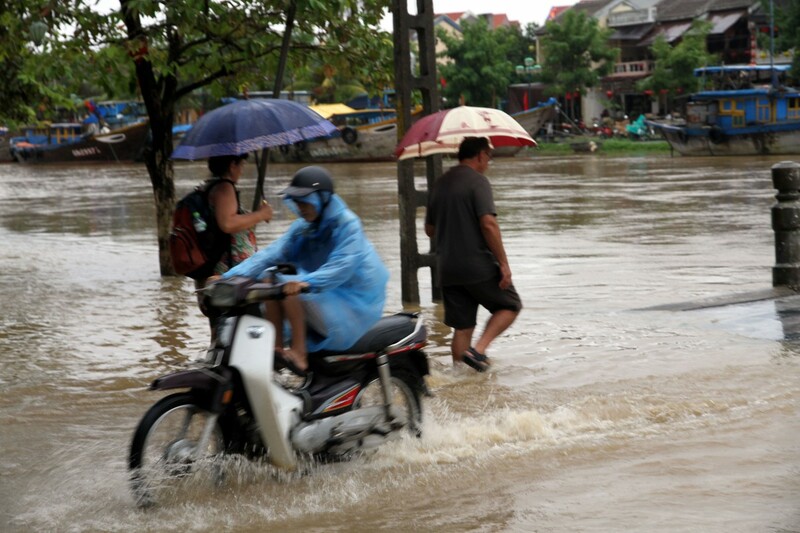 We tried to go to a recommended restaurant on the waterfront but could not get there because of the flooding river but we ended up at the ‘faifoo’ where we had not such good meal! The hotel presented a birthday cake to Niamh everyone wished her happy birthday. 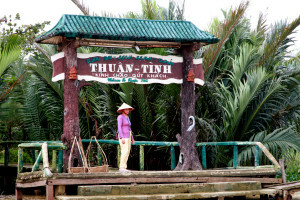 In fact she had so many happy birthdays form the people in the hotel, the cooking class, the spa and in the pub – the staff in the pub sang a happy birthday to her and when we went to the tailor Ành the following night she too had a cake for Niamh. Next day we all hired bikes and off we went out to Cua Dai beach. There were several building sites where large hotel complexes being built. The beach was lined with sandbags because of the wild weather and the rain. we found a Beach resort where we had lunch by a window with a view all along the beach and we saw several locals fish in their helmets. 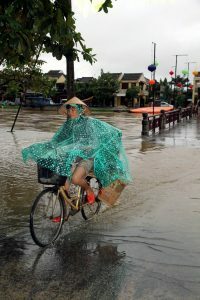 One man was skilfully using a traditional fishing net on stilts to catch fish from the shore. 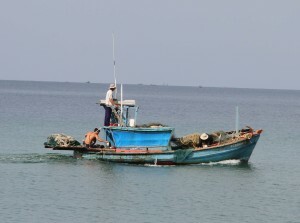 He seemed to let down the nets and then pull them back up using ropes and a wooden turnstile by his feet. He did catch some fish while we watched! 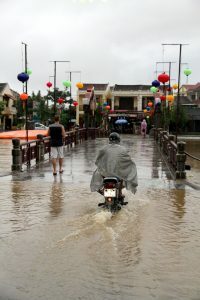 Back in Hoi An we road to the old Japanese wooden bridge, but then the rain came again in bucketfulls – we done our rain coats and walked down to the flooded river to see people riding bikes and motor cycles through the floods across the bridge to the island. 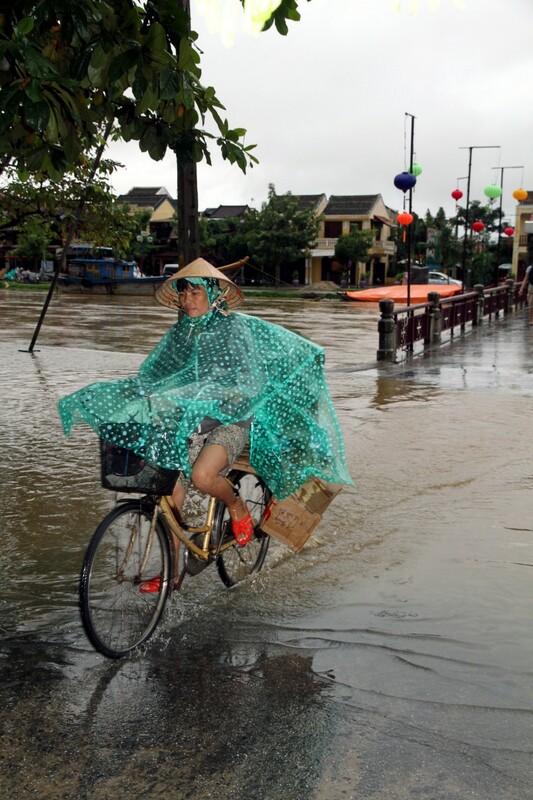 We got soaked just walking to the bridge and parked our bikes close by. It rained and rained and in the end we headed back on the bikes soaked to the skin but had thoroughly enjoyed our day. Back for shoes and clothe fitting again as several items had to be altered. The moral of this story is allow several days to ensure correct fitting. 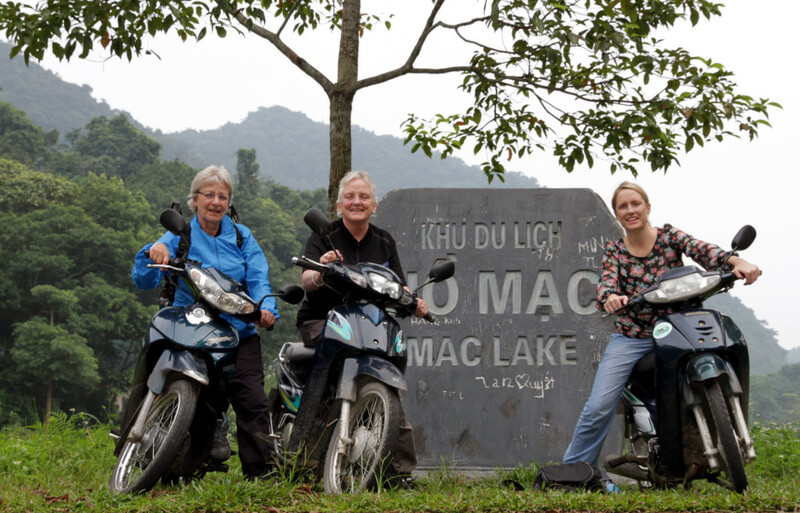 Marcia & Niamh went back to Ành again after breakfast for a have final try on and to hopefully post off gear to UK. Both came back with long faces. Marcia’s dress still not fitting and not really what she wanted and Niamh’s top and pants she was not happy with even though Marcia said they looked good. They also discovered that the cost of freight was huge…$100 for each parcel, it was very disappointing overall as none of us were really excited about any of our tailoring. We were returned to the station in Da Nang via car and once again Marcia suffered from the hassle of lugging bags on and off the train with her sore back which was not getting any better. We stocked up with noodles and snacks and got into our sleeper on coach 8 berths 21- 24. When we got on the train we noticed that our beds had been slept in so we asked for clean sheets so we could change them. 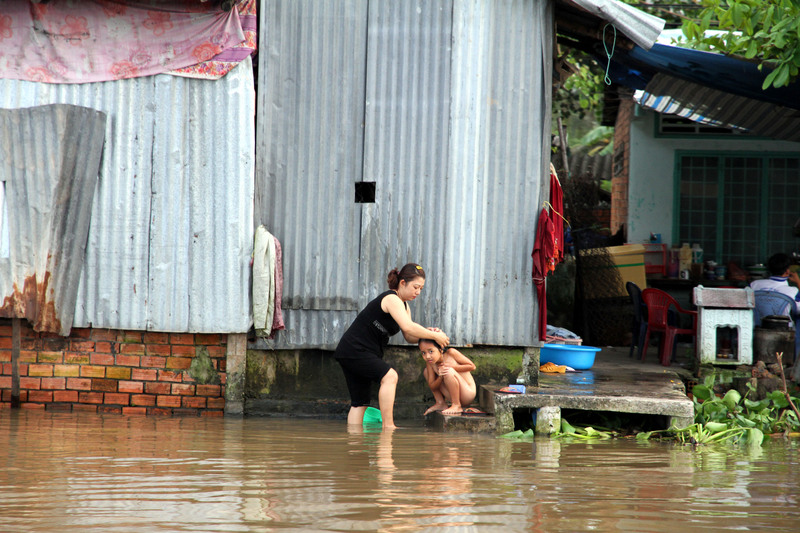 It rained all the way into the night and the land was heavily flooded most of the way. 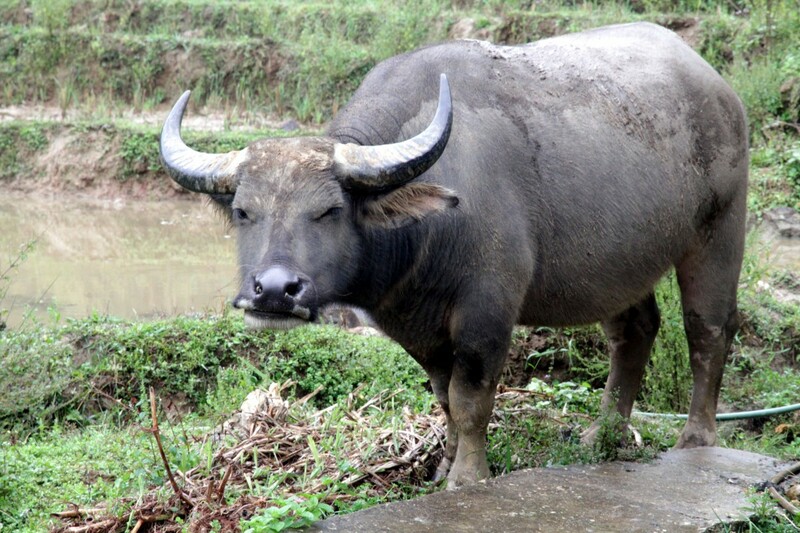 Buffalo loved the mud and rain as did the kids on the bikes. We were sick of it only after two days of it. Imagine how the locals feel after 40+ days of it! I was visited by furry friend who ran from the floor over my head but despite that we managed to sleep through the night and did not see him again. 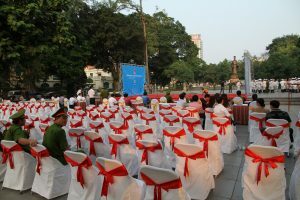 Arrived in Saigon at 5.30am, but sadly despite my planning, there was nobody to meet us, so we took a taxi to ‘Beautiful Saigon 3’ in district 1. We were greeted warmly with apology for no car at the station and offered breakfast and the use of a shower until our room was ready. 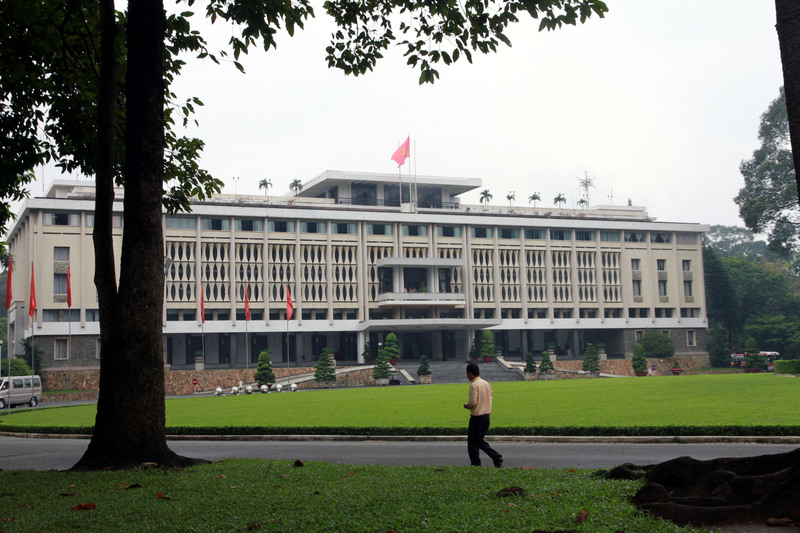 We were all pretty tired so we ate a hearty breakfast and headed off to visit the Reunification palace or Independence Palace The building is associated with the fall of Saigon in 1975, The first Communist tanks to arrive in Saigon rumbled through the palace gates on the morning of 30th April 1975 and as several guide books say ‘it’s as if time has stood still since then’. The tank crashing through the wrought-iron gates made headline new all over the world and a soldier ran into the building, up the stairs to the 4th floor to unfurl the VC flag from the balcony. 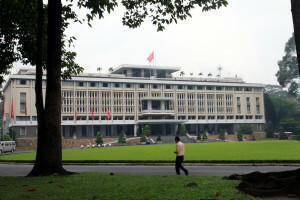 General Minh and his cabinet were in the reception room on the 2nd floor. Minh had only become the head of South Vietnamese State just 43 hours before the tank came through the gates. He said to the VC officer ‘I have been waiting since early this morning to transfer power to you’’, to which the officer relied; ’There is no question of you transferring power’,‘You cannot give up what you do not have.’ It is a fantastic roomy airy palace with many remnants of the past and the spacious grounds were alive with history and full of old tanks and planes used during the war and the takeover. We all sat under the 1000 year old tree which we were told, by a guide, would heal stress and backache. 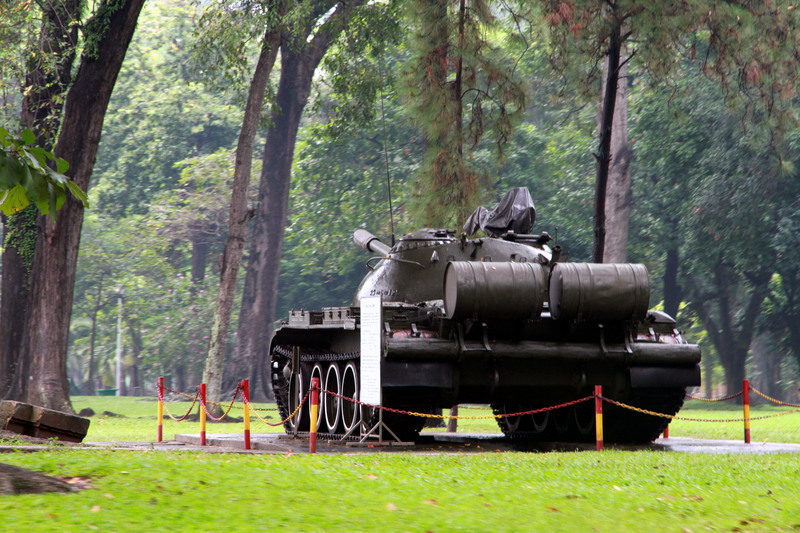 We then walked to the war remnants museum and once again we were reminded of a war that happened in our lifetime. 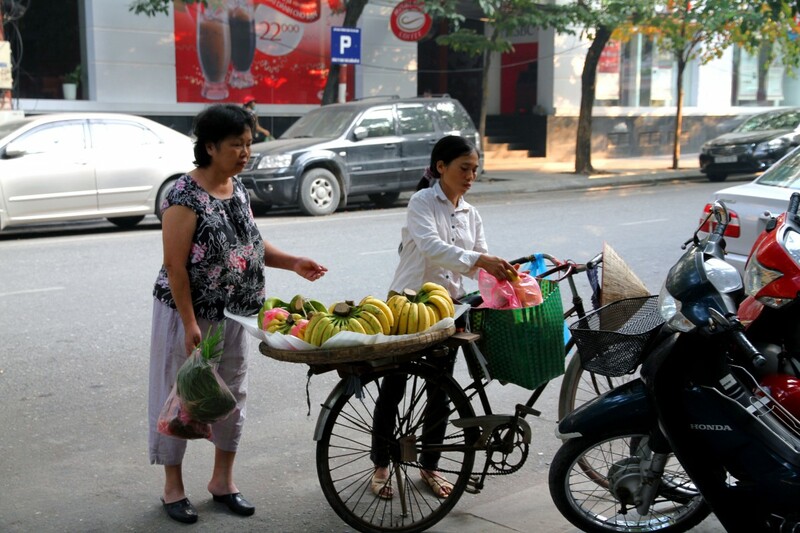 Many disabled/disfigured people from the war come here to sell or beg for money. 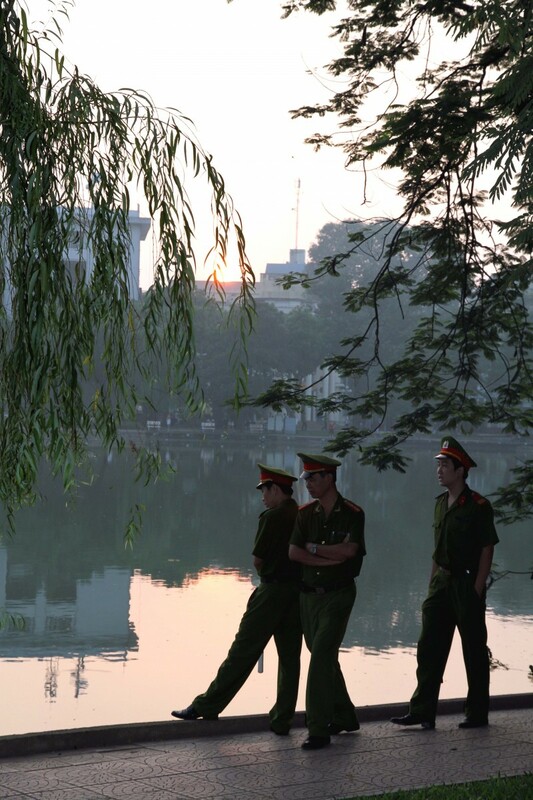 I suspect they use this area to gain sympathy for the tourists who well remember the Vietnam war. 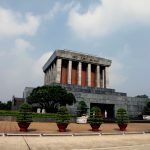 The museum gave Vietnam’s view of the war and its aftermath and though it was very one-sided it encouraged some soul searching and was depressing, leaving one with as sense of guilt that we may have contributed to the many graphic atrocities recorded. I did wonder, if any of the soldiers in the photos every came back and saw themselves as they were shown in those obvious violent photos, how they would feel. It is not surprising that most soldiers do not want to talk of the war and suffer numerous mental illness if things happened as they were depicted in the pictures – killing pregnant women, young children, babe in arms, beheaded people etc…. There were many very quiet pensive people walking around but need to always remind ourselves that this is from the Vietnamese perspective. 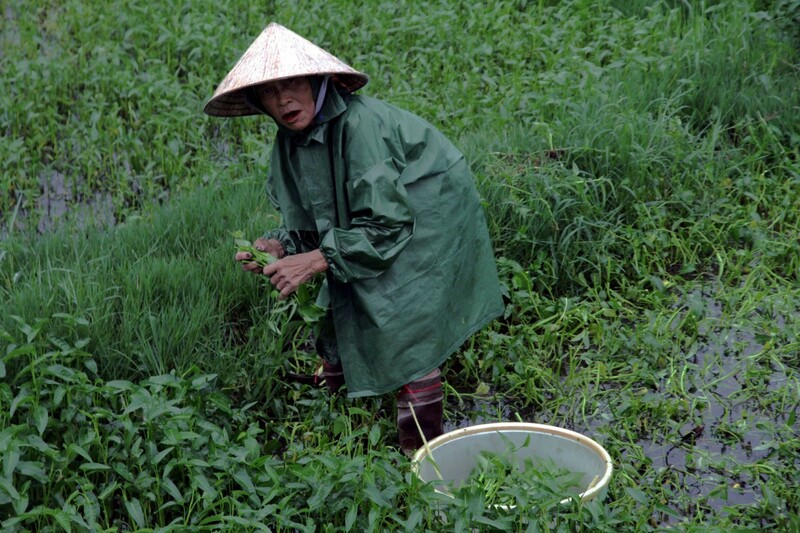 There were many graphic photographs showing the devastating effect of Agent Orange. What were people thinking of using such chemicals? The whole day left lots of food for thought. 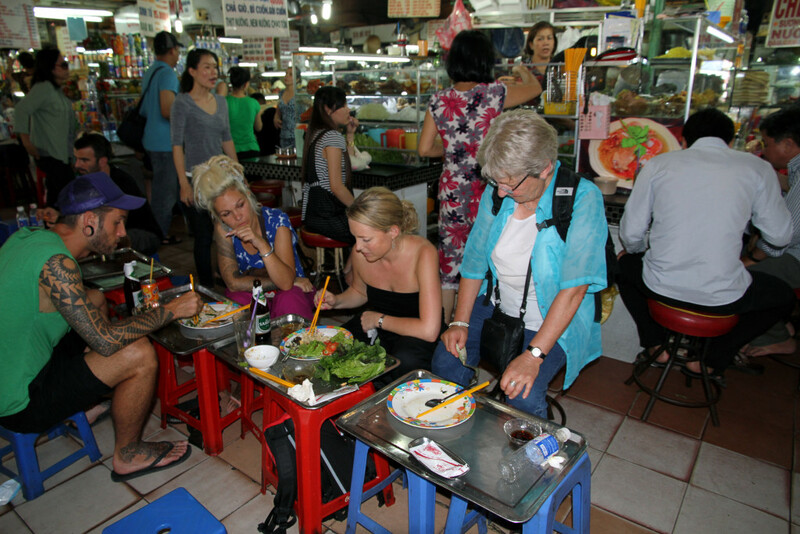 From the Palace to the markets and found some excellent street food where we sat on baby plastic chairs to eat. Just next to us were a Dutch couple, the man had 4cm wide loops in his ears and his partner had the longest nails I have ever seem (acrylic of course), and iron everywhere she could fit it on her body as did he. I wonder how the managed not to get tangled in all that iron! 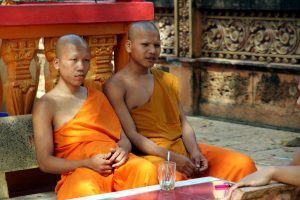 Both bodies were covered in tattoos but they were really nice and chatty and gave Niamh some tips for travel through Cambodia as they had just come back from there. 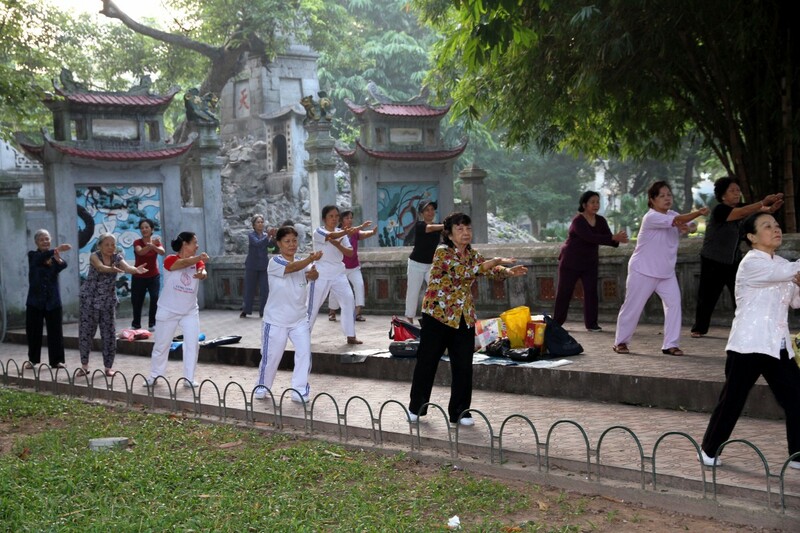 After a SCAN (Senior Citizen’s Afternoon Nap) we went to a local place for drinks and then a taxi to Cục Gạch Quán. What an amazing place very eclectic furniture, tiny rooms steep steps, low arches, trunks for table, large four poster bed nowise to serve meals. 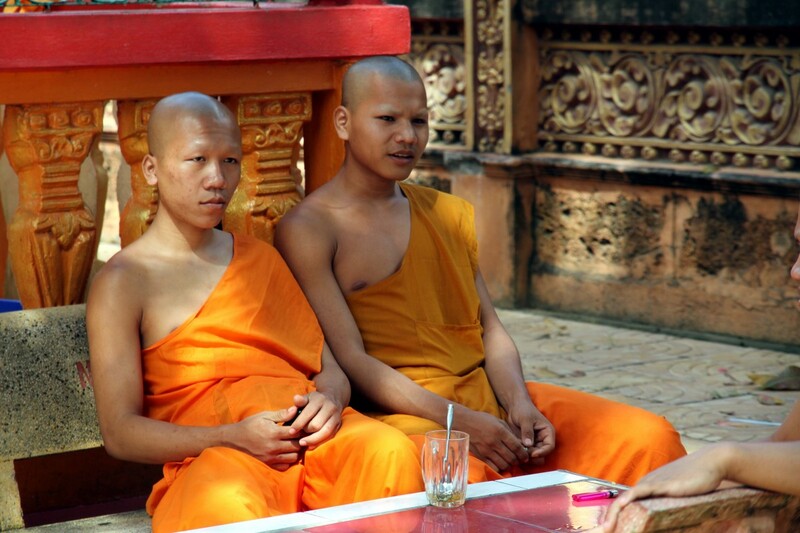 Two men in one corner of the room sat in lotus position to eat their meal. Food was fantastic – one of best yet. The restaurant was just full of atmosphere and unusual artifacts and the service and staff were amazing. Rang our trusted taxi man to take us home to hotel. What a great day and evening! 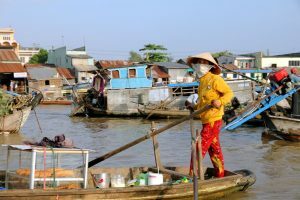 Today we start our three days adventure on the Mekong Delta, booked through “Come & Go Vietnam”. 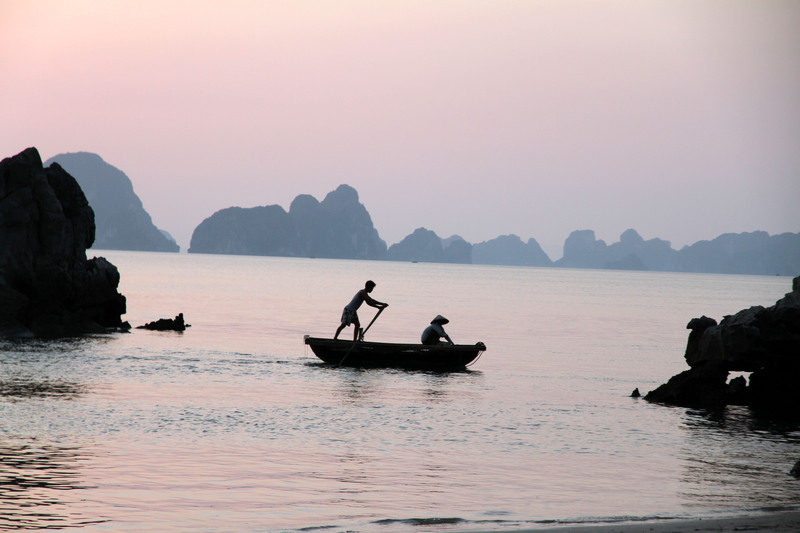 Picked up early from hotel by Thong (pronounced Tom Hanks or Tom and Jerry whichever you prefer said Tom on meeting us!)) our tour guide who took us to our coach. It was a big six seater a/c van and was very comfortable. 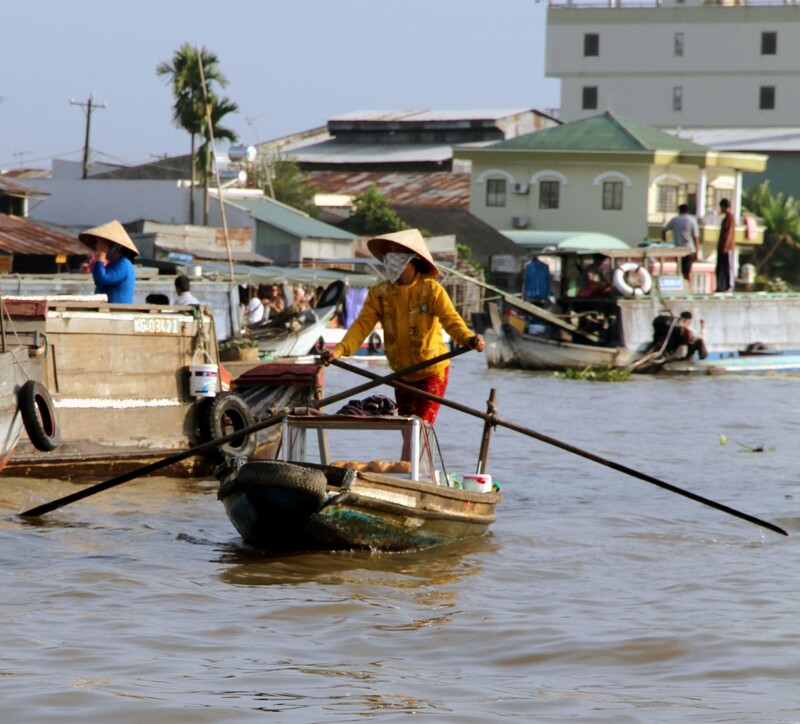 We drove down to Ben Tre which took us about 1 1/2 hours. 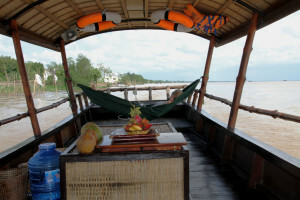 We drove to the dock and went to what Tom called ‘the happy room’ before boarding a smart comfortable boat with chairs that we could relax in. 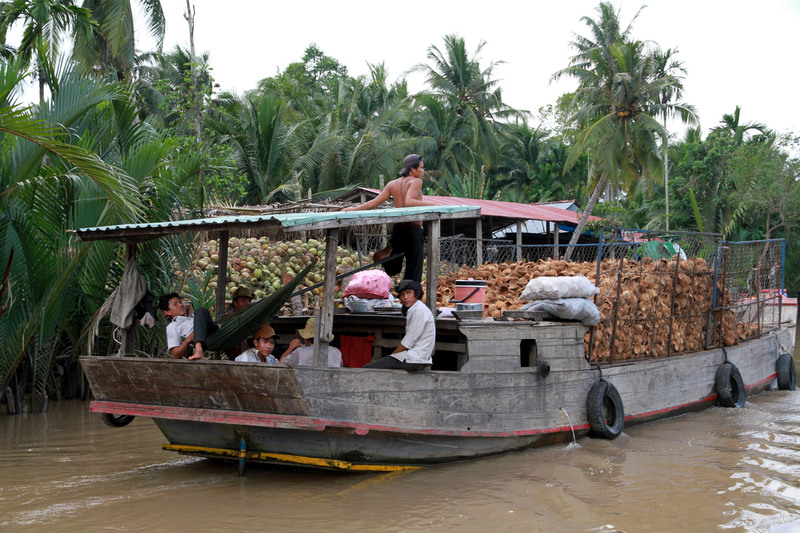 The driver of the boat took us along the Ham Luong River a tributary on the Mekong. 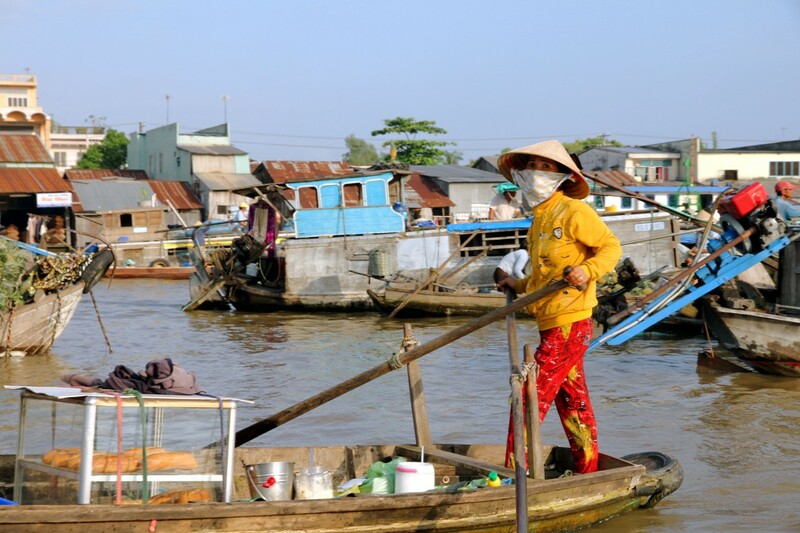 There are nine estuaries to the Mekong River – called the nine dragons and all the boats we passed had two large eyes painted on the front protect them from the dragons. We stopped at a brick-works on the banks of the river where building bricks are made by hand – extremely labour intensive. Clay from rice paddies and the husks from the rice were used to burn the bricks in the kiln and turn them red. 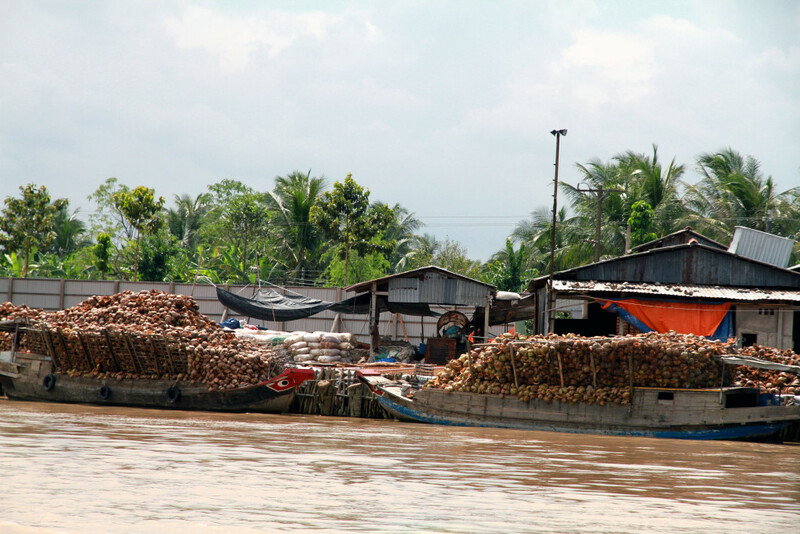 Our next stop on the river was a coconut processing workshop where coconut candy is made – six flavours, plain, peanut, chocolate, durian, pineapple and mango. Each individual candy was wrapped in rice paper and covered with different coloured paper to identify the flavour. We saw them break the coconut, turn flesh into tiny shaved pieces and then boil them in enormous wok over live fire kept lit by leaves, old wood and broken coconut shells. This was again so labour intensive. There were several women sitting around just wrapping the small squares of candy. There was a shop where you could buy the candy or other things made from coconut such as salad servers, scoops, water pourer etc. 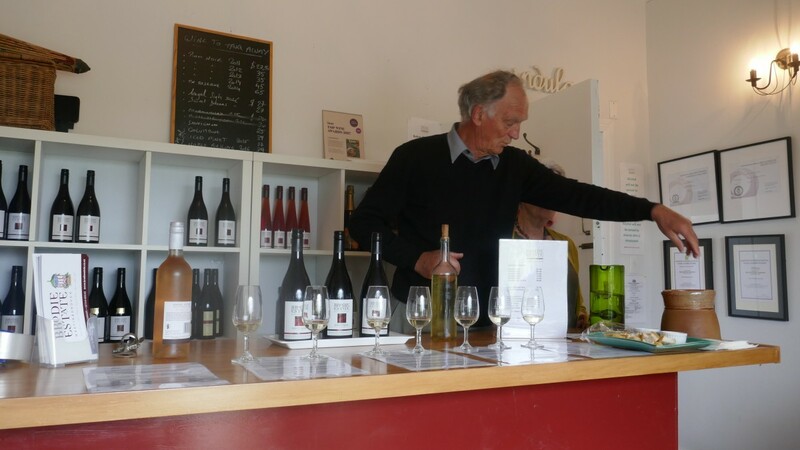 We tasted some coconut wine – it was pretty potent! Then we had a lovely cool drink from coconut which was in fridge. 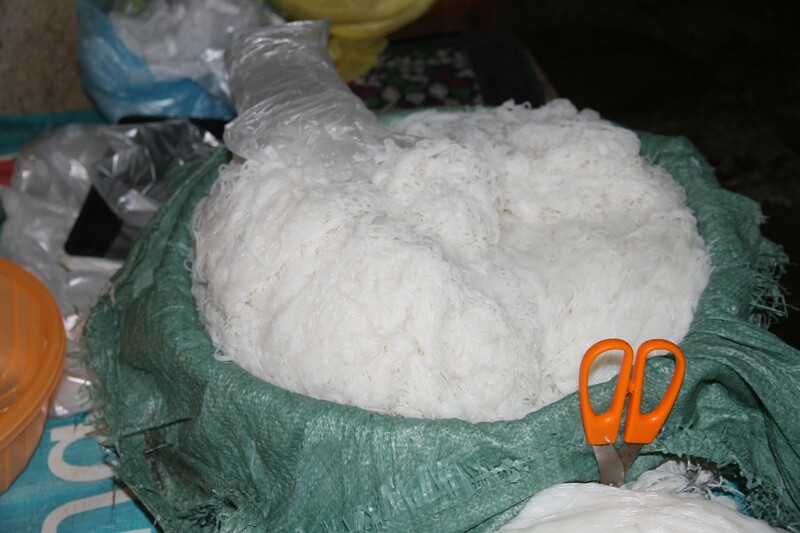 Coconut is so versatile and all parts of it are used, nothing goes to waste, we even saw the outer shell used as an insulator for a tea pot. 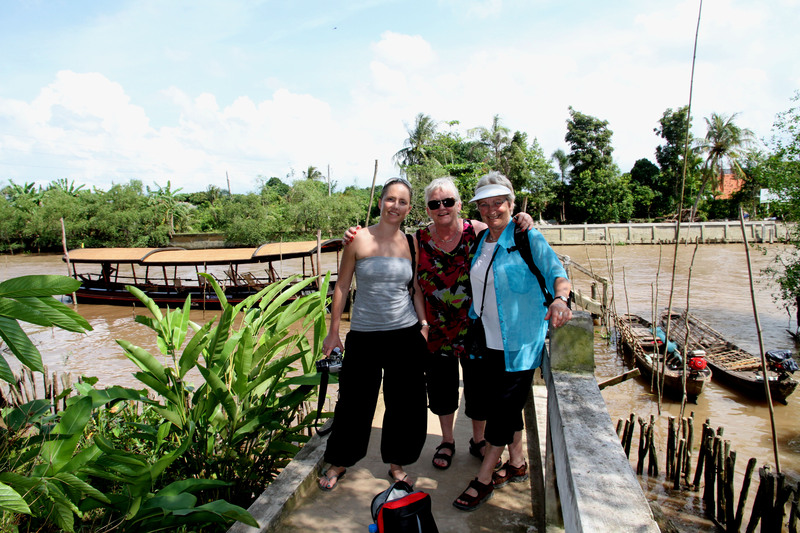 We then stopped at a small village to walk through to see what village life was like. Lots of fruit on trees, vegetables in the ground and very simple homes – enough to be self-sufficient. 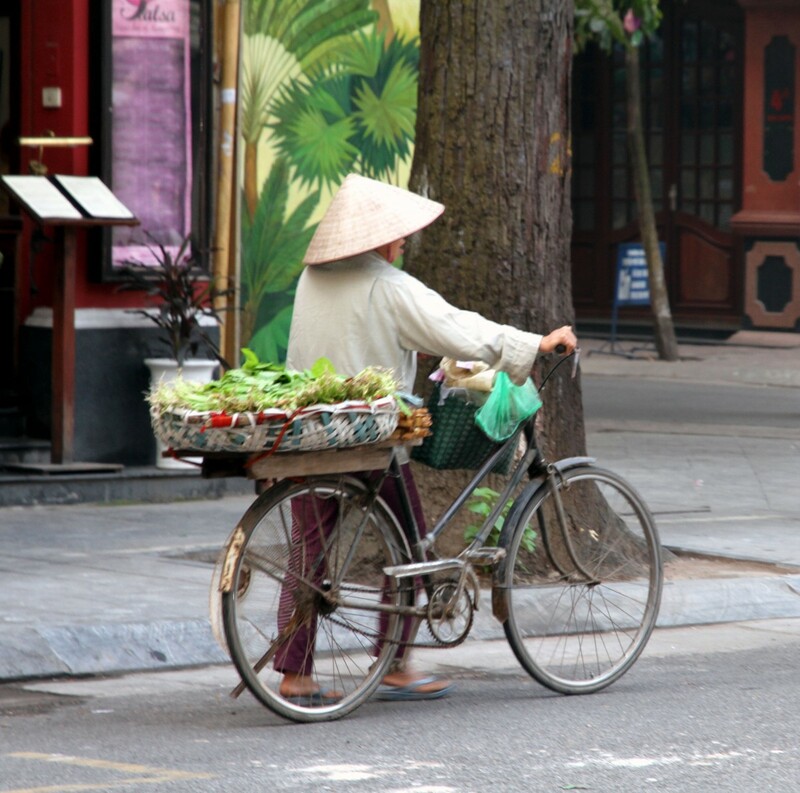 The husband of the lady of the house goes to HCMC (Saigon) for work and her children also live away so she manages the house and garden. She offered us bananas from her trees and tea. 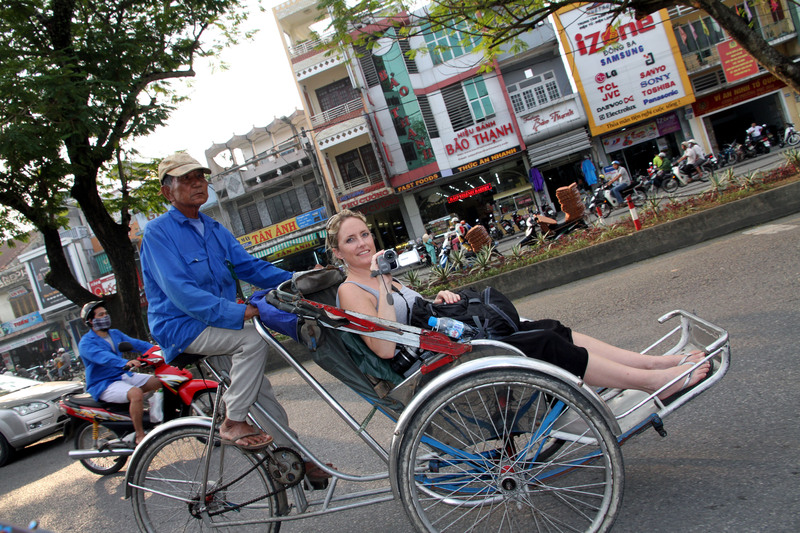 We then walked to where the Xe loi (motorized rickshaw) was waiting. Our cases were already in the van when we got there so we three, our guide Tom and our local guide hopped on and sat alongside the luggage. Off we went towards our rural home stay. It was a strange feeling sitting on the back of a motorbike while the driver chatted on the mobile phone. The first part of the journey went very well and we were all enjoying the ride until the road became increasingly narrower. 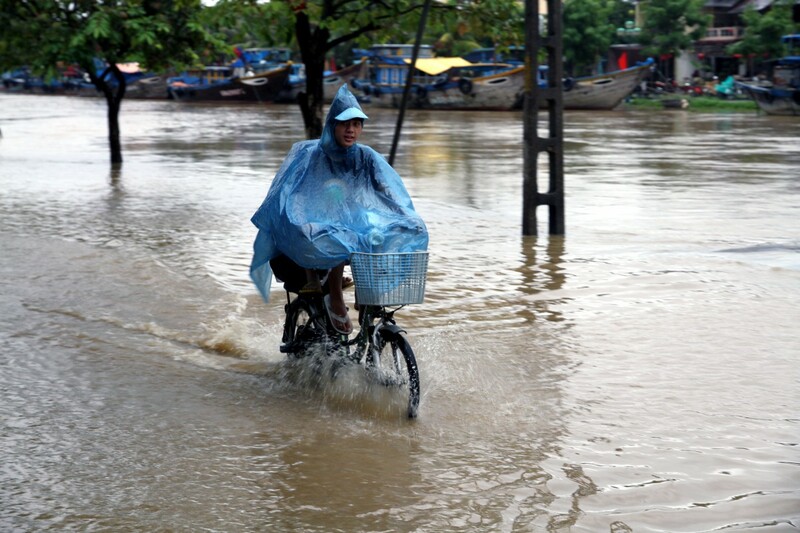 Suddenly we it seemed that the motorized rickshaw was over the edge of the road and hanging there on top of a river!! It was pretty hairy for a while and then we arrived at an even narrower road where we came to a halt. Whew! There to meet us were our home stay hosts for the night. They loaded our suitcases onto some motorbikes and took off, we followed on foot. Our home stay was beside a river in the home of Mr. Phouc. It was all very basic and set in a kind of compound with loos and showers in one area and sleeping quarters in another. No glass on windows but all had ‘mossie’ nets -Marcia’s one had hole in it but she did running repairs with a safety pin. Marcia and I slept in one partitioned area and Niamh next door. Our guide Tom slept in the bunk outside our door only separated by curtain! Not much privacy but we were fine with it. We sorted our beds and headed for lunch – we had our first ‘Elephant’s Ear Fish’ cut expertly by the waitress who showed us how to wrap it in a spring roll. 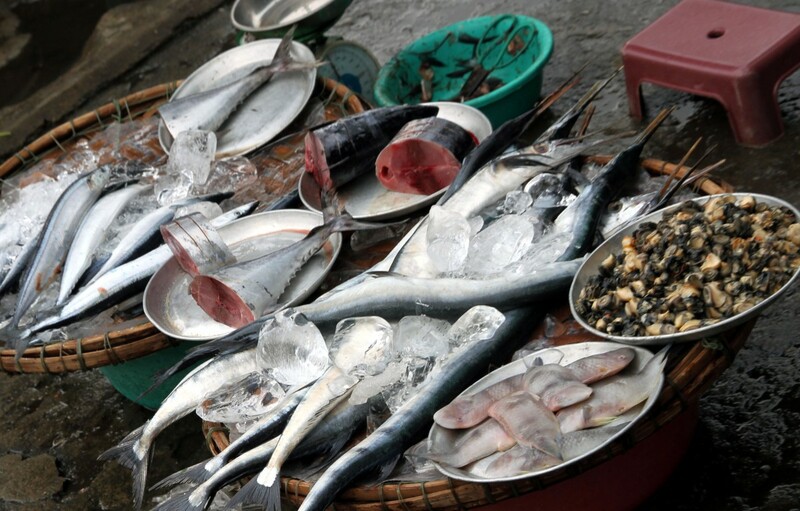 This Elephant Ear Fish is a specialty dish in the Mekong Delta. 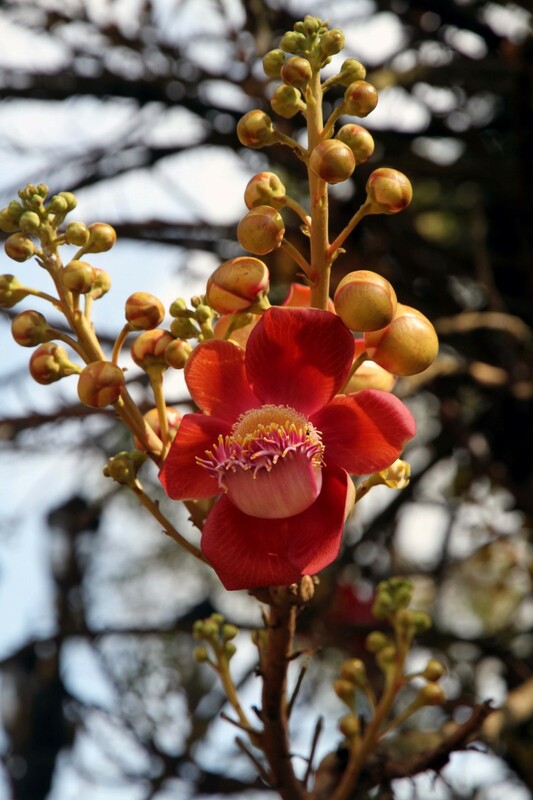 It is called that because of its appearance. 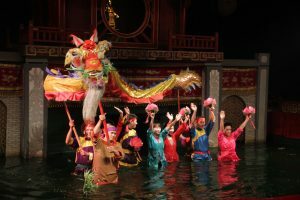 It is lightly fried, crispy fish which is served upright, with its scales and teeth still attached and a flower in its mouth. We had lime, chilli and lemongrass dipping sauce and vegetables with the spring rolls. 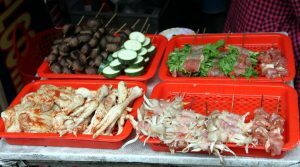 We the assembled the spring roll ourselves with the fish meat and herbs. I personally found the fish a bit tasteless but so wonderful to look at and the accompaniments and sauce gave it a great flavour. The food was delicious but there was far too much. This seems to happen overtime we sat to eat, even when on our own – sometimes in our eagerness to taste new dishes we ended up with much more than we could possible eat. After our lunch we had a rest in the hammocks dotted all over the place. They were placed in the shade and were superbly comfortable. 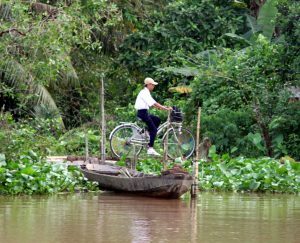 After half an hour we were taken to a small boat called a sampan and our bikes for the bike ride were taken in another sampan. 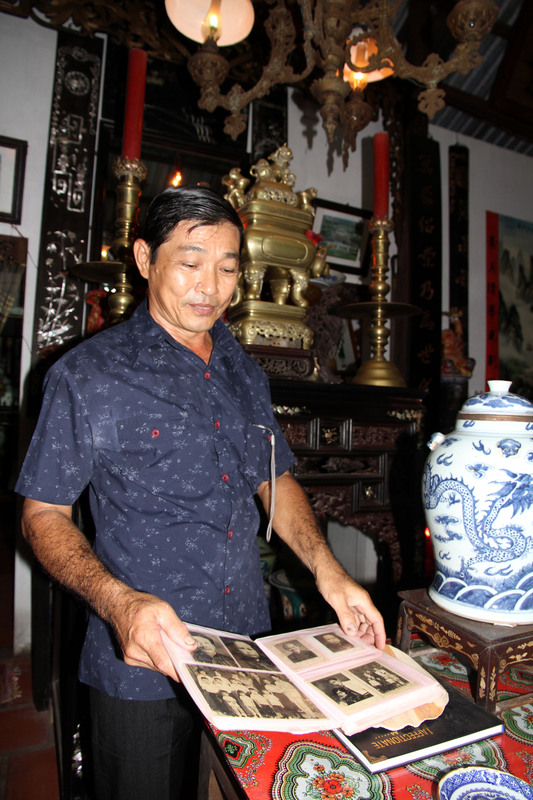 After a trip though local waterways the bikes and the riders were dropped off, we hopped on the bikes and wobbled our way on a narrow path to see Mr. Khanh an antique collector who housed his collection in an “ancient house’. 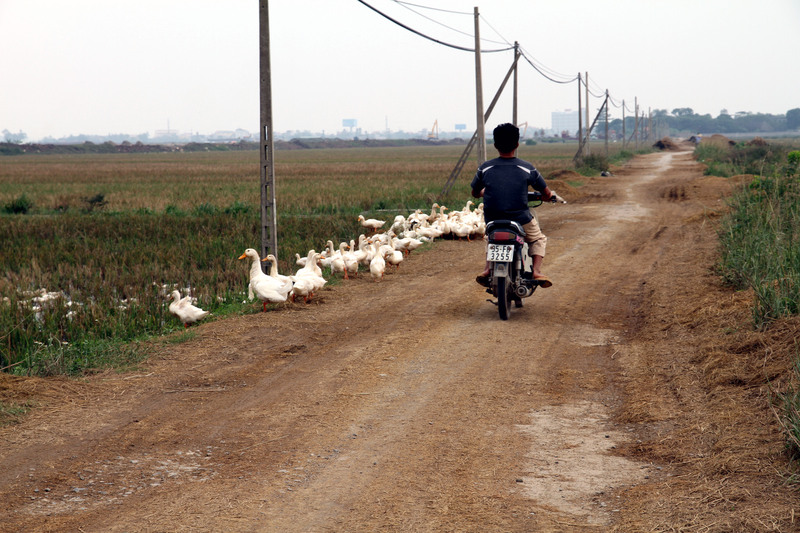 We spent most of the ride desperately trying to avoid motorbike passing us in either direction. 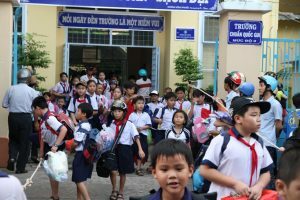 We knocked on Mr. Khanh door but he was obviously not expecting us as our host had been take ill and gone to hospital and had not had time to arranged this trip with him. However, he quickly put on his best shirt and opened his doors for us. 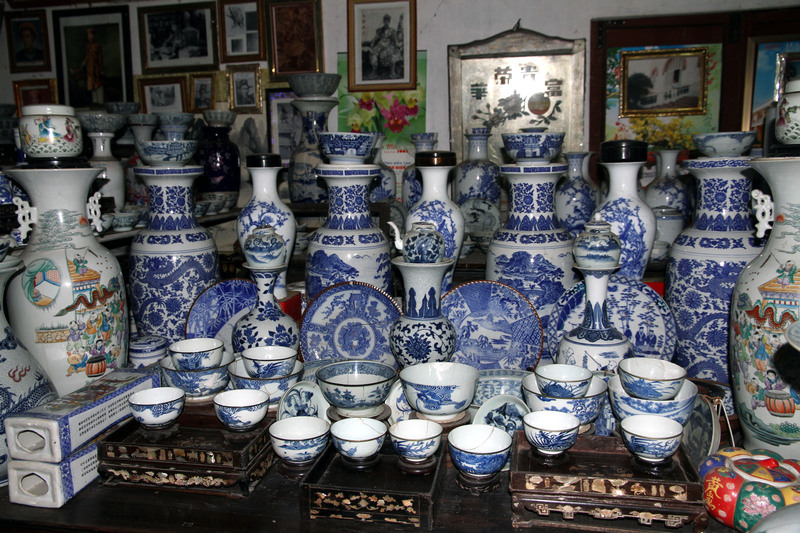 Wow what an incredible collection, he buys lots of china and antiques but does not sell them. He even had some pieces from the Ming dynasty and many other valuable antiques. He also showed us many family photos and claims to be the ninth generation descendant of the King…… He was such a delightful person and very proud of his collection which seem to us to be housed in the middle of nowhere. 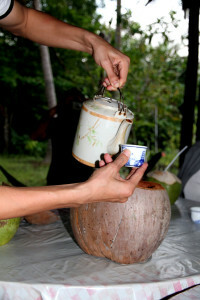 He picked some coconuts from his tree and then offered us some tea in his garden where we sat around a table. There was an outside shell of a coconut on the table – he proceeded to take the lid of and there was the teapot being kept warm – a natural tea-cosy. What a great use of natural products! He ran around us taking lots of photographs – just as many as we were taking! Marcia suggested this may be an insurance policy so that anything taken from his house he could identify who had been there. Not a silly thought!! We rode home having really enjoying the whole experience. After settling into our rooms we went into the family kitchen and helped prepare the dinner. We made cabbage rolls stuffed with a pork mince and tied with boiled spring onions. 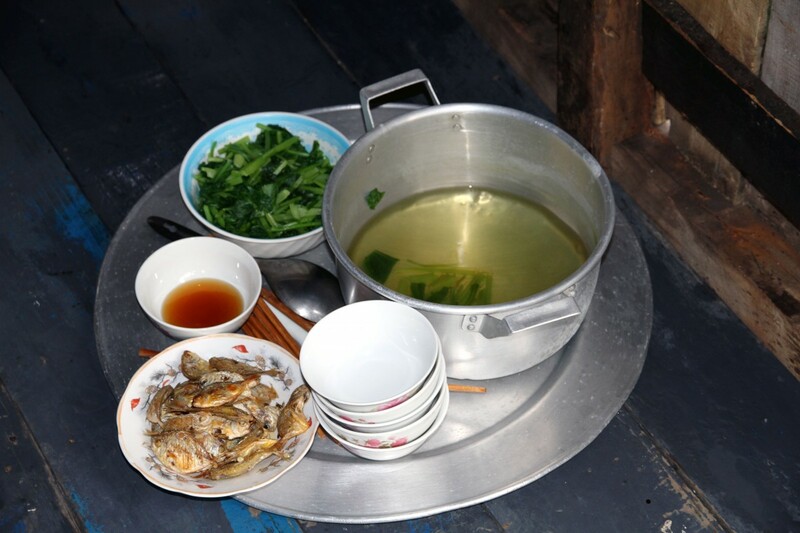 We grated papaya for salad, we constructed spring rolls with meat and vegetables, we sliced aubergine and mixed it in a batter for frying and we cut bananas in half diagonally and flattened them for dipping in batter and frying. When we had finished they had set up a table in the middle of the garden and we sat and had a few drinks as we waited for dinner to cook – The meal was splendid and even better for playing a part in it’s preparation again beautiful food but too much as usual. Loved the eggplant, fried bananas and chicken wings…. The host was away so his brother was acting host in his place and he sat chatting to us (via our guide Tom) all through dinner and was addicted to tea by his own admission! After a lovely breakfast we hopped on our bikes to visit a papaya farm. 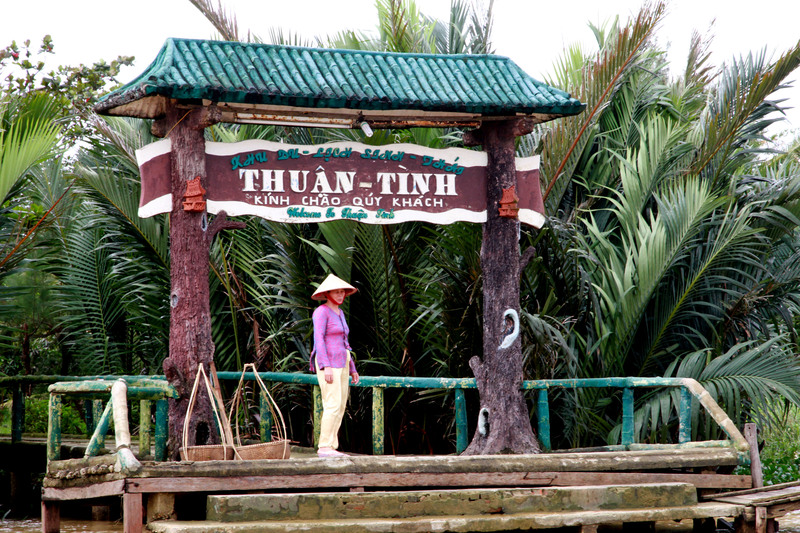 The owner, a really lovely man, insisted we pick a coconut from the tree and drink from it. Once we had chosen it he prepared it skilfully for us to drink from. 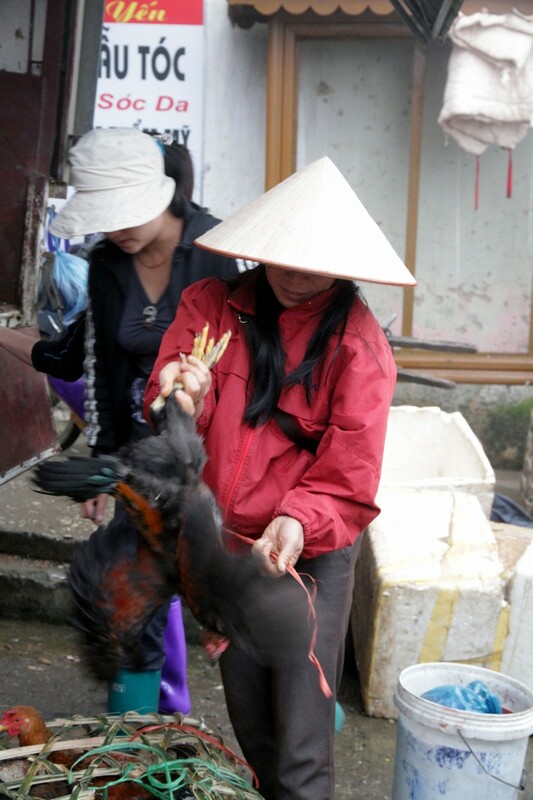 He also showed us his papaya trees and his chickens that live in an upside down hat in a room inside a house. We got lots of glorious mud on our shoes and had a slippery ride home to our homestay. We said goodbye to our hosts who were truly a lovely family and well use to having tourists come and go. The boat took us back to the war at Ben Tre and we walked to the local market. There were all kinds of snakes, toads, frogs, fish, eels, all types of vegetables even water lily roots for sale in the market. 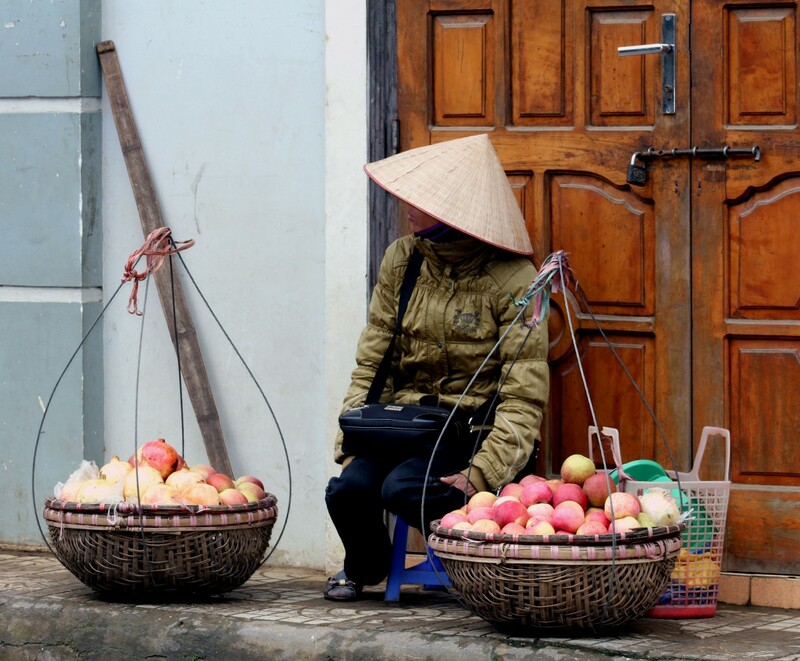 The Vietnamese use every component of every type of food for food or useful utensils or raw material for further use – nothing gets wasted. Waiting at the wharf for us was a very comfortable looking boat that we would spend the next four to five hours on. 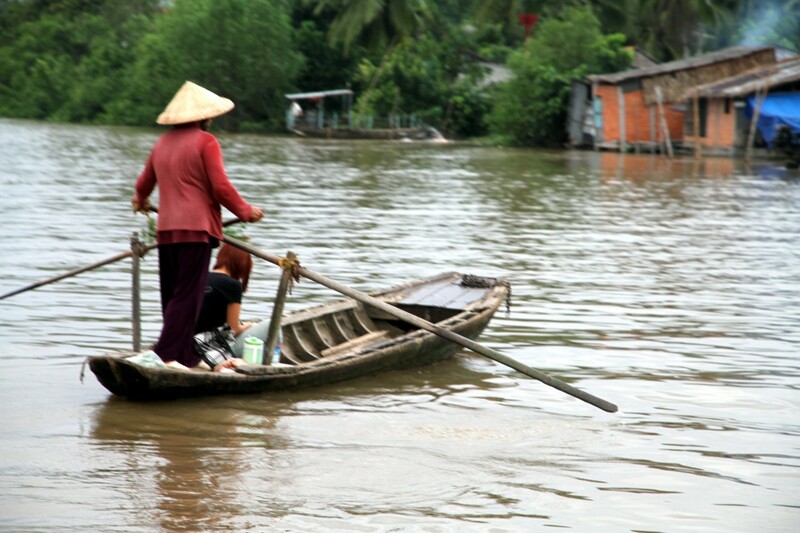 We were now finally going on the Mekong Delta river. Our first stop was Mr. Ba Linh’s house for lunch where we were served Elephant Ear fish, and again lots of lovely food. Elephant Ear fish is always served standing up in a wooden rack – so that fisherman boats that caught it will stay upright. 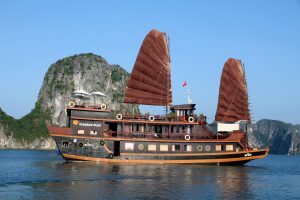 The restaurant was surrounded by beautiful lush gardens which we wandered around after lunch and the waled back to our boat. While we had been at lunch the boat man had changed the upright chairs to reclining chairs and a hammock at the stern to make our trip more comfortable…lovely. 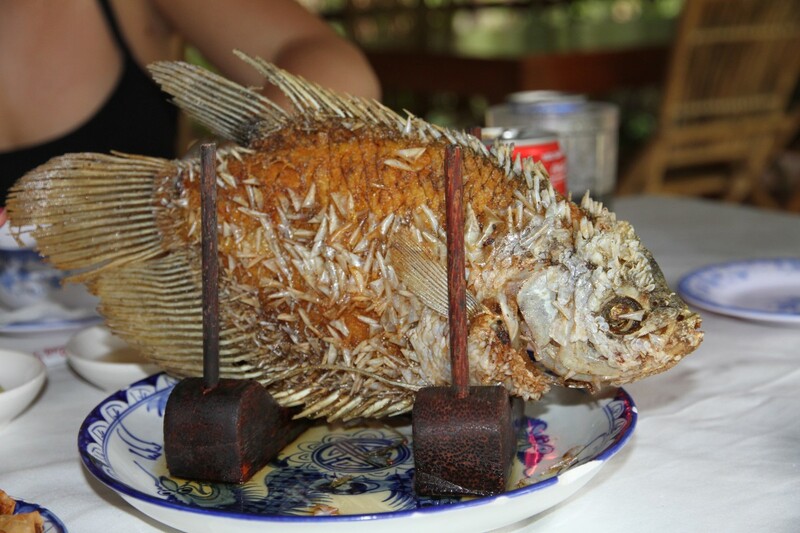 Elephant Fish – I did not find it very tasty! 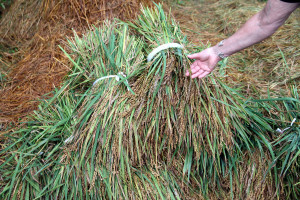 We stopped first at a rice processing plant just to see the final aspect of the rice process from the paddy fields to the table. 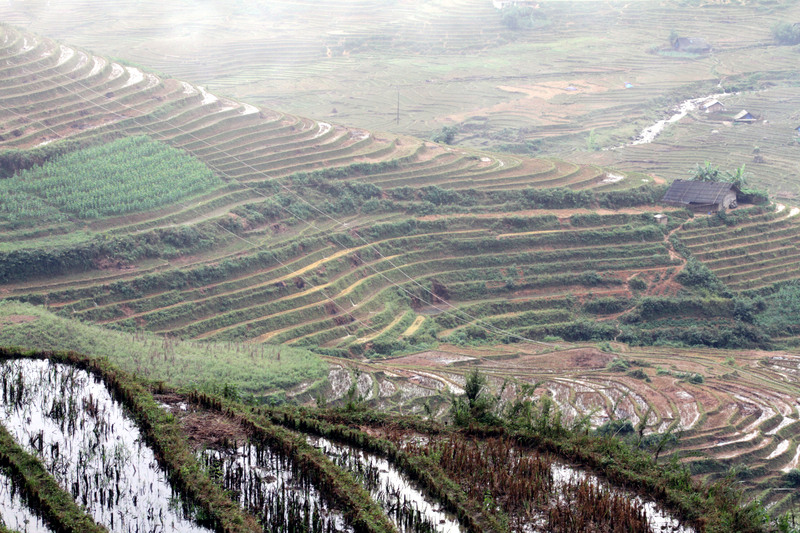 Vietnam may soon become the world’s biggest producer of rice hence this is a very important industry for the future. We also passed the sampan making factory that were in fact making junks instead of sampans at this time but the wood and workmanship are very similar. 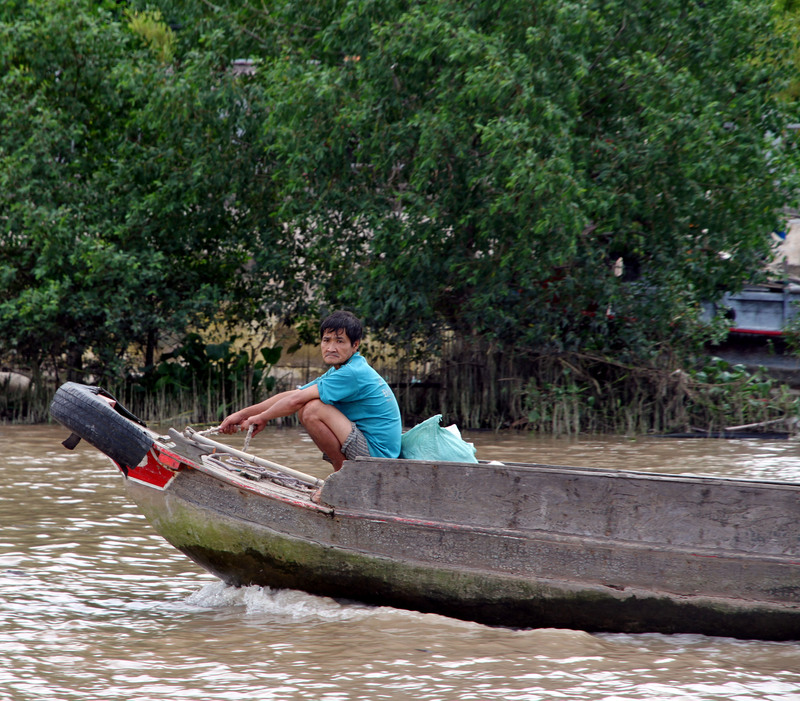 The description of a sampan is that it has three planks in bottom of boat. After that we decided we had enough sight seeing for one day and settled back to enjoy the boat trip. 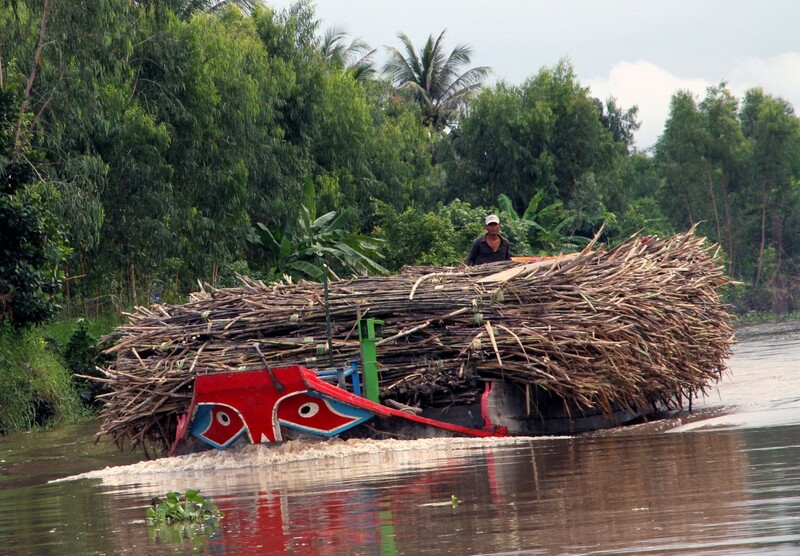 We twisted and turned up many waterways – how the driver knew where he was going was a mystery. 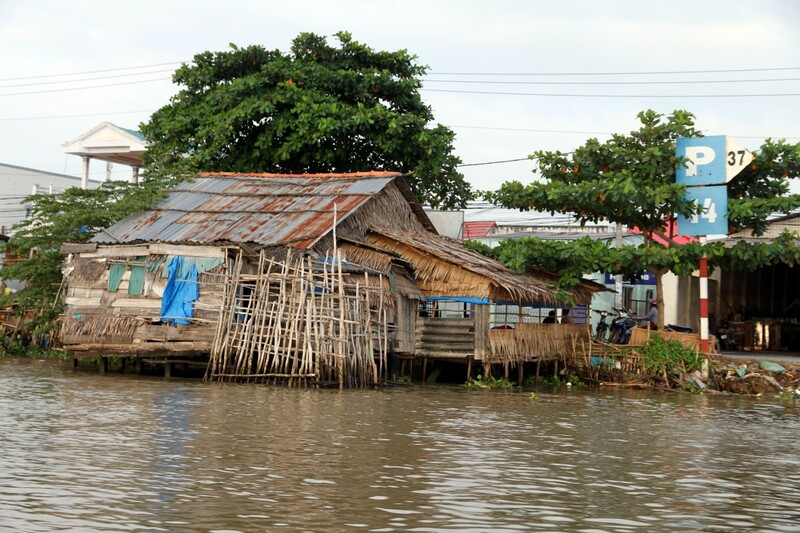 We passed many homes mostly very basic homes, many on stilts with just cloth hung for windows. 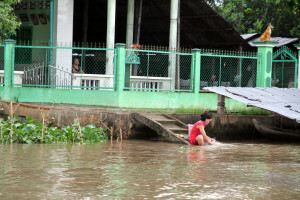 Kids were playing on narrow wooden decks or in the water and women were washing themselves or their laundry in the river. You could see right into many homes and watch people eat their meal, dress themselves or go about their daily chores. At 17:30 we arrived at Can Tho, the biggest city in the Mekong Delta and booked into our hotel, called Hotel Kim Tho Hotel, where we had rooms on the eight floor with great views over the city. The boat man had to then head back three hours up the river to home and would not be home before dark. Tom made sure we were settle in to hotel and said he would see us later. We shower and headed up to the roof top cafe where we were told they serve wine -alas not to be. 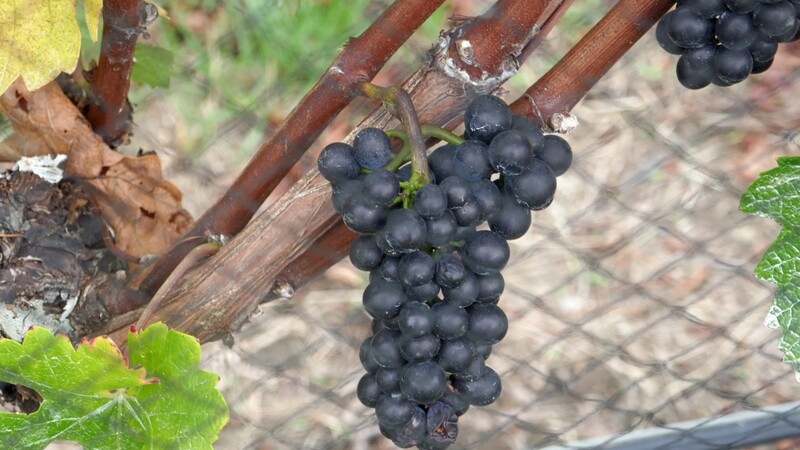 Many hotels and restaurants mistake wine for spirits such as port and sherry which are of course fortified wine but finding wine in Vietnam is not easy – in some pubs your choice is Dalat red or Dalat white or sometimes a Bordeaux red or white. We have very good meal at at restaurant close to the hotel – we tried a hot pot for first time – again ordering far more than we needed but wanted to try them all. All the dishes were lovely but really only needed the hot pot. Marcia went home to rest her back and Niamh and I went for a walk and ended up in night market where we bought some T-shirts and a cushion cover. 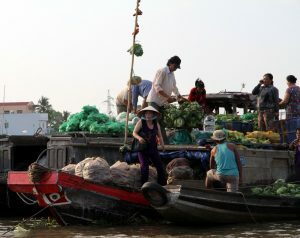 Next morning Niamh and I met Tom in lobby at 0630 to travel by boat to Cai Rang Floating Markets about half hour boat ride away. Tom told us that a lot of the activity was over by about 0730 as the locals are there by 5am when it starts. 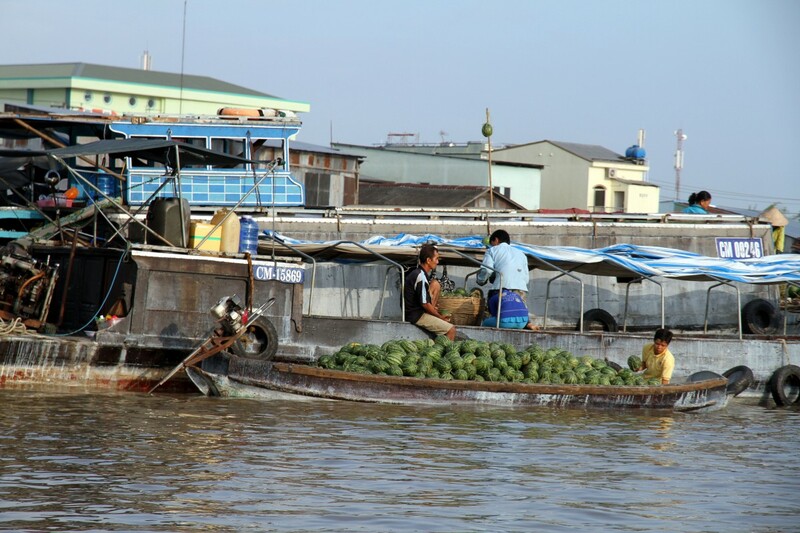 However, there were still lots of boats with fruit and vegetables aboard. 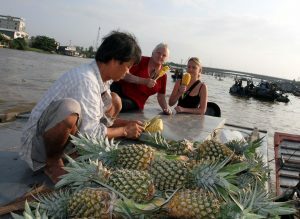 One knew which boat to go to because if a watermelon hung on the stake of the boat then that was all they had on board. What hung on the stake was what the boat had on board to sell. 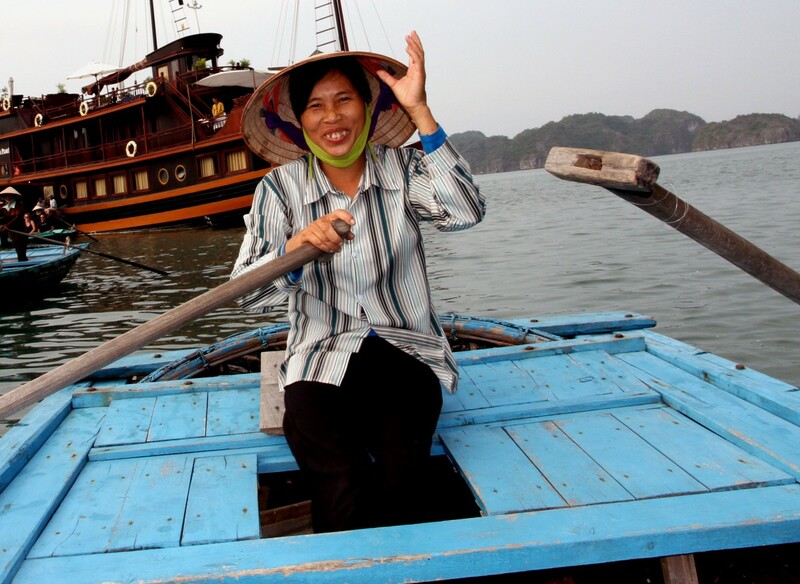 If you saw a straw hat hanging on the ceiling of the boat that meant that the boat itself was for sale. We stopped at a pineapple boat and hopped on board, we bought two pineapples from the owner. He quickly peeled it and cut out seeds and handed half to Niamh and the other half to me, both were on sticks – lolly on a stick. We also bough another for the driver of the boat and his little girl who had come along to sell her wares – fridge magnets and bracelet. We bought two fridge magnets from her as we really did not want to buy anything but she was so cute and so desperate …. 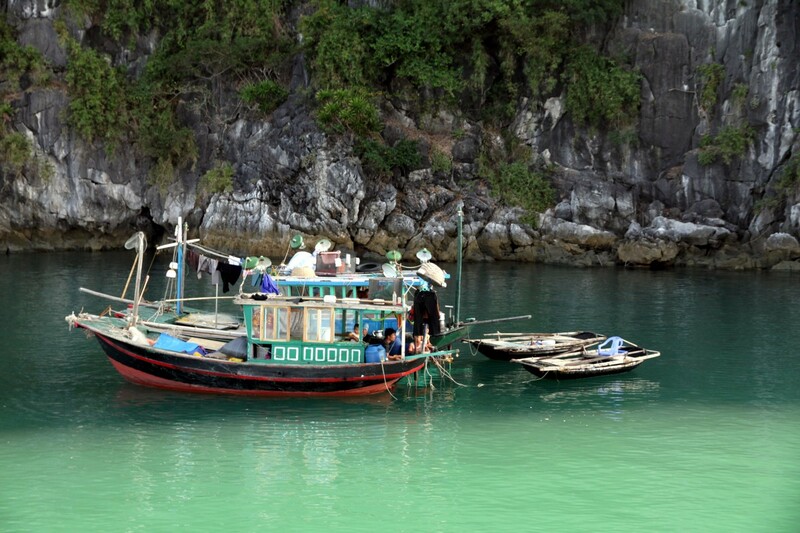 She comes on the boat in the morning to sell the wares and then goes to school in the afternoon! All boats sold fresh produces and we saw the coffee boat selling freshly made coffee. Back to hotel for breakfast, to pack and join our mini van again. 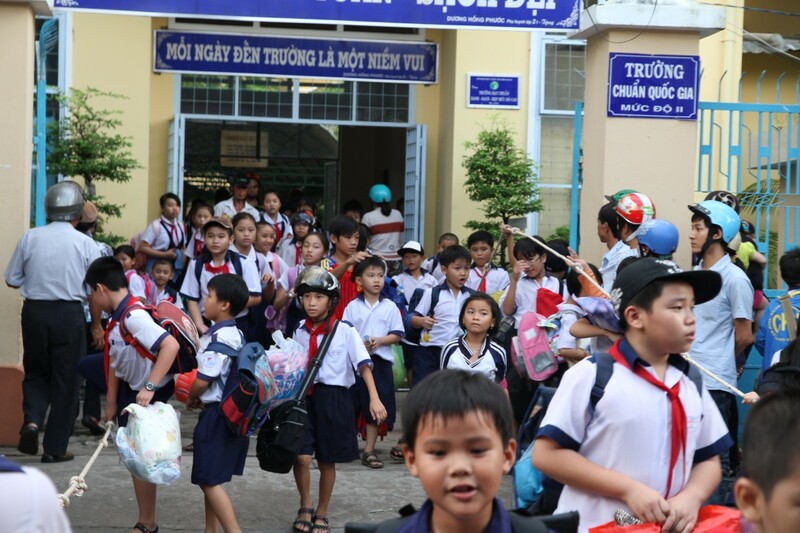 We had decided we wanted to get to Riach Gia early as Niamh was leaving us today and heading off to Cambodia so needed to get back to Saigon early. We stopped at the Portisomoron Pagoda – the only Cambodian Buddhist pagoda in Vietnam. 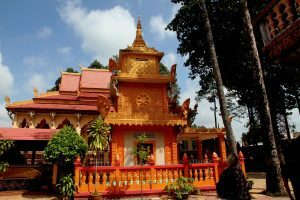 It was very ornate and had many young monks in yellow sitting around the grounds. The main area was very dirty and we wondered why the monks whom we saw smoke and use mobile phones were not cleaning it up instead of sitting around? Just as we were leaving they started to sweep it with two big witches brooms one in each hand doing a sweeping movement to brush everything in one direction – it seemed a very efficient way of sweeping an area. Tom did show us how to light incense sticks properly and how to bow to the Buddha. We also saw a sake tree and another tree with beautiful flowers (not sure of name) that women are given when in birth to make it easier? We arrived in Riach Gia at lunch time and Tom took us to a local seafood restaurant where we had squid and crab – very fresh as they were killed right in front of us. Again too much food so we gave some to Tom and and our driver. Then to hotel Hoa Binh where it was time for goodbyes to Niamh and Tom. Very sad as we live on the opposite ends of the world! After they had gone we relaxed for a while and then went walking to fine a restaurant to eat at later and also to get our bearings and to try to find somewhere to have a drink of wine. Both restaurants on shore line big, clean/sterile and pleasant but did not serve wine. We decided to walk to the city center – our hotel was in a really good spot close to shore, the river and centre of town. We walked to centre of town and use ATM and then walk around the square and home. As we walked I spotted a shop that appeared to sell brandy etc. so I stopped and low and behold there were about ten different types of wine – Australian, Chile, French and South African.Yah!!! All priced at 350 dong ($18NZ) a bottle but needs must so bought two bottles in case there was no wine in Phou Quoc Island our next and last stop before we fly back to NZ. 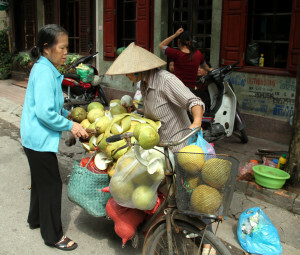 Marcia also purchased some Hanoi Vodka ($5US). 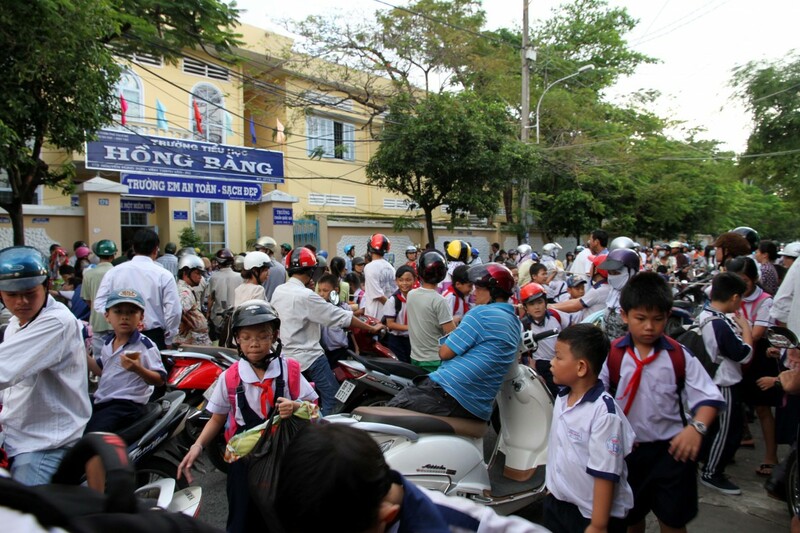 on our way back to the hotel we noticed the road ahead absolutely full of stationary motorbikes/scooters, we assumed there had been an accident but it was end of school time and hundreds of parents were waiting to take their kids home on the back of their bike. It all cleared with 15minutes of the final bell. We were both not really hungry and also it started to teem rain so decided to give dinner a miss and munch on crackersI tried the Australian 2003 Cabernet sauvignon later that afternoon and it was really lovely, it was the first decent wine I have had since I arrived in Vietnam..
Up early for breakfast and taxi to airport for flight to Phou Quoc. Really happy with hotel, they we so helpful, nothing was too much for them, they made us early breakfast and called a taxi for us. Flight over great and meter cab to beach club was fine. When you check your luggage in they give you a luggage tag that you must present when you pick it up at the other end – though the Vietnamese airline did not tell us this before hand. So on arrival Marcia could not fine her luggage tag so we had to wait until all passengers had gone to be allowed to collect the bag and leave! We arrived at half passed eight to the Beach Club to find a little slice of heaven by the sea just the right place for three days of R&R. The rest of the day was spent in sheer bliss – sun, swimming, sleeping and reading. Our room had a beach view and was superb. The food in the little restaurant was also good and I discovered they had cold white Australian Chardonnay – Yah. 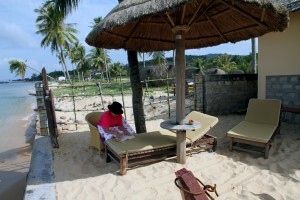 Met lovely couple over sun-downers from Bangkok he was Dutch and she Taiwanese and both spoke English perfectly. Very interesting to hear their views on Thailand and Asia as a whole. 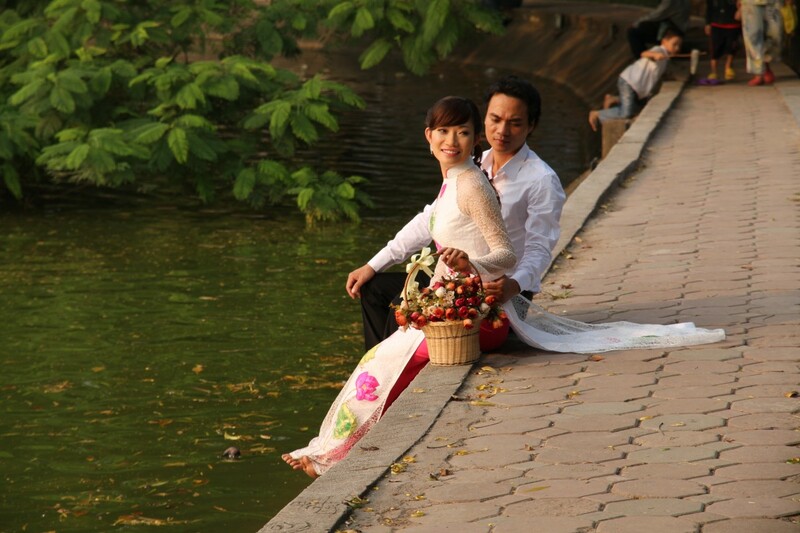 Both of them travel to Vietnam for their work on occasions. 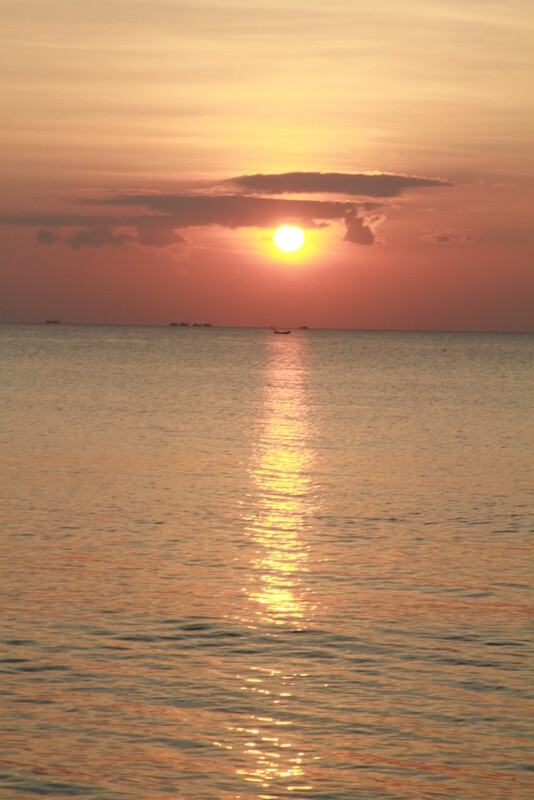 Day 23 & 24 – Two days of R&R before heading home! 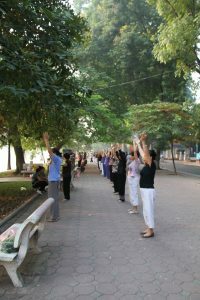 We soaked up the massages, nail painting, sun sleep, wine & food and then flew hack to HCMC to catch our flight home to NZ. What a fantastic adventure! Forgotten World Rail Cart Adventure – riding the rails in a golf cart! 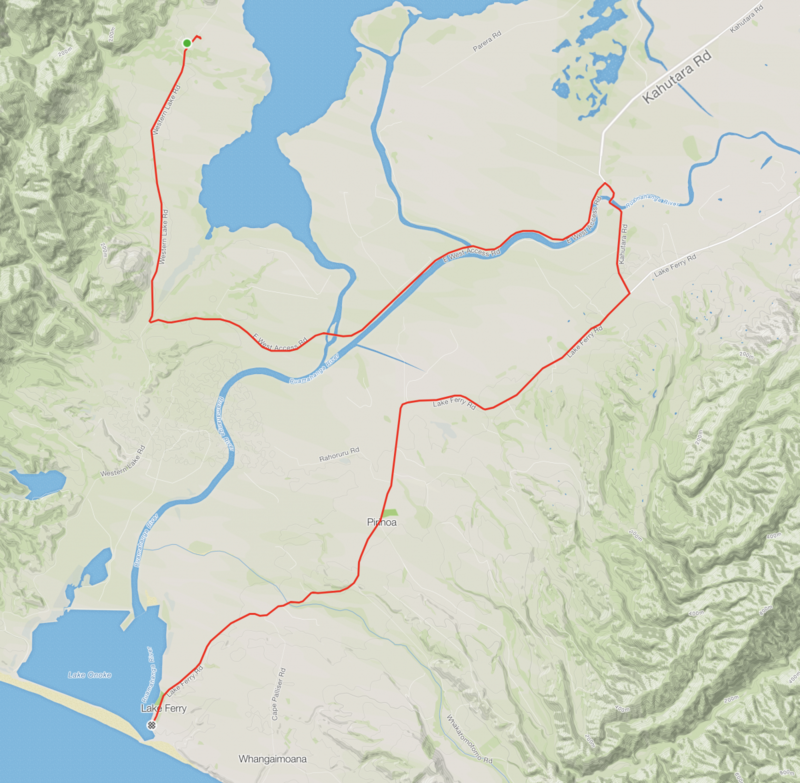 West Coast Wilderness Trail on my E-bike! 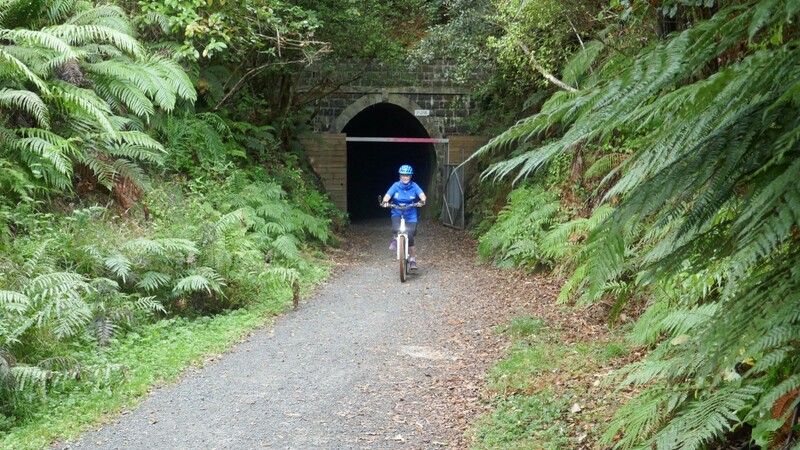 Through forests, water races, lakes, past Tasman Sea & historic buildings!